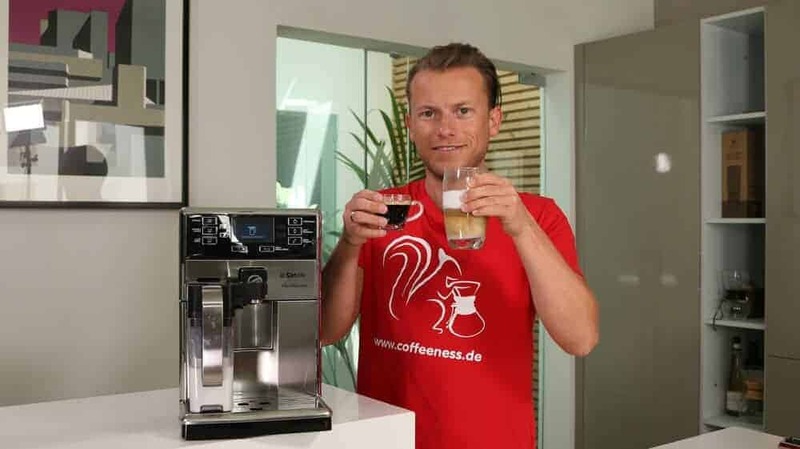 Coffeeness and automatic espresso machines go together like Arne and good coffee. Therefore it was high time to update this ultimate guide on how to find the best espresso machine. This guide will give you all the latest information about the models featured on my blog during the last few years – and I mean all the information. It is going be long and it is going be thorough. You will find all of the espresso machines that won the tests in all the different categories, along with information about how they are built and how they work. 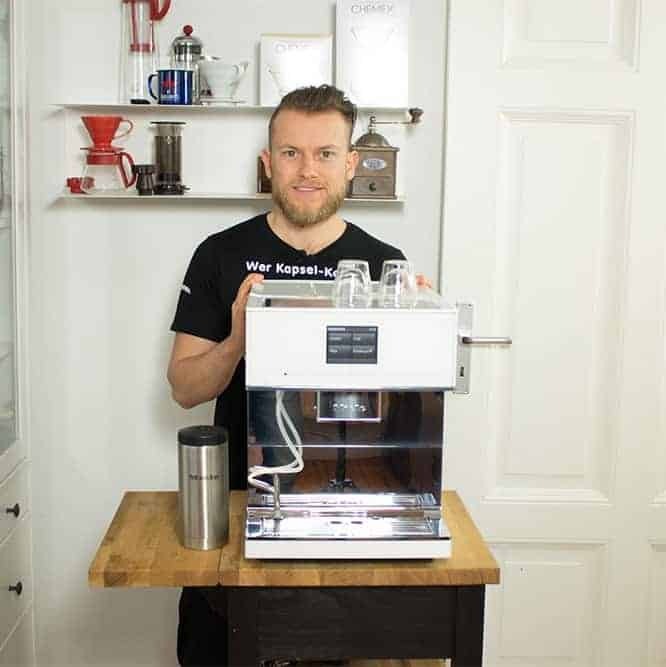 You will also learn how to clean your machine, as well as some extra tips only a seasoned barista can teach you – the kind of information you will not find in any user’s manual. What Drinks Can an Automatic Espresso Machine (Really) Make? What Parts of an Automatic Espresso Machine Are Especially Important? 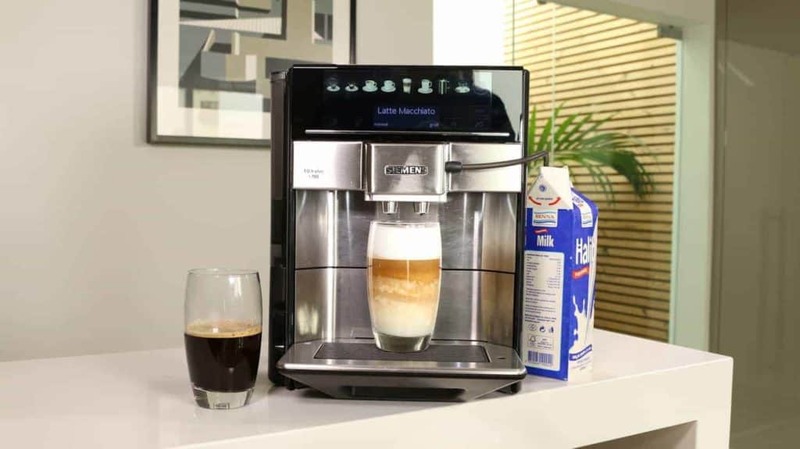 The Grinder Thermoblock or Boiler?The Brewing UnitCappuccinatores and Milk Frothing SystemsThe PumpControls, Displays and Touchscreens“Must-Have” FeaturesDouble FeaturesWater Filter: Yes or No? Set the Water HardnessAdjusting the Grinder CoarsenessAdjusting the Amount of Ground CoffeeAdjusting the Amount of WaterAdjusting the TemperatureAdjusting the Cleaning Program“Adjusting” the Beans: Which Coffee Beans are Best for Automatic Espresso Machines?“Adjusting” the Milk: What Kind of Milk is Best for Automatic Espresso Machines? Why So Fussy?Cleaning the Brewing UnitCleaning the Bean ContainersCleaning the Coffee Grounds Tray Cleaning the Water TankCleaning the GrinderWhat Cleaner Should I Use? Does Using a Water Filter Mean I Can Decalcify Less Often? First, let’s cover the basics so we are all on the same page. I will be using the term “cappuccino maker” interchangeably with “super-automatic espresso machine” because it is way shorter to type and essentially describes the same thing: a machine that makes espresso-style coffee beverages, usually with some kind of foamed milk or milk substitute (soy, almond, oat, etc.). Also, in some cases I will only use the term “espresso machine” when referring to super-automatics because this article focuses on these types of machines. With that out of the way, let’s dive right into the best machines on the market today. No matter how many machines I test or what innovations the manufacturers include in their new machines, three particular machines always seem to overshadow the competition in three price classes. Basically nothing in the entry-level class can outperform the DeLonghi. Sure, you will have to make a few compromises in terms of features and performance, but for such a laughably low price, you really can’t ask for more. You can learn more about the DeLonghi Magnifica S ECAM 22.110.B here in my review. You can check the price for it here on Amazon.co.uk or here on Amazon.com. 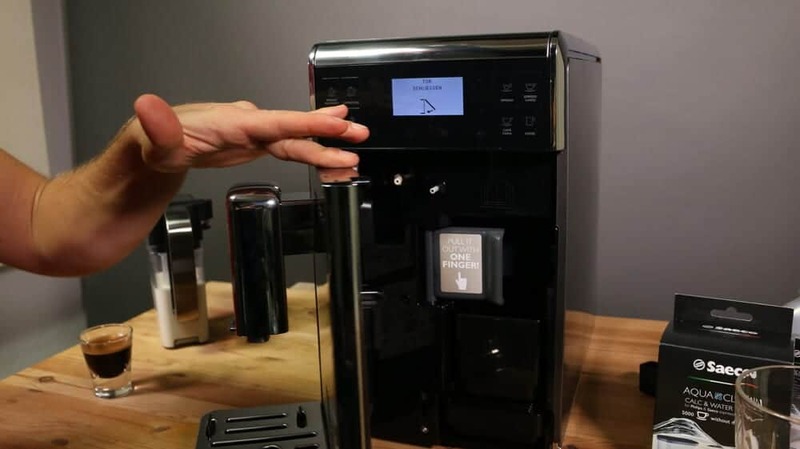 If you move from the DeLonghi to this Melitta machine, you will have to pay more than twice the price, but it sets a benchmark that lets you know what automatic espresso machines can actually do. 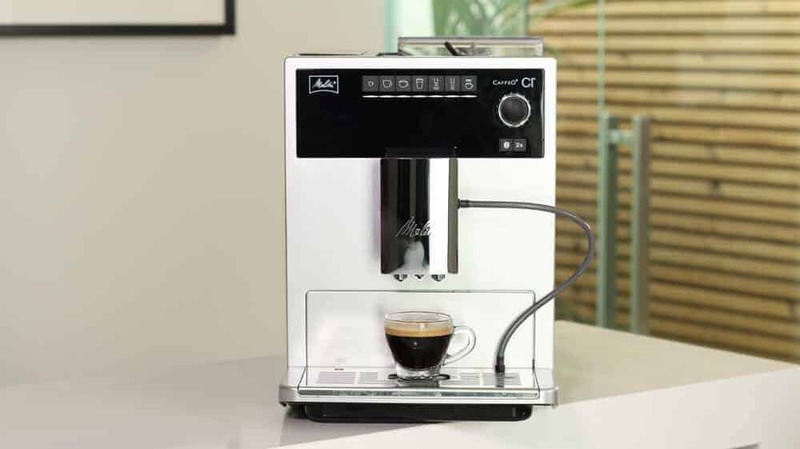 It is quiet, small and quick, plus it has two bean compartments and makes great foamed milk – what more could you want? OK, maybe a few more settings would be useful, but that’s about it. 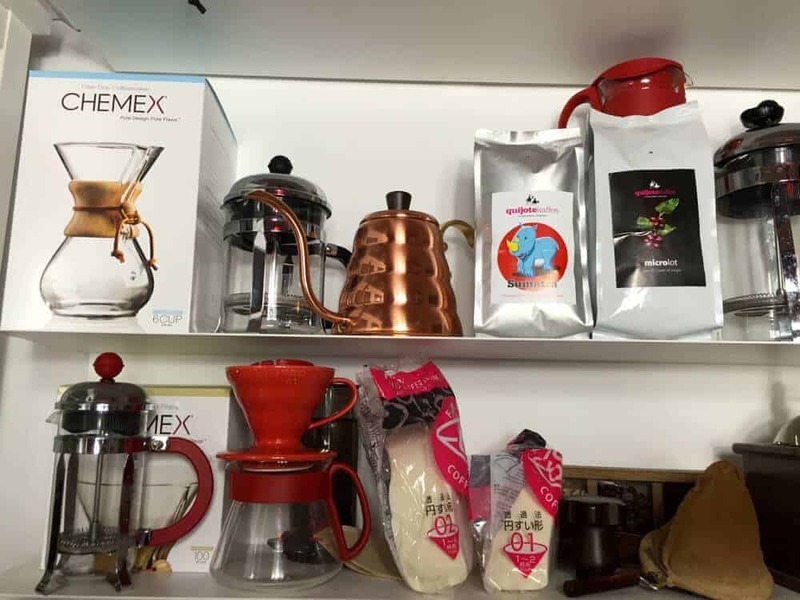 This review of the Melitta Caffeo CI will give you a good overview. It is only available in the UK: Amazon.co.uk. So far, no challengers have been able to knock the Siemens EQ.9 from its champion podium. No other machine is quieter or has better features, nor had such conclusive test results – at least not for me. Being able to control this machine through an app is just the cherry on the top. Even though you will need to budget more than a grand to buy it, it is still worth it. It is only available in the USA: Amazon.com. 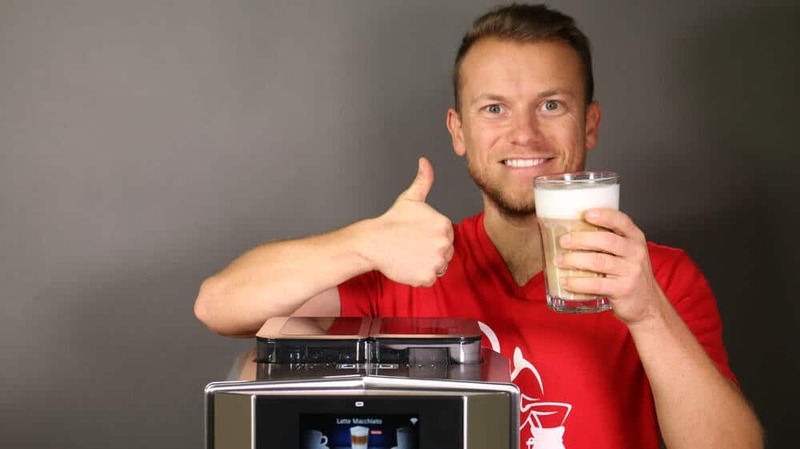 As you will often see throughout this review, there is no single, ultimate automatic espresso machine whose splendor will bring tears of joy to everyone’s eyes. DeLonghi Magnifica S ECAM 22.110.B Review: Best price-performance balance among inexpensive automatic machines. Melitta Caffeo Solo Review: A bit tiny, but still good and classy. 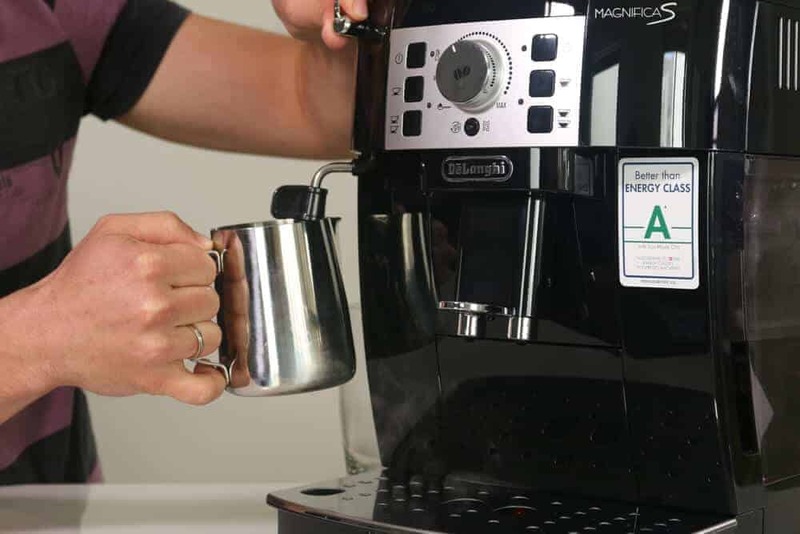 Melitta Caffeo CI Review: The mid-range category winner. 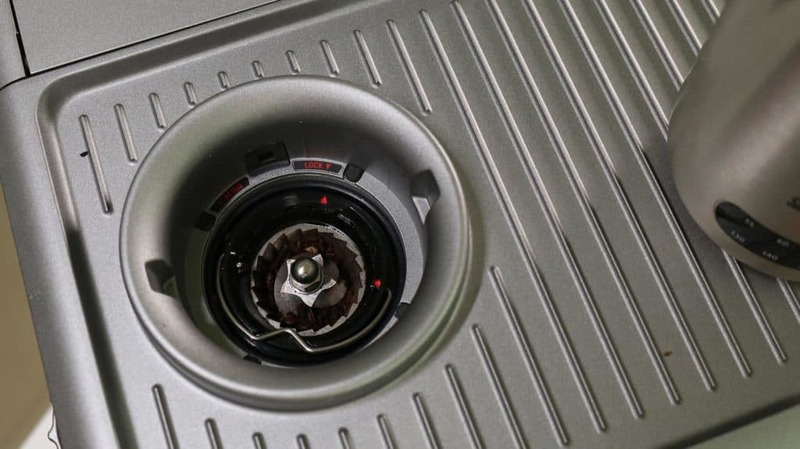 Gaggia Anima Prestige Review: Great mid-range benchmark machine for price and performance. Saeco PicoBaristo Review: Extremely classy for its price. 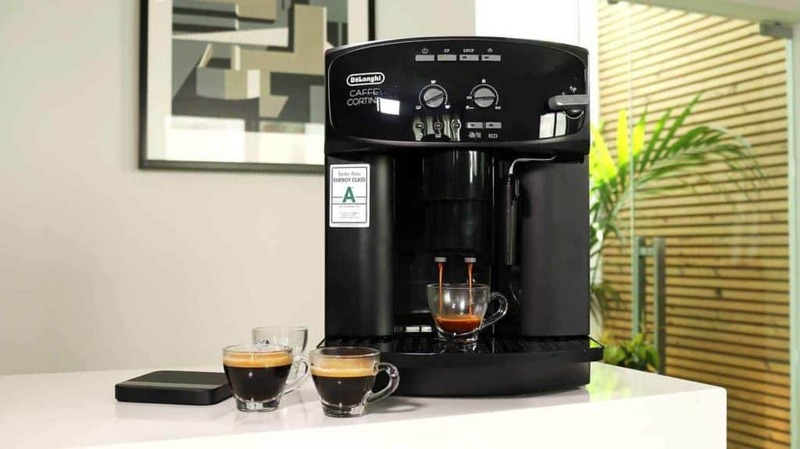 Delonghi Caffe Corso ESAM 2900 Review: A good price-performance balance. Miele CM 6350 Review: Smaller than its big brother, but still great. KRUPS EA8108 Review: Average build quality and drinks. DeLonghi ESAM 3300 Review: This machine had functional flaws. Jura Impressa C60 Review: An expensive flop through and through. Every machine that I have listed here will come up for further examination later in this guide. As I’ve mentioned, looking closely at both the good and the bad machines can be useful in helping you make a decision. If you want detailed reviews with all the bells and whistles, you should check out the full reviews for the machines you are interested in. 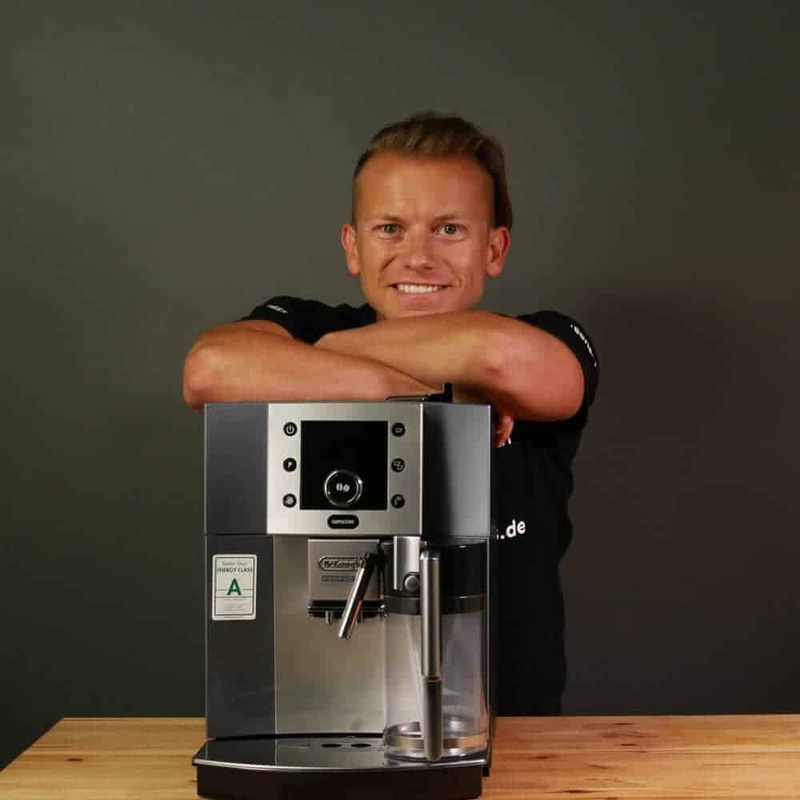 Super-Automatic Espresso Machines by Price Classes – What Makes the Price Difference? For those of you who always first consider cost, let’s have a closer look at prices. We will see which machines and manufacturers are setting the price expectations, which models will give you the most bang for your buck, and what you should expect to get from each price category. The fact is, if you are not willing to pay at least $250 or so, you will not find a super-automatic espresso machine that is worthy of the name. However, you can find something pretty good for less than $350. You may also occasionally come across a sale on Amazon or another retailer that is selling a no-name model for about $200. Run away! A cappuccino maker is a deceptively simple-looking machine that is actually quite complicated, and it should meet certain standards for materials and functions. You just won’t get that for such a cheap price. 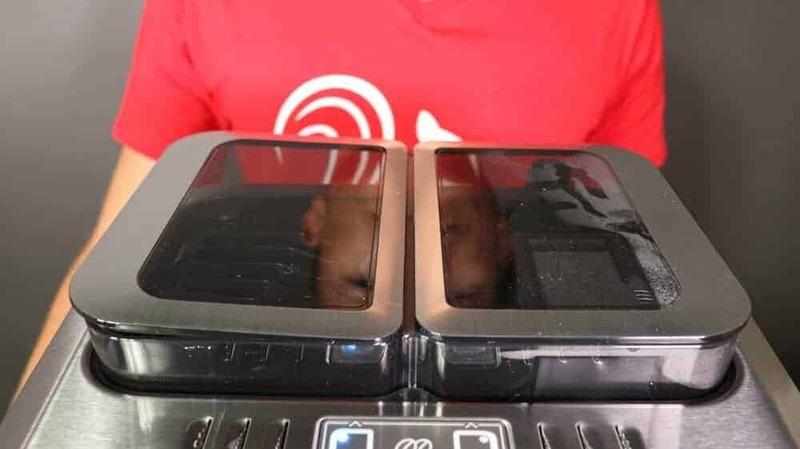 However, when you pay just more than $300, you will start getting somewhere – and you are likely to trip over any number of DeLonghi machines at that price. The Italians at DeLonghi have really made a name for themselves in the entry-level category by offering reasonable performance at an even more reasonable price. You can check the price for the DeLonghi Magnifica S ECAM 22.110.B here on Amazon.co.uk or on Amazon.com. Still, at this price you need to take a really close look at the test results and reviews. With DeLonghi, there is a thin line between a top machine and a flop machine, and the model line name will only help you so much – you really need to do a bit of homework here. The two main DeLonghi series are the ESAM and ECAM lines. Both lines have several machines and model numbers, which are often only distinguishable through small differences. Nevertheless, my tests have shown that the ECAM series is always the better choice, at least in the lower price class. The DeLonghi Magnifica S ECAM 22.110.B is proof that you can get a highly functional machine that makes good espresso for around $350. The DeLonghi ESAM 3000.B, on the other hand, sells for about the same price but didn’t perform as well. I go into more specific details about these points in the advice section of the guide. However, what about the competition? How do things look there? Well, pretty bad, if we are being honest. 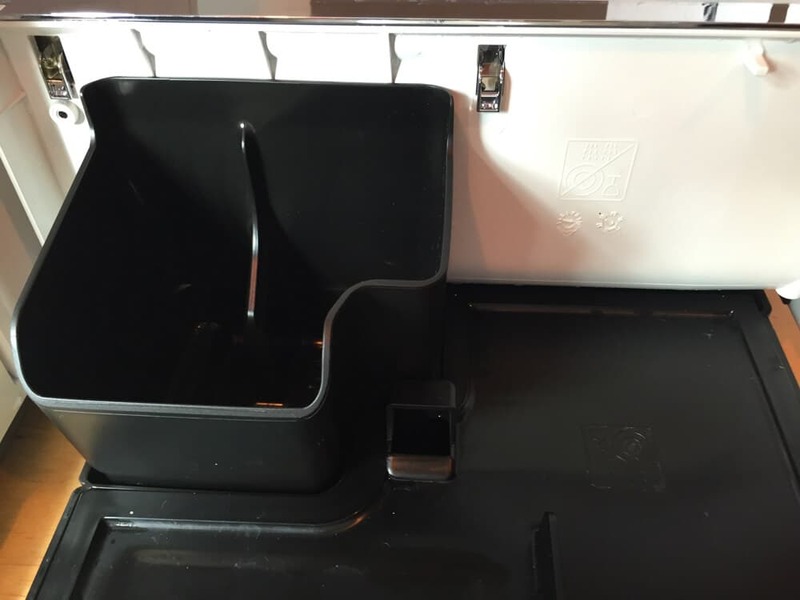 The test of the Krups EA8108 showed that manufactures can really get carried away with using plastic and allowing for “imprecise performance,” which results in only mediocre coffee. When that’s the result, it is probably not even worth buying an automatic espresso machine. However, there is still a clear contender, and it is Melitta. The Melitta Caffeo Solo review was generally a treat, both for the eyes and for the palate. 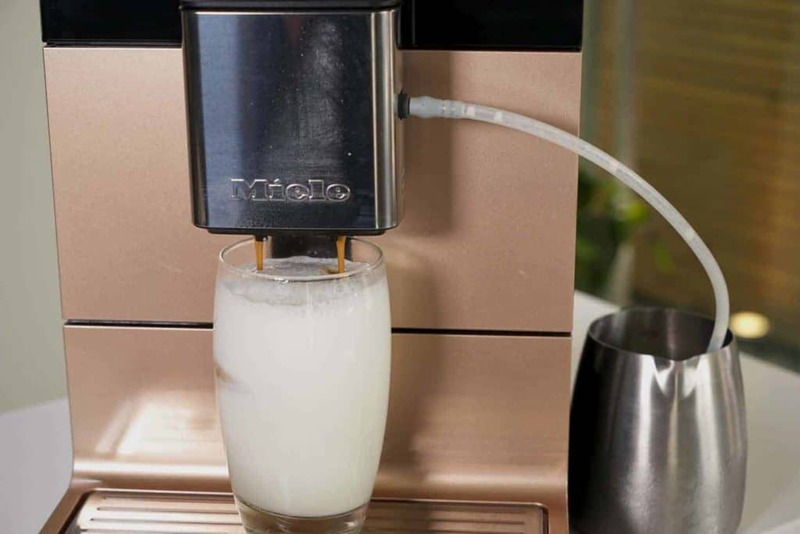 There’s a big “but,” though: The entry-level model of the ultra-chic Caffeo Solo completely does away with a milk foam system. That may not bother coffee purity fundamentalists, but – let’s be honest– the typical owner of an automatic espresso machine will probably want foamed milk. I’m sure of it. One machine that I have not yet tested, but is well known among “my people,” is the Philips 3000 Series HD8827/01. According to reports, it does have some idiosyncrasies, it keeps things very basic, and it is generally a pretty weak contender. What’s more, it is rather noisy. Even if you don’t think the noise is a problem now, it will probably eventually start to bug you! As a rule of thumb, though, we can say that, in terms of functionality, the cheaper models actually are barely behind their more expensive competitors. At least if we are talking about getting coffee at the “touch of a button.” After all, the ability to do that actually has barely anything to do with price. However, the cheaper machines will always have to admit defeat when it comes to appearance, the quality of the different materials, the range of features, and the number of baubles on the machines. Those are aspects you can’t fake, and that is something that you can’t really change. I will have more to say about all this in the guide of the best espresso machine for less than $350 (currently only available in German). I also go into more details in this video (in German). By adding just $100 or so to your budget, you will notice right away that the machines already look a lot better physically. Sure, there are still lots of plastic parts, but at this price range, the manufacturers make more of an effort to hide that fact. However, that price difference won’t necessarily get you huge upgrades in terms of technology. Usually some other factor – whatever it may be – is the deciding factor for many buyers. That is why you should have a look at the DeLonghi ECAM 23.420 review if you are a fan of machines with displays. 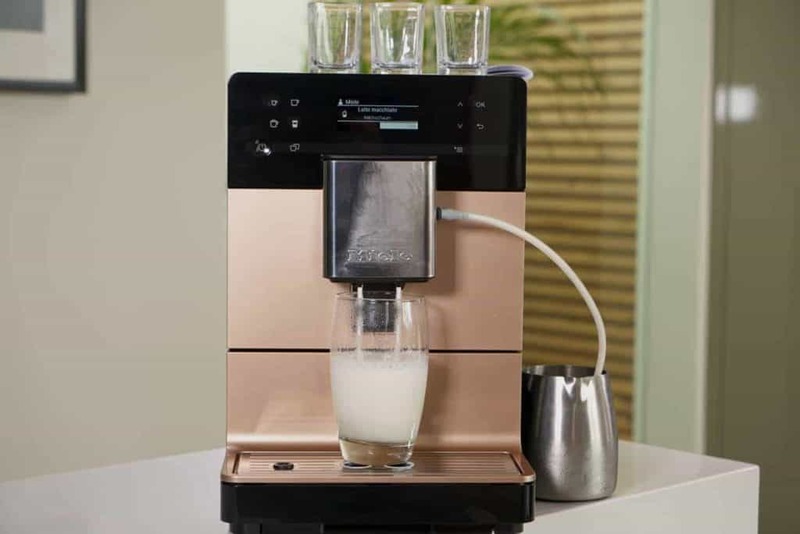 Or, if you want a cappuccinatore milk foaming system, check out the Philips HD8829. 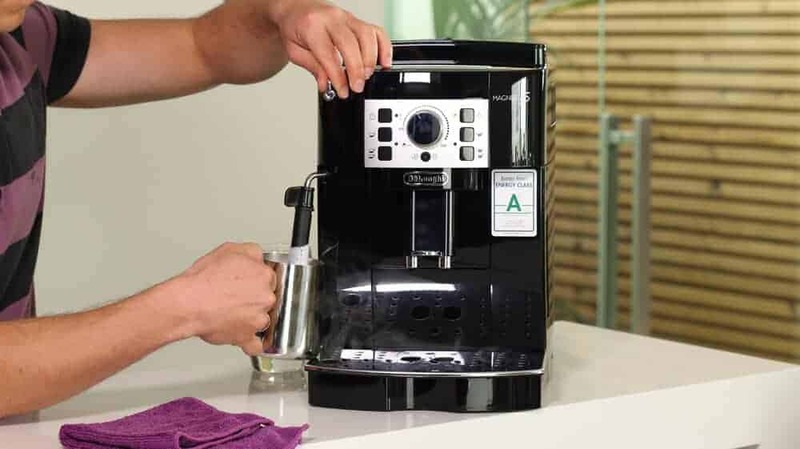 The DeLonghi ESAM 2900 is more proof that, even in this price class, the Italians are almost unbeatable in terms of performance for price, even though there is actually a wider selection of manufacturers and brands to choose from for this price. Siemens also occasionally throws its hat into the ring in this category. Our Siemens EQ.3 review clearly shows that the EQ series can only really compete in this price category with a bare-bones machine that is only fitted with the most basic options. 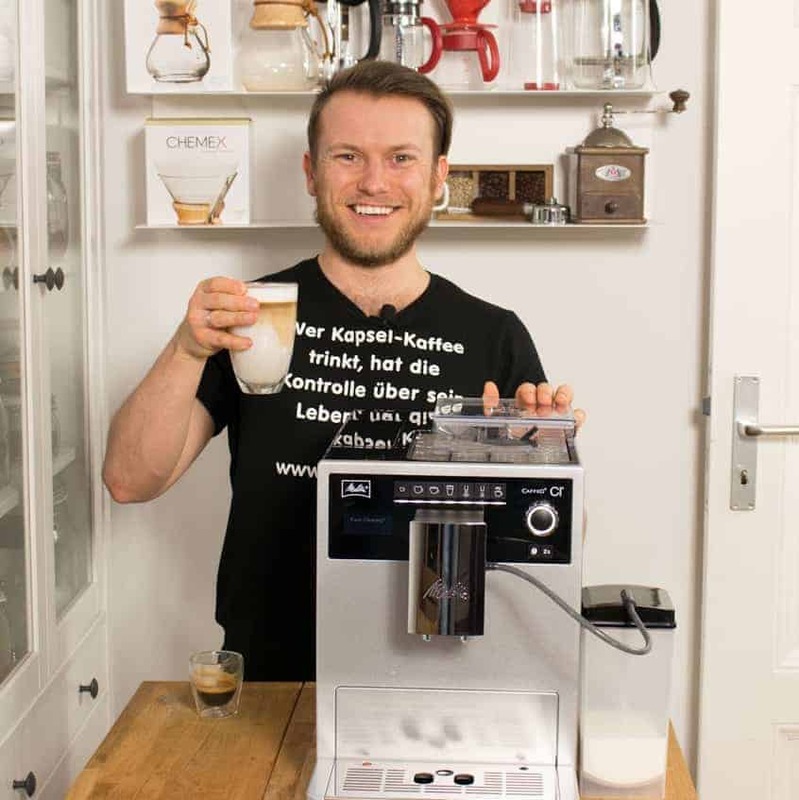 You can get a more thorough overview in the guide of the best cappuccino makers for less than $600 (currently only available in German). In the end, I’m still not sure if jumping from a $350 machine to a $500 model is actually enough. I almost think that the price differences aren’t always justifiable. In other words, I’d say you should either pick a cheap machine for around $350, or if you want something better, go right ahead and double that price to improve your possibilities. This is where things start to get really interesting. There is more variety in terms of functionality, build quality, materials and performance. Of course, there is also still plenty of plastic, but you will start to see more and more stainless steel as your budget increases. Stainless steel not only looks classy, it also makes these machines more sturdy. Additionally, you will find more gimmicks on these models, which is good news if you are a fan of playing around with different settings. It is also good news for fans of milk foam. We have had it in our office for more than a year and are very happy with it! Almost all cappuccino makers that cost around $700 will have an integrated, automatic milk system. Almost! 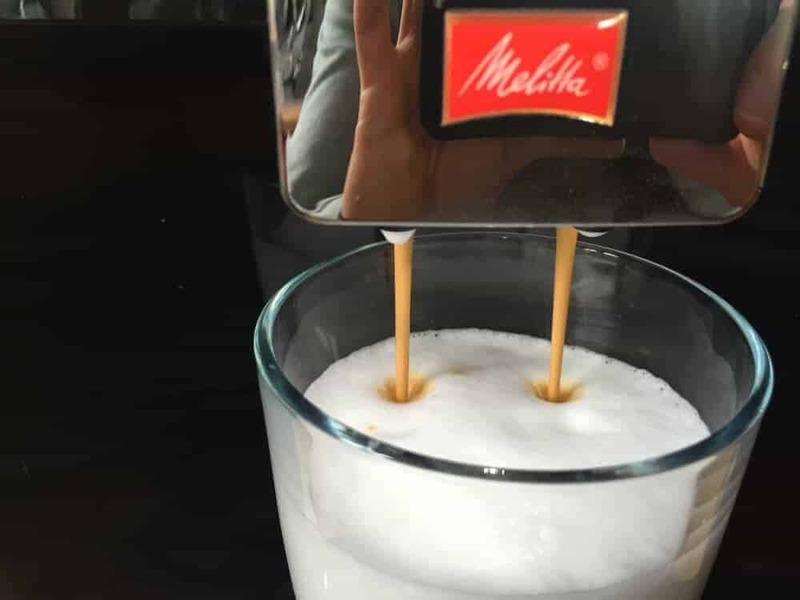 Interestingly enough, the best machine in this price class – the Melitta Caffeo CI – costs less than $700 and “only” comes with a cappuccinatore milk foaming system, but at least it comes with a milk container. Nevertheless, it really won me over, and it sets absolute standards for the mid-range class. The Melitta Caffeo CI is pretty compact, very quiet, really quick, and even has two bean chambers so that you can store and have two bean options for your beverages – for example, if you want regular and decaffeinated bean options. Other automatic machines in this category can also hold their own, though. For example, some have water filters, special energy-saving programs or even touchscreens. Sure, at the end of the day it’s all about the coffee, but the easier the machine makes it for you to get that coffee, the better. There have also been some significant innovations in this price class over the last year. The DeLonghi ESAM 5500 is getting a bit long in the tooth, relatively speaking, but the machine itself remains a best buy. The Philips HD8834 review (currently only available in German) also came out a while ago, but the machine still feels young and spry. However, on the higher end of the pricing scale, there are some real duds. It is becoming clear that DeLonghi is quickly losing steam in the race against other competitors to control this price class. The DeLonghi ESAM 3500 review showed that quite clearly. Some of you are probably wondering why I have not mentioned the brand Saeco yet. Along with Melitta and the others, Saeco clearly belongs among the top dogs of the mid-range and upper-class machines. There is a simple reason I have not mentioned it: I want to talk about the Gaggia Anima Prestige in more detail because it is a reference model that has continually delighted me ever since the very first time we tested it at Coffeeness. The reason that the Gaggia Anima Prestige wasn’t on the winners’ podium alongside the Melitta Caffeo CI was mainly because the Melitta machine did a bit better in our year-long office test and was just a tad more suited for frequent, long-term use by several coffee drinkers. However, when it comes home use, the Gaggia Anima Prestige is a true insider tip. I can very comfortably recommend it to anyone looking for a great combination of appearance, taste and “whisper-quiet” operation. You can find the Melitta Caffeo CI here on Amazon.co.uk. The next giant leap in terms of functionality comes when we look at cappuccino machines that cost around $1,200. You will probably have to pay at least $1,000 if you want extremely high build quality and a ton of settings. This price range also reveals a favorite debate topic among our Facebook group members concerning espresso machines: Siemens or Jura? This debate can get a bit heated, so I would rather not get too mixed up in it, at least not in this guide. However, I will say one thing: The Swiss folks at Jura have massively disappointed me in the past – just check out my review of the Jura Impressa C60 and you will see what I mean. Jura’s brewing unit is still almost always built-in, and a built-in, non-removable brewing unit is simply a no-no. What’s more, Jura loves to talk as if it invented the automatic espresso machine, but then they don’t actually deliver the goods. However, my test and review of the Jura E8 showed what the company is capable of creating. That machine was really well-thought-out – but it is still just one model. The EQ series from Siemens, on the other hand, once again gave us great results, real innovations and simply excellent machines. The EQ series really gets exciting around $900 or so, and the Siemens EQ.6 is practically a blueprint for success in this price class. An excellent, quiet machine for super espresso. At this point, I must once again mention the Melitta Caffeo CI – in particular, look at the higher-quality model for around $1,100. The difference in quality compared to the cheaper models is actually negligible, but that doesn’t do anything to change my opinion of this machine. The Bosch machine is surprising mainly because of its manufacturer, which very rarely shows up in this category. It is also nearly identical to the Siemens EQ.6, even though it is just a tad more complicated and its appearance gives off a bit of an old-school vibe. The Miele CM 5500 was a brand-new feature at the 2017 IFA consumer goods show, and it immediately grabbed our attention due to its design. The minimalist look works well in basically any kitchen, although it also means dealing with other reductions here and there. It certainly has everything you need, but it is just not as luxurious as you might expect from a machine in this price category – just look at the milk system. 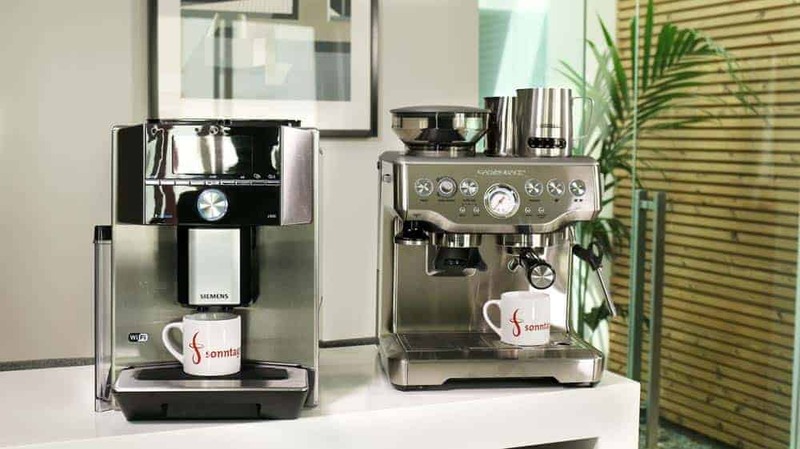 Of course, we can’t forget to mention Melitta here, as well, with its small “Barista” model, nor can we exclude Saeco, with its equally small “Baristo” model. The Melitta Caffeo Barista test was just as successful as the Saeco PicoBaristo test. Both machines are better than you would expect for such a relatively inexpensive price. If you are paying more than $1,200 for a cappuccino maker, you are mainly doing it because you want it to look good – and maybe to show off a bit. However, you are just kidding yourself with every other justification! Once you have leaped over the $1,200 hurdle, there aren’t any more technical innovations that you will get in return. Sure, everything is made better and simply looks a lot nicer. Sure, you will probably get one or twelve more settings and options to play around with. I will admit that it certainly would have been noteworthy if the machines in this price class had not done a good job. I have definitely awarded lots of stars to many models in this category. However, the only machine that got the absolute maximum number of points was one of the “cheapest” machines that I tested in this price range. I didn’t have any qualms about the Miele CM 6350 costing a bit more than $1,200 because, even though it has been around for a while, it is still worth every penny. You can take a closer look at the Miele CM 6350 here on Amazon.com. Nevertheless, I found my test winner when I reviewed the Siemens EQ.9 Connect. It really hurts to pay more than $2,000 for it, but if this machine doesn’t make the best coffee you’ve ever had, you are probably doing something wrong. Both of these automatic espresso machines are enduring favorites at Coffeeness. They make great coffee and great milk foam, and they also look fantastic. Additionally, many of you could hardly wait for the review of the Saeco Xelsis after you saw it at the 2017 IFA show. This machine actually took a step backward in terms of digitalization. It doesn’t have an app, but it does have very intuitive and precise touchscreen controls on the two more expensive models. The Xelsis absolutely won me over, especially because there have also been some significant discounts on the machine in the meantime. The price was also my biggest critique, as I thought it was simply overpriced when it came out. However, now here’s the bad news: Generally, you can forget about big discounts and rebates in this price category. The manufacturers know why you are buying these machines. They are not for Everyday Joes – they are for people who see an automatic espresso machine as a status symbol. No other machine is quieter. This is the machine I would like in my own kitchen. Here’s the real deal: A lot of the machines that cost more than $1,200 are just bluffing. They offer smoke-and-mirrors features that have very little to do with what real coffee lovers value. After all, an automatic espresso machine is a kind of compromise in and of itself. For that same price, you could instead buy around 75 pounds of the best coffee money can buy, or you could also get a really good traditional espresso machine and a grinder, without making any compromises or sacrificing quality. However, latte machines are convenient and easy, so you need to consider what matters most to you. To finish up this discussion about prices, I must add that all of the Amazon prices mentioned here were current as of publishing, but they can certainly change. Also, some of the machines that I tested may eventually no longer be available, they may become available only as used models, or they may not currently be available in some areas. That can happen to any of the machines in this guide. So please don’t get up in arms with me if Model A or Model B suddenly isn’t available anymore. However, I do regularly check to see if these machines are still available, and I must say the tried-and-true machines are surprisingly steadfast. The oldies but goodies are almost always available because the machines in this category are high-quality, making them “future proof” in some ways. 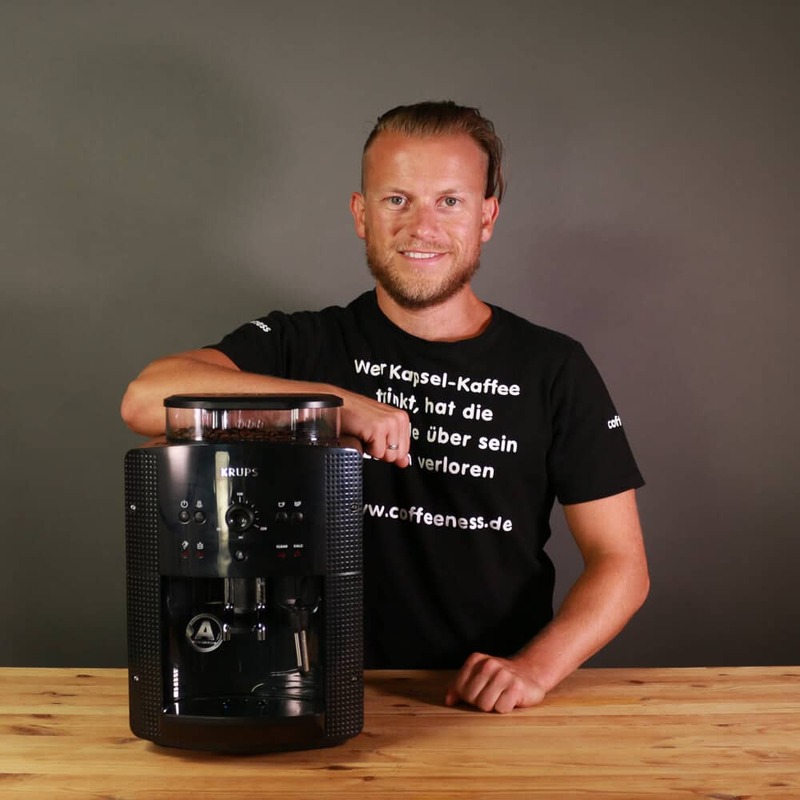 Speaking of quality: Now that we have seen the winners in the different price ranges, I would like to present a few automatic espresso machine ratings and winners in different categories based on features and functions. You can decide which features are most important to you. We will also learn a lot about the different factors that you should consider when buying an automatic espresso machine. However, you should rule out one machine right away: The perfect machine that does everything perfectly. Because it doesn’t exist. I know you would probably like a clear answer about what machine you should buy, but it all depends on price, design preferences, your preferred milk system, and any number of other factors. I also continually update this list, so it can certainly change in the future. That’s why it is a good idea to add this page to your favorites and come back now and then to see what is new. 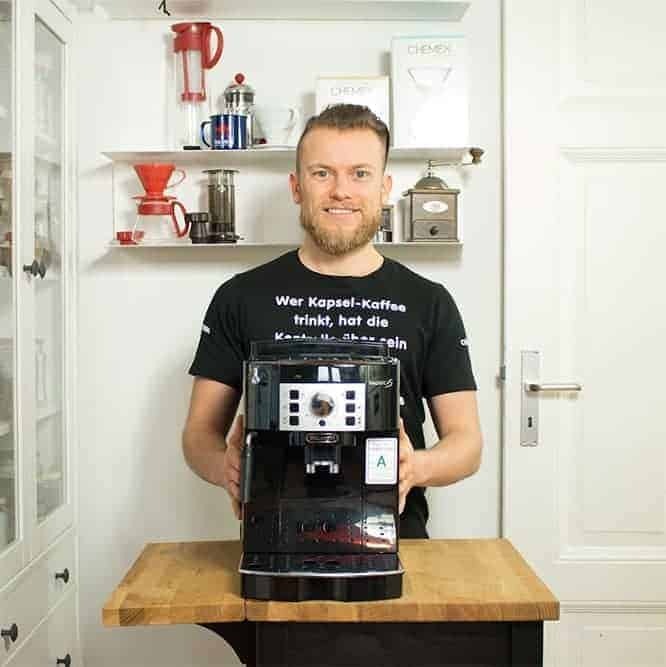 One more tip: Check out our guide (currently only available in German) for super-automatic espresso machines that are perfect for home use! Just because you have a small kitchen doesn’t mean you can’t have an automatic espresso machine. One Coffeeness team member even fit an espresso machine on a super-tiny surface in her super-tiny kitchen. Sure, doing so meant that she had to do without a real stove, but that’s the kind of sacrifices Coffee People need to make. We need to keep our priorities straight. The smallest machines are generally in the lowest price categories. 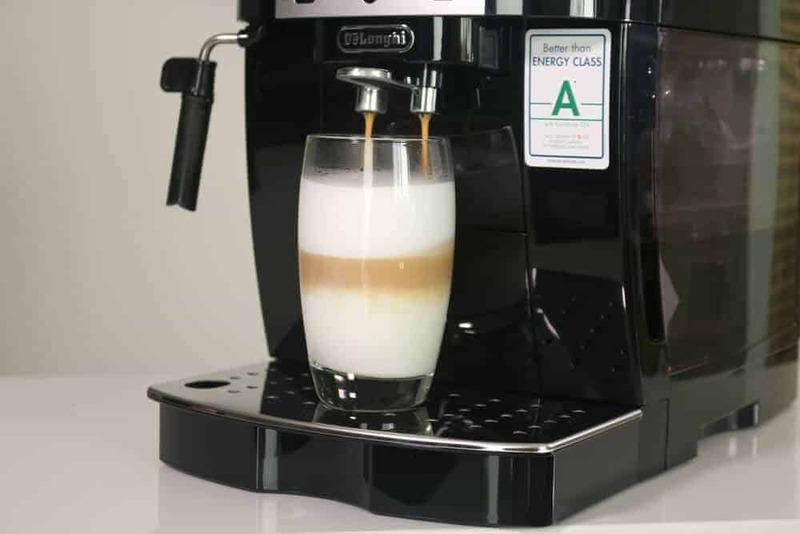 The milk foam system also plays an important role because it takes up more space, whether it has an integrated system or a cappuccinatore. You can find the Gaggia Anima Prestige on Amazon. The simplest machines come with a steam wand for frothing milk, but many of you understandably don’t like to use those. They are more work and are also messier. That’s why if you get a machine with a milk system of some sort, the milk container should always be removable and integrated into the front of the machine. Generally, machines that let you do everything in the front and on the top are the best choices for small kitchens. The Gaggia Anima Prestige cappuccino maker is a true winner here. Practically no other model offers so much high-quality functionality in such a small space. The Philips HD8834 is a bit cheaper, although it doesn’t quite deliver as good of results. The Melitta Caffeo Solo is even smaller, but you will have to do without any milk system. 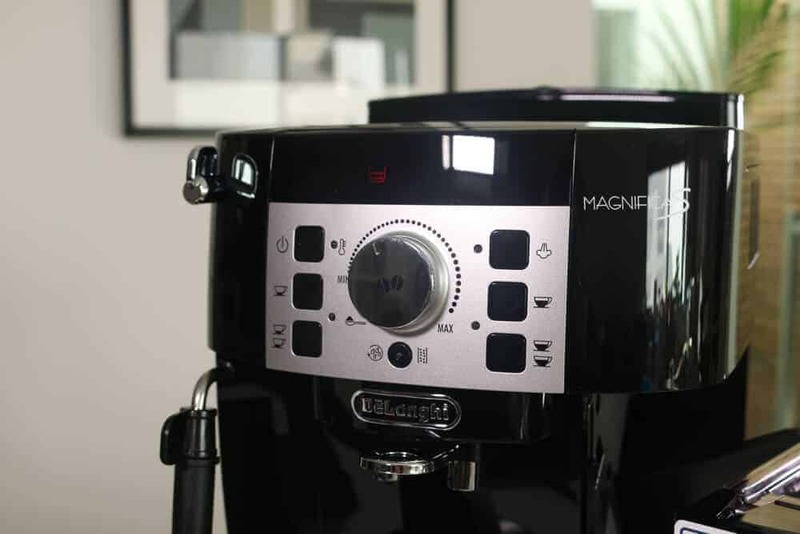 Of course we can’t forget our test winner in the compact class, the DeLonghi Magnifica S ECAM 22.110.B. Buy it now at Amazon.com*. Small and well designed. An automatic espresso machine with something for the whole family. *Note: Only the non-app version is currently available on Amazon.com. The consensus from the Saeco GranBaristo Avanti test was a bit contradictory. After all, who is going to spend more than $1,600 on a machine, to then put it in an ultra tiny kitchen? Still, that doesn’t change the fact that this machine is really compact (and good). 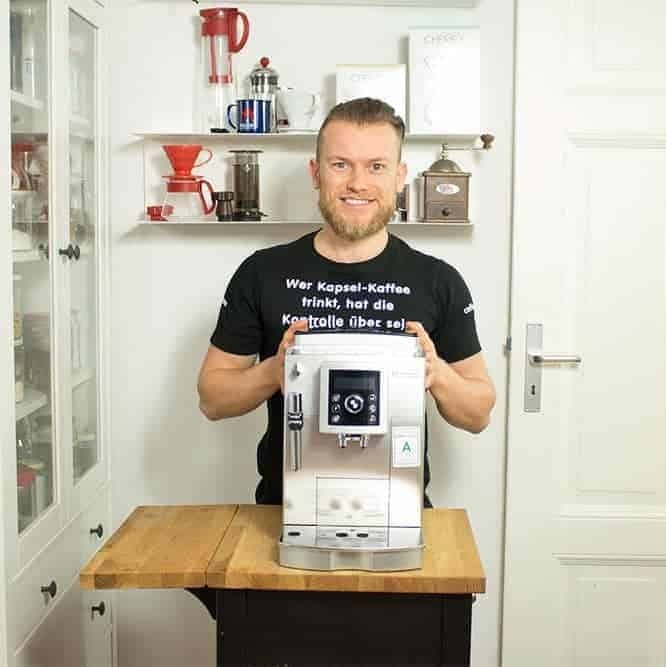 For more information about these compact machines, check out my guide to automatic espresso machines for singles (currently only available in German). After all, single-person households are more likely to have a small kitchen, right? There’s nothing quite as soothing as being jarred awake by someone banging around in the kitchen to make coffee, right? Yeah, not so much, and especially not if you haven’t had your own first cup of coffee yet. Noise may not be the most decisive factor in buying a cappuccino maker, but the more you use your machine, the more any excessive noise will eventually get on your nerves. The grinder is responsible for a big part of the noise these machines make. Ceramic disc grinders are quieter than steel ones, as metal on metal can be quite noisy. The build quality of the grinder also makes a difference, and it matters how loud the pump rumbles and in general how the mechanical parts work together. I have had two test winners in this category. The Siemens EQ.6 700 is surprisingly quiet, and is bested only by the Siemens EQ.9. As a counter-example, I have tested several machines that sound like jet engines. The Jura Impressa C60 and the DeLonghi Magnifica ESAM 3000.B are two that stood out in a negative way. With these machines, you can say goodbye to peaceful, lazy mornings in your apartment, and tough luck for anyone who feels like sleeping in. However, it’s not a huge loss, as these machines aren’t particularly impressive anyhow. All other models are somewhere in the middle of the decibel scale. You will definitely hear them doing their thing, but they won’t wake up the whole house. I must continually bring up this unfortunate topic because you absolutely must thoroughly clean your automatic espresso machine. Yes, you also have to do it more than once a year. Coffee grounds can quickly get nasty, and let’s not even talk about milk, which can happily grow shady-looking bacteria within a single day. That’s why it is generally better, hygienically speaking, to have a milk system made of only a few parts. Steaming wands are designed bent toward the front so that you can easily “flush” them out after every use, clearing them of milk residue. Any complicated machine should have as many removable parts as possible, and they should be simple to take out. That’s not always the case, however. 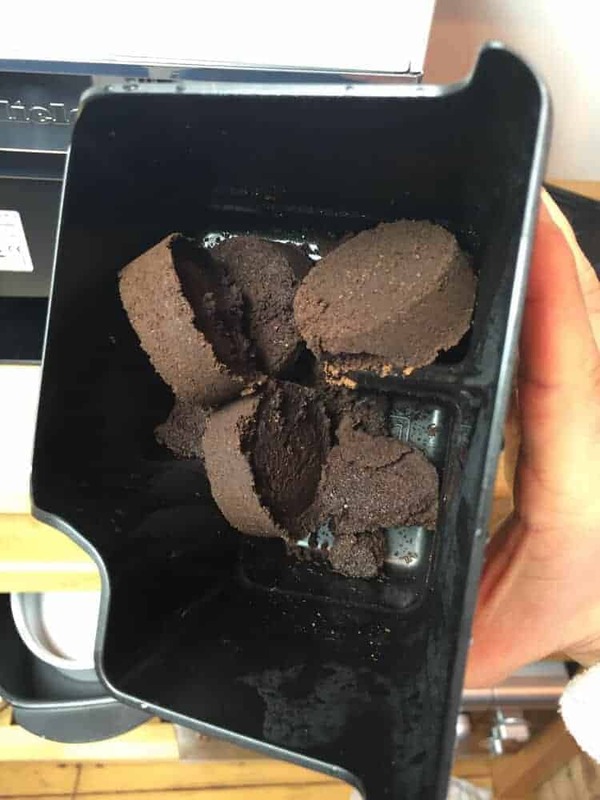 Another issue is when wet coffee grounds get stuck in areas such as the catch tray, the water tank and – worst of all – the brewing unit. This also comes into play in the battle between Jura and Siemens. Jura defenders say that their machines have excellent self-cleaning programs, so it is not necessary to take them apart. My ruling: That is only true up to a certain point. Ground coffee really manages to work its way into every part – including the places that the cleaning jets don’t reach. Therefore, simply taking out the brewing unit and washing it out under running water is easily the better and more convenient solution. Generally, though, automatic espresso machines are all easily cleanable these days. I will give bonus points here to Miele in particular because their individual parts are clearly labeled as to whether they can go in the dishwasher, and it seems like almost the whole machine can. You can see what that looks like in the review of the Miele CM6350. On the whole, manufacturers have been putting more thought into cleaning when they design their new machines. The Saeco Xelsis series, for example, has so-called HygieSteam technology. 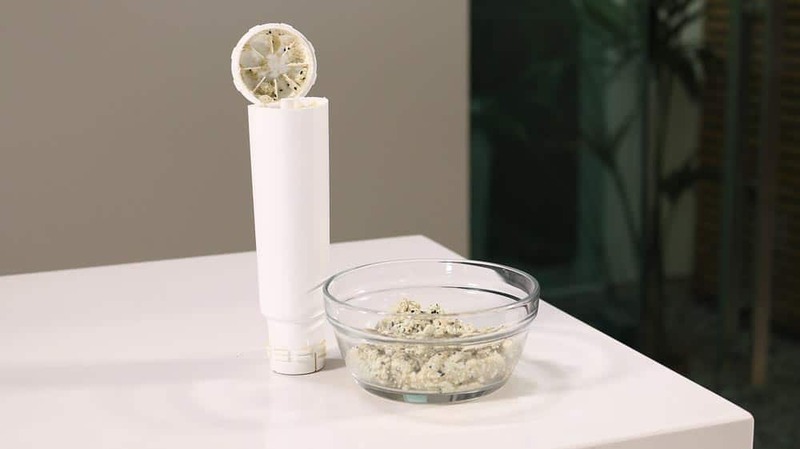 It automatically cleans the milk foam wand immediately after each use. That’s basically the modern version of “flushing” out a steam wand, and it is a great idea. HygieSteam takes it a step further by having its own mount and a separate program to clean the hose. The only dumb thing is that it starts cleaning right away, even while the drink is still sitting under the spout. The only thing you have to do to use the HygieSteam is to put the hose in position and press the button. That’s pretty snazzy. Any step that effectively makes a machine more automatic increases the likelihood that you will be happy with your machine and continue to make good drinks with it for a long time. Here is another quick tip: Before leaving for vacation, ALWAYS run any cleaning programs that your machine might offer. Otherwise, you will come home to find that your cappuccino machine has turned into a kind of terrarium, and that is hardly an exaggeration. To recap: The general winner of the cleaning category is Miele, whether it is the aforementioned CM 5500 or another machine, such as the Miele CM 7500. It’s great fun to get into lengthy arguments about appearance, but it is hard to dispute that ugly plastic boxes simply look worse in your kitchen than machines with a shiny, high-quality, stainless-steel housing. The manufacturers have been paying attention and have taken advantage of our desire for pretty things. In other words, a nice design will also cost you more. There is no doubt that the current winner in this category is the Miele CM 5500. Its minimalist appearance and fashionable colors, along with its high performance, all let it easily get the job done. If we are looking for simplicity, the Melitta Caffeo Solo also naturally gets points, even though buying it means you will have to do without a milk system. The Siemens EQ.3 solves that problem, however. Additionally, yes, Jura does make some real slick machines, and the Jura E8 also performs well. When considering style, you might take issue with my high opinion of the Gaggia Anima Prestige because it is not very streamlined. However, seeing as this machine fits a whole lot of stainless steel into a compact area, and at a good price, this model remains on top for now. There are actually people out there who buy a cappuccino machine just to have the steam wand. Usually they are people who actually want an espresso machine, but who get scared off when they see the cost and realize how much work an espresso machine can be. Although a cappuccino maker with a steam wand can’t come close to replicating what you would get from a machine with a portafilter, with a bit of practice and a good milk pitcher, you can learn to make some really excellent milk foam. You don’t actually have to do that much yourself, but you can still easily make a trendy drink like a chai latte or a matcha latte. You should therefore not automatically rule out a manual milk system, even if you don’t think you will use it. You might find yourself making hot chocolate for your kids or a dirty chai for yourself – after all, the same machine will give you espresso at the push of a button. You will see that steam wands are a common feature on entry-level machines, even if they are a bit of a contradiction – you might want an automatic machine because you are a bit lazy, but then the machine still makes you work to get your drink. 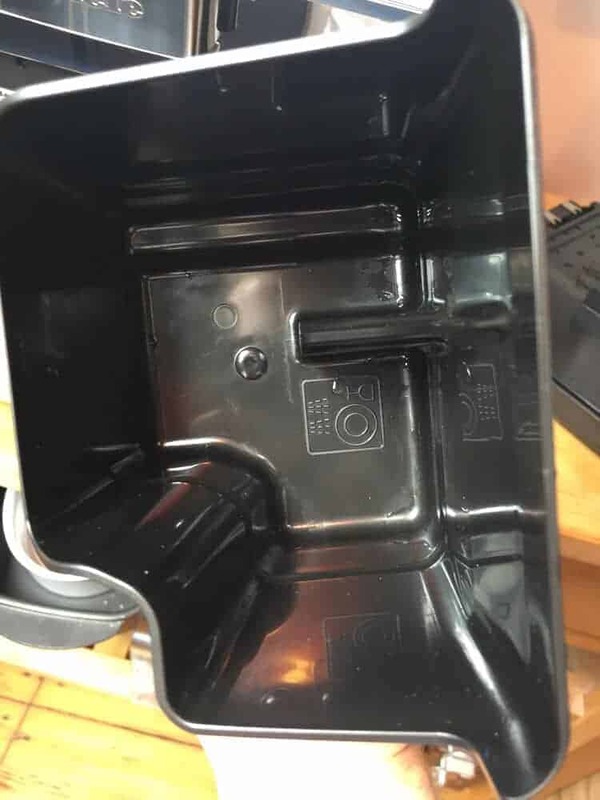 In any case, nothing outcompetes the DeLonghi Magnifica S ECAM 22.110.B. The DeLonghi Magnifica S ECAM 22.110.B gives you more than enough steam and also makes a tasty espresso, and does it at a low price. You can find it here on Amazon.com. By the way, the Siemens EQ.3 managed to partially automate the steam wand. You only need to put the wand inside the container, then the machine does the rest. It’s really cool! By the time you get to the middle of the price range, most machines will have some kind of automatic milk foaming system. Depending on the machine, some integrate the container and milk system into the machine, while others use a hose (with a cappuccinatore) that attaches to a separate milk container. Both of these systems have advantages. A fully-integrated system makes many things simpler and does some things better than systems with a hose. Hose systems are usually much easier to clean, though, and are generally less hassle. On the other hand, a fully-integrated system takes up less space. Those trade-offs are also why it is so hard to determine a clear winner in this category. The Melitta Caffeo CI always leads the pack, even though its container sits next to the machine. However, its foamed milk is simply excellent – and at a good price. You can find the Melitta Caffeo CI here on Amazon.co.uk. 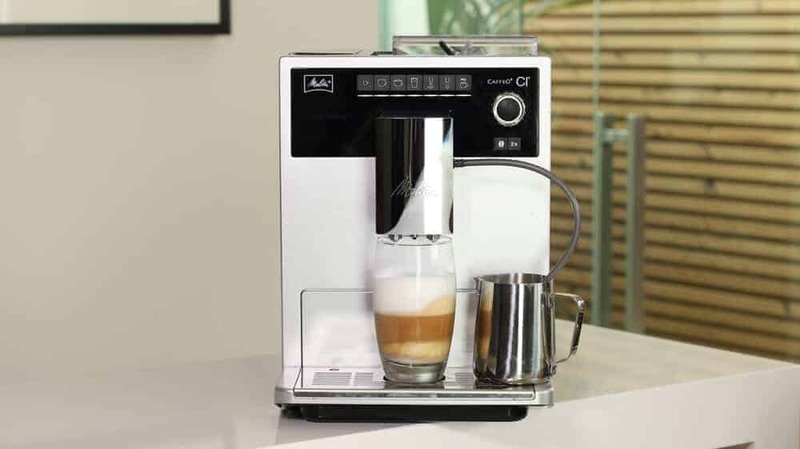 The foam from the Jura E8 is in the same league, and it also uses an external milk system. However, it has to compete against the very noteworthy Melitta Caffeo Barista. 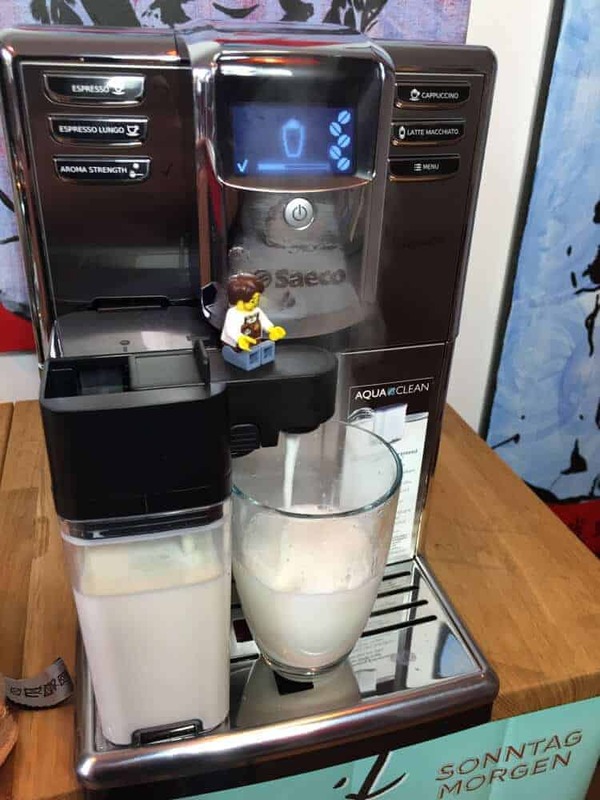 The Saeco PicoBaristo is a good standard bearer among the machines with an integrated system, even though the milk foaming system was unnecessarily loud for some reason. This category focuses on the bells and whistles and all the possible features that you can get with an automatic machine. 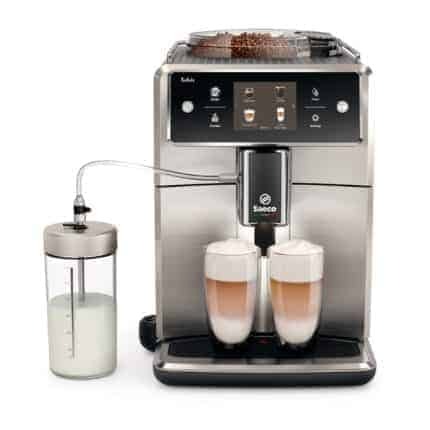 This includes gimmicks like dual bean chambers, for example, but also more useful features, such as the number of programmable drinks or user profiles. 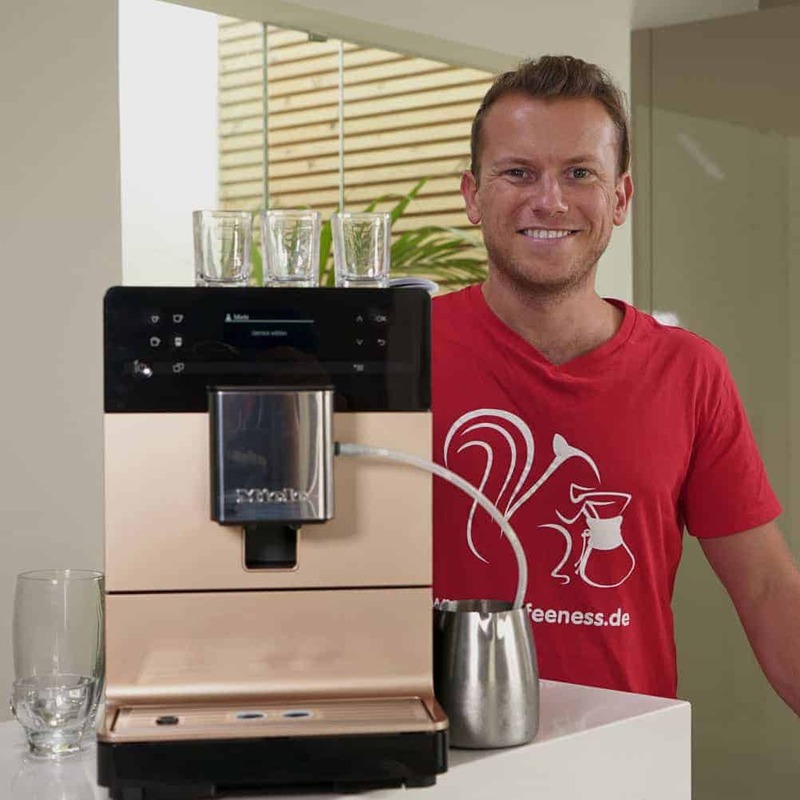 Here the Saeco Xelsis and the Melitta Caffeo Barista are quite ahead of the competition. The Siemens EQ.9 Connect is another winner, thanks to its great app and its many possible settings. I also have to mention and praise the Philips HD8834, which really delivers despite its price category and compact size. Still, for every additional doodad that you want your machine to have, you will have to reach a bit deeper into your wallet. I believe that the Saeco Xelsis is currently the most modern and sensible option. It doesn’t have an app, but it does have a bunch of easy-to-use touchscreen menus. I think that the office is both a natural habitat for automatic espresso machines, as well as an absolute justification for their existence. You can fully take advantage of the features of a good model by storing different user profiles, doing many things (or everything) automatically, and even quickly switching between different drinks without batting an eye. However, there is one big problem with the office espresso machine: usually nobody feels responsible for cleaning it. What’s more, it has to work relatively quickly since everyone wants a cappuccino once break time rolls around. You have probably already guessed that cappuccino machines in the cheaper price class aren’t ideal for offices – at least if you are talking about more than three employees. You will have to pay at least $700 if you want to meet the needs of most offices. We have been using the Melitta Caffeo CI in our own office for an entire year now, although we don’t have too many employees. The Siemens EQ.9 is also a good choice for an office because it is made to work for many users, plus it is very clean and classy, in general. You can find the EQ.9 here on Amazon.com. Once the number of employees gets into the double digits, I would recommend getting a larger, catering-style machine – perhaps one from WMF or Nivona. They make more sense if you are going to make a whole lot of coffee. 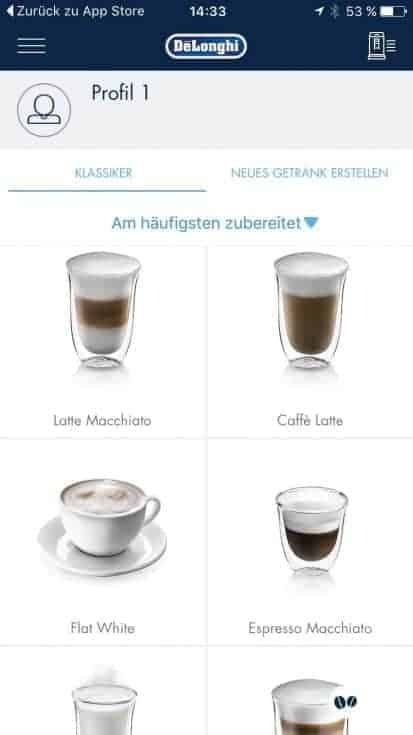 You can find more information in our guide of automatic espresso machines for the workplace (currently only available in German). A quick note: The competitors often just have one or two small quirks that hold them back from winning. Additionally, perhaps my own personal opinions influence my choices. However, that’s just how it is with these machines. Objective criteria can only take you so far, and the rest is based on personal preference. I want to single out Melitta yet again because this German manufacturer can sometimes fly under many buyers’ radars, but they make a wide range of machines with interesting features and they continually deliver excellent results. Good balance of price and performance. There is no doubt that the Melitta Caffeo CI is the best of the four. It is also the one that I named the winner of the mid-range test in terms of performance and price, and so far no other machine has knocked it from its top spot. It simply sets the standards. 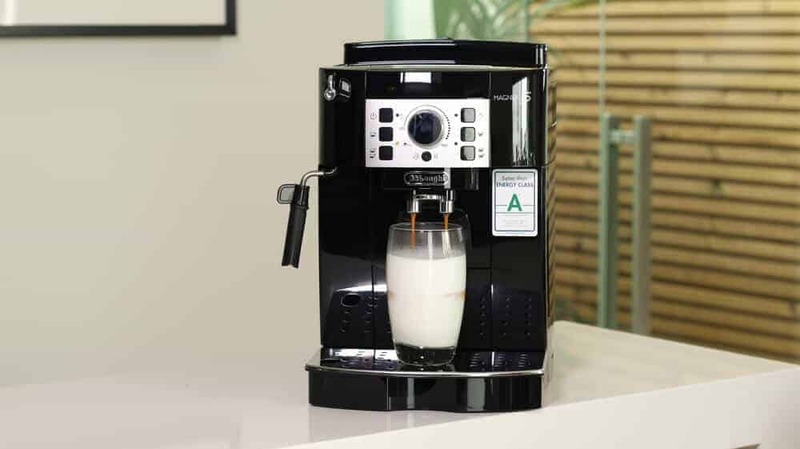 The Caffeo Solo is unique among automatic espresso machines because it does not have a milk system. That may scare off some buyers, but the concept itself is actually not so dumb. 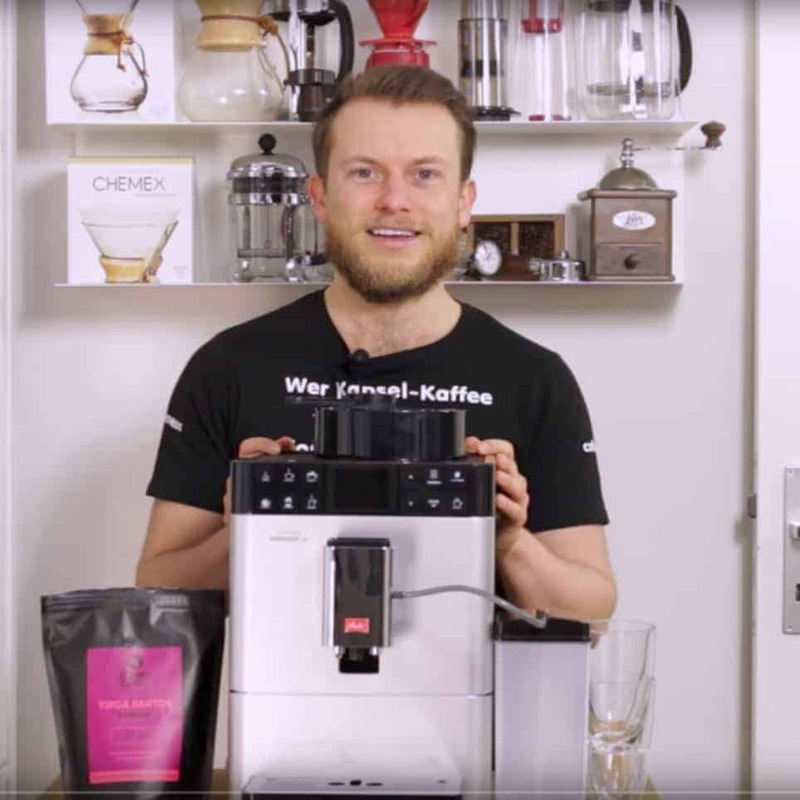 You can watch our video comparing the Melitta Caffeo Solo, Caffeo Varianza and Caffeo CI (video only available in German). If you drink your coffee black and are very fastidious about coffee bean selection and taste, then this model does everything right. It really does a great job using the brewing process to get the best results possible from the raw materials. If you really do start to miss foamed milk, we at Coffeeness have reviewed many milk frothers. There are many good ones that are small and relatively inexpensive, which would complement your Caffeo Solo perfectly. The Caffeo Varianza goes its own way in terms of grinding. 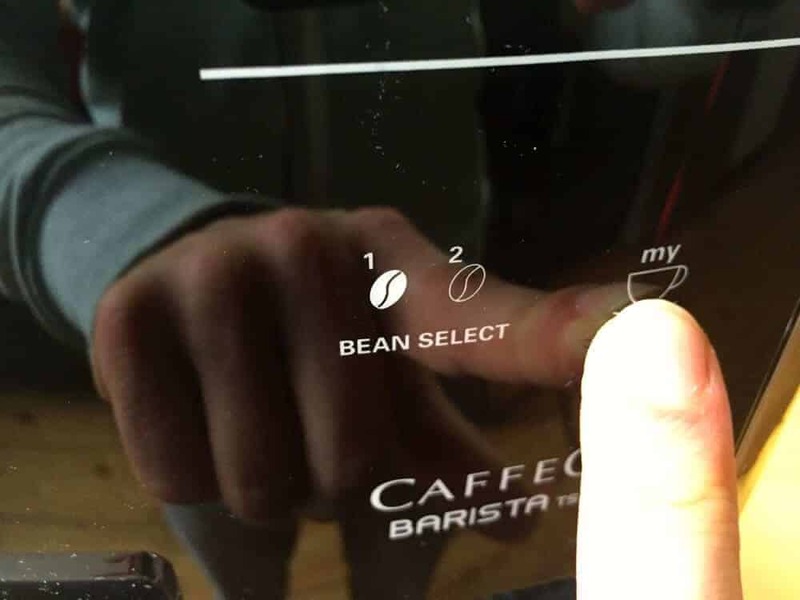 The “My Bean Select” model grinds and brews single servings of beans completely separately for each espresso. That’s great because it lets you use two kinds of beans one right after one another – like if you want to sample a new brand or if you would like more or less robusta in your blend. It’s a cool feature for the tinkerers or experimenters among us, as well as for thrifty folks who absolutely can’t stand wasting coffee. 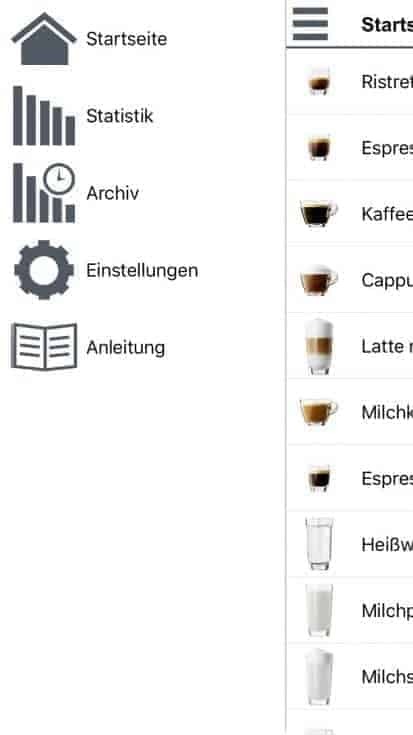 The top-of-the-line Caffeo Barista also gives you this bean selection option, although its higher degree of digitalization also gives you more functionality and more optional settings. I also have to mention the excellent milk foam it makes – it really knocked me out. Many drink possibilities and choices. I’m not entirely sure why many customers tend to treat Melitta so shabbily. Maybe it’s because the brand is known more for its pour-over coffeemakers and filters. However, in terms of functionality, Melitta manages to skillfully sneak ahead of some of its more beloved competitors. Five Quick Questions (Plus One Question to Rule Them All): Do I Even Need an Automatic Espresso Machine? Some people will probably roll their eyes here: OF COURSE I need an automatic espresso machine. I wouldn’t be here otherwise! Still, as I’ve done this job over the years, I have talked to many buyers, friends and acquaintances who purchased these machines. Again and again, I hear them tell me that everything started out wonderfully, but after just a little while, they started to ignore their machines. There are many possible reasons for this. Maybe nobody cleans the thing and eventually it starts making gross sludge. Or maybe they thought they would try out a different coffee drink every day but eventually got stuck in an americano rut. Or maybe the machine has a few faults – it is too noisy, it keeps giving you weird error messages, the drip tray is too small, etc. – that eventually bug you so much that you switch back to your French press or other trusted coffee device. With prices starting around $350, these automatic espresso machines are definitely an investment. I believe that you really need to consider whether it is worth investing that money, because even if you just buy cheap supermarket beans (but please don’t), the cost of the coffee and machine upkeep will still eat into your budget. Are there many coffee drinkers who will use the machine besides myself, and do they like different kinds of coffee drinks? Am I willing to learn how to use the different features? Am I willing to be disciplined when it comes to cleaning the machine? Do I want to learn about coffee beans and roasts? Am I willing to actually pay more for good coffee beans? That last point is especially telling. Many people expect a cappuccino maker to give them the exact same experience as the café around the corner. That’s just not correct, and many buyers have been left feeling disappointed. An automatic espresso machine is not a traditional espresso machine, no matter what the manufacturers tell you. That’s because the way they work is different – and we will take a closer look at that topic now. I’ve put together 10 tips you should keep in mind, along with the questions above, when buying a super-automatic espresso machine. I will also include other important ideas you should understand. The funny part about all this automation is that you can only get involved up to a certain point. Additionally, automation also implies making sacrifices. We will take a closer look at these sacrifices later on. What Are the Advantages of an Automatic Machine? It saves time – and is a less stressful way to make coffee. It can make almost everyone’s favorite drink. Using the machine is child’s play – anybody can press a button. It usually takes up less space than a traditional machine and a grinder. It always freshly grinds the coffee (one of the Coffeeness Commands). It makes a good imitation of espresso (true espresso needs pressure). It cleans itself, mostly automatically. *I don’t want to get into a long rant against K-cup machines here because doing so always raises my blood pressure. You know the deal: People who drink K-cup coffee have let their lives spin out of control. However, the fact is that many people who buy automatic espresso machines had previously owned a K-cup machine, but found themselves wanting better functionality and less waste, all at a better price. Congratulations: When you get to that point, you have passed the first test! What Are the Disadvantages of a Super-Automatic Espresso Machine? You have to clean them regularly – REGULARLY! It may seem like they have a lot of settings, but they are more limited than you may think. The coffee quality can also suffer as a result. Many models are very loud when grinding beans. If you use traditional whole-bean coffee, you will get results that are a thousand times better if you simply use a pour-over filter or a French press. You can only get true espresso from an espresso machine with a portafilter. Period. Many models can only make one drink at a time; only more expensive models can make two simultaneously. If anything breaks on the machine, get out your wallet. If the machine gets dirtier than it should be, it can be hazardous to your health. A good automatic espresso machine can make up for many of these disadvantages – and we are always on the lookout for those models. I don’t want to go into a lot of detail here about what an espresso machine is. You can learn more about that in our reviews and our guide to espresso machines. For our currently purposes, we will only concern ourselves with one main difference between a traditional machine and an automatic one: the entire brewing process. 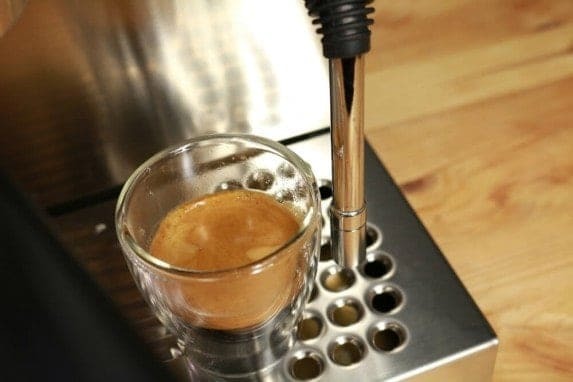 A traditional machine with a portafilter heats the water to approximately 195 degrees Fahrenheit (90 degrees Celsius) then uses 9 bars of pressure to push it through an extremely compacted coffee puck. The coffee must be ground especially fine so that it can withstand the pressure. This pressure builds up directly in the portafilter, which is mounted directly above the coffee cup. This special brewing process makes a typical espresso, the most noticeable characteristic of which is its crema, which is the thin layer of creamy foam and bubbles on top. The crema is basically just a visible sign that you have correctly made your espresso. Automatic espresso machines imitate this process, but not every detail of it. They always grind the beans a bit coarser, and they shoot water through the pressed puck while it is inside the machine. It does use pressure, but it is not enough and it is in the wrong place. After brewing, the finished coffee has to move through a hose from the brewing unit to the spout, where it flows into your coffee cup. These details are the reason that what comes out of your automatic espresso machine isn’t actually a true espresso. 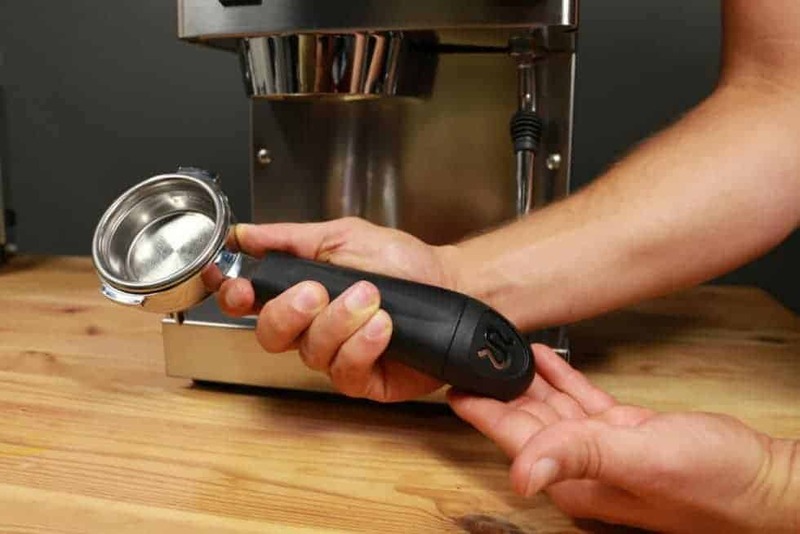 It is difficult to explain all of that to customers, so manufacturers came up with a trick: Right before the coffee comes out of the spout, the machine “whips” it with a whisk or a bit of air. That gives the coffee a kind of artificial crema, but it is not the real thing. True espresso crema is a separate layer that comes from extraction and which “grows” from the bottom up during the brewing process. A fake crema is basically just whipped coffee. That may sound nitpicky to many people, but this difference is extremely important. 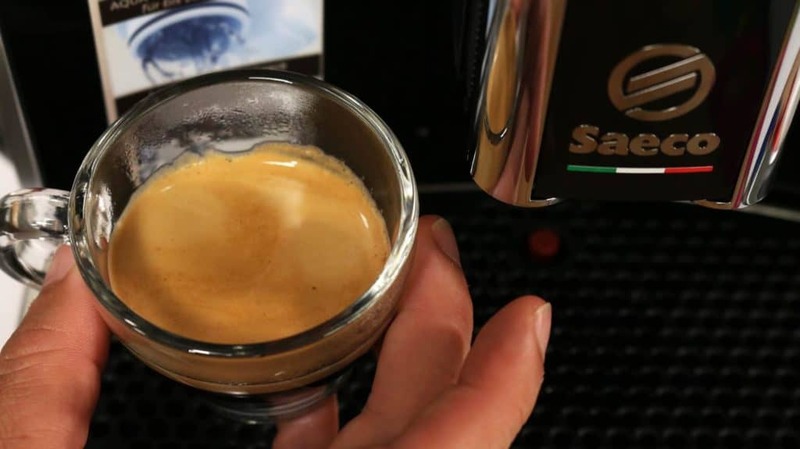 The “espresso” from an automatic espresso machine is a different kind of drink altogether, and it is only distantly related to true espresso. They are cousins, let’s say, but not siblings. You might only notice the difference if you look really closely, but that is likely also the case with your favorite people: Once you notice their flaws, it is impossible to ignore them. Additionally – and I must emphasize this point – a traditional espresso machine is an expression of coffee as an indulgence and a ritual. You have to intensively engage with each step of the process and slowly build up your barista skills. With every refinement you make, you come one step closer to the perfect cup of coffee. An automatic espresso machine is a consumer product. Period. Here the important thing is the destination, not the road you take to reach it. You can adjust lots of things, but the machine is still doing the actual work without you. That’s not necessarily a bad thing, but it is an important point. The little word “super” clearly separates these automatic espresso machines from another category of coffee machines: automatic coffeemakers. In this review, we are talking about coffeemakers with built-in grinders. These machines are evolved versions of the traditional drip coffeemaker because they freshly grind the beans. Otherwise, there is no difference between them and a regular coffeemaker. The advantage of a coffeemaker with a grinder, as opposed to an automatic espresso machine, is clear: It can make a whole bunch of coffee at once. It is a good argument if you are planning on having friends over for coffee or if you just want to drink a lot of it. You can also buy a milk frother to go with it. Let’s return to our “fake” espresso. The manufacturers will make all kinds of claims, but the claims don’t always match what actually comes out of the machine. I sorted through different coffee drinks and preparation methods and made the chart below for you. Here you can see what the drinks are and what you need to watch out for. Reminder: When I’m talking about espresso here, I’m talking about “espresso” from super-automatic espresso machines. Can You Make It with an Automatic Espresso Machine? Cappuccino Espresso and freshly-foamed milk. The espresso and milk foam are touching directly. Yes, but most automatic espresso machines don’t make good cappuccinos. Making one is more nuanced than you might think. Latte Macchiato Hot milk and hot milk foam, with espresso on top. Yes, but many automatic machines can’t make proper layers or correctly balance all the components. Flat White Like a cappuccino, but with less foam volume. Only theoretically. The flat white is an especially elegant drink, and most machines are too rough. Red Eye Single espresso mixed with drip coffee. Kind of – using an "americano" instead of drip coffee. Black Eye Double espresso mixed with drip coffee. Kind of – using an "americano" instead of drip coffee. Café Au Lait Coffee with steamed milk. Kind of – using an "americano" instead of drip coffee. Caffè Misto Drip coffee mixed with steamed milk – Starbucks' version of the Café Au Lait. Kind of – using an "americano" instead of drip coffee. Chai Latte, etc. Powdered drink mixes with hot milk (with or without foam) Kinda. Only makes sense if you have a model with a steam wand. Can an Automatic Espresso Machine Make “Normal” Coffee? Here’s a video showing the DeLonghi Magnifica S ECAM 22.110.B and the Siemens EQ.9 using normal coffee (video only available in German). If you enjoy these guides, I would be happy to write more of them with advice and tips about other coffee drinks. Let me know in the comments below! 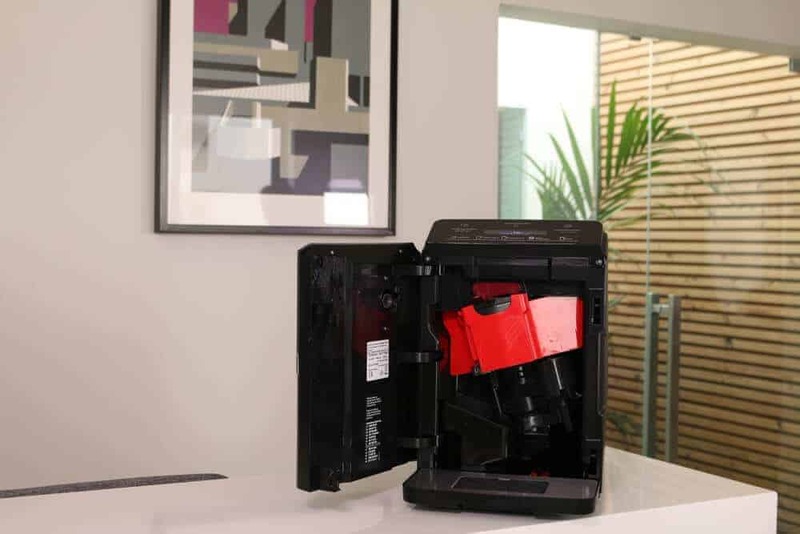 It makes sense that when buying a highly-automated device like an automatic espresso machine, it is just as important to keep the technical components in mind as it is to consider the features, the price and the different drinks it can make. All the stuff that is “under the hood” can play a big role in determining the longevity and value of the machine, not to mention the quality of the drinks. I would therefore like to get a bit technical while I present to you the “heart” and “motor” of an automatic espresso machine. I have already emphasized many times elsewhere that the grinder is the first and perhaps most important step on the path to perfect coffee. There is a reason that coffee lovers are willing to pay almost as much for a grinder as they would pay for an espresso machine with a portafilter. The grinder plays a big role in how loud the machine is. It should grind the coffee beans uniformly so that the grounds are extracted evenly. It is usually the first thing to break – because it is used the most. It should therefore be extremely high quality. The grinders in automatic espresso machines are distinct for two main differences: their material and the shape of the grinding tool. You can choose between ceramic and stainless steel, and between a conical or flat disc grinding tool. Ceramic grinders are supposedly quieter. That’s not always the case, but it is proven impressively true on the whisper-quiet Gaggia Anima Prestige and the Siemens EQ.6 700, for example. Nevertheless, it is definitely true that they don’t rust. In terms of durability, ceramics also supposedly have a very long expected lifespan, but I’m a bit skeptical about that. I think steel is innately better in longevity. In any case, it is still most important to know how well made the grinder is, if the materials are good quality, and other similar considerations. Steel is usually used in the lower price classes – which means manufacturers tend to strongly promote any inexpensive machine that has a ceramic grinder. However, I think whether a grinder has a flat disc grinder or a conical one – regardless of what material they are made of –is more important. Disc grinders are very common and consist of two discs that sit on top of each other – the inside has a concave shape, and the discs’ outer edges come close to one another. The smaller the distance between the two discs, the finer they grind your coffee. The larger the discs, the less time it takes them to grind – and that helps improve your coffee’s flavor. Disc grinders are built into many automatic espresso machines these days, so it is almost impossible to give one example that stands out at first glance. You really need to look at how adjustable the discs are. The finer you can adjust them, the better. A good cappuccino maker with a grinder should be able to move the discs so close together that you almost (almost!) get a true espresso-quality grind. The Gaggia Anima Prestige stands out once again here, though other competitors such as the Jura E8 are also setting benchmarks. A conical grinder, on the other hand, is made of two pieces that clasp onto one another – one is positive and the other negative. It also takes up less space. Conical grinders are therefore more common in small or compact machines. That’s why you will find them working very well in the Melitta Caffeo CI and the Melitta Caffeo Barista, for example. I’m therefore very careful to not give a general endorsement to one grinder material or shape over another. 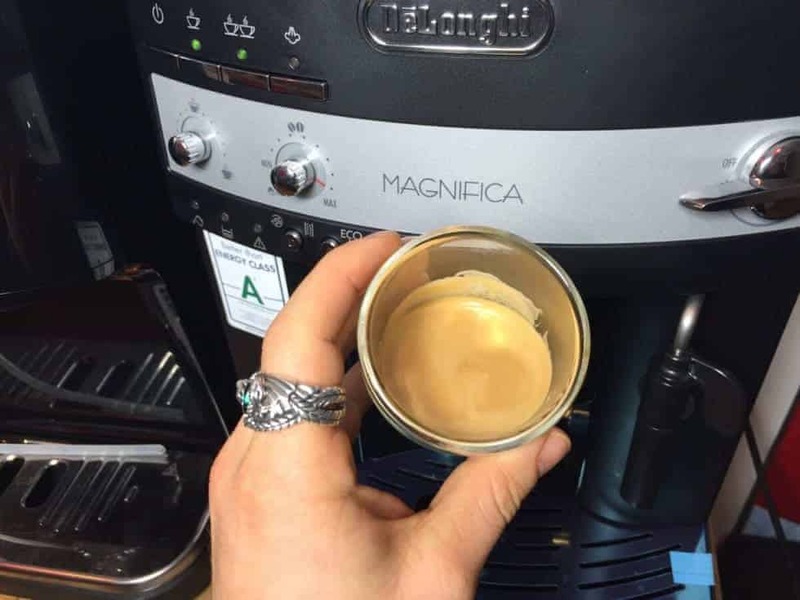 The stainless-steel conical grinder in the DeLonghi Magnifica S ECAM 22.110.B, for example, works just as well as the ceramic disc grinder in the Saeco Xelsis SM 7580/00 – even though the rest of the machine might work differently, of course! Clean it regularly and thoroughly. Take it apart for cleaning. It’s not hard at all. Regular care can prevent many problems. Be careful with the beans; Be sure there are never any little stones or other debris that can wreck the grinder. Quickly heat up the water. Are suitable for long-term use. Can be pretty exact in terms of water temperature. 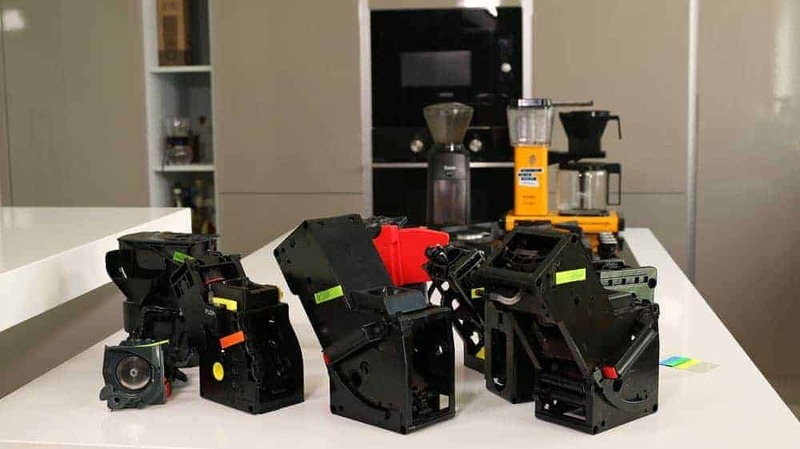 For those reasons alone, thermoblocks are generally the better choice for automatic espresso machines, even if they are significantly more complicated and therefore more expensive to repair. Now we come to a seemingly never-ending discussion: Should brewing units be removable or not? We are also going to get mixed up in the battle between fans of Jura and fans of Siemens. It is always an advantage to have a removable brewing unit! Even an extremely precise machine can’t completely prevent coffee from working its way into the inner workings of the brewing unit. Plus, an automatic cleaning cycle is never as thorough as a manual cleaning done with running water. What’s more, many of us aren’t necessarily role models when it comes to cleaning. The displays on our poor, overworked machines might be calling out for a cleaning for weeks before we actually get around to doing it. That is not an accusation, but rather a fact. Still, a non-removable brewing unit does have one advantage: You won’t break anything while you are trying to take it out or put it back in. Too many cappuccino makers have “shuffled off this mortal coil” because their users tried to remove the brewing unit when it was in the wrong position. Always remember: Only try to remove or put back the brewing unit when it is in the right position and when the machine is turned off. That is the only way to be sure nothing gets jammed. Now, back to talking about the machine’s heart. That’s really what the brewing unit is because without it, an automatic espresso machine would be just an expensive electric water kettle attached to a coffee grinder. So what exactly does the brewing unit do? The freshly-ground coffee falls into the brewing chamber, where it is pressed into a puck. Hot water is pushed under pressure through the coffee puck. The coffee is extracted and flows through a system of tubes, then drips into your cup. The brewing unit then releases the puck and drops it into the catch tray. There are several mechanical processes at work here, so the better the materials are, the longer the machine will last. The main component of the brewing unit is indeed (durable) plastic, but the more stainless steel you can get into the mix, the better. You have to be especially careful for any hinges or other moving parts. They are significantly easier to clean and more hygienic. They let you easily switch between different kinds of milk. They often mean that the machine doesn’t need as much space, and they are more flexible. The Jura E8 review or the Miele CM 5500 review can give you a few nice examples of this. Nevertheless, there are very few machines that have been able to perfect automatic milk frothing. The manufacturers are paying close attention here because they know that the first question a potential buyer asks about these machines usually is about the milk frothing system. Why is that? Well, a SUPER-automatic espresso machine should do everything by itself, even the milk foam. However, if you pay less, you will have to roll up your sleeves and get involved. Still, that’s not actually bad. As I mentioned above, I’m personally a big fan of the manual method. If you do things manually, you can control everything and improve your latte art skills. You can also easily clean the wand with the push of a button. A cappuccinatore just imitates that. When it comes to an automatic espresso machine’s pump and how much pressure it can exert, I’m reminded of the specs for digital cameras. The manufactures like to bombard you with enormous numbers that actually don’t mean anything. Camera advertisers talk about how their cameras have 20 megapixels or more, but you don’t actually need that many megapixels unless you want to project your pictures onto the side of a house. Cappuccino makers advertise that they have up to 15 bars of pressure, which sounds more impressive than it actually is. 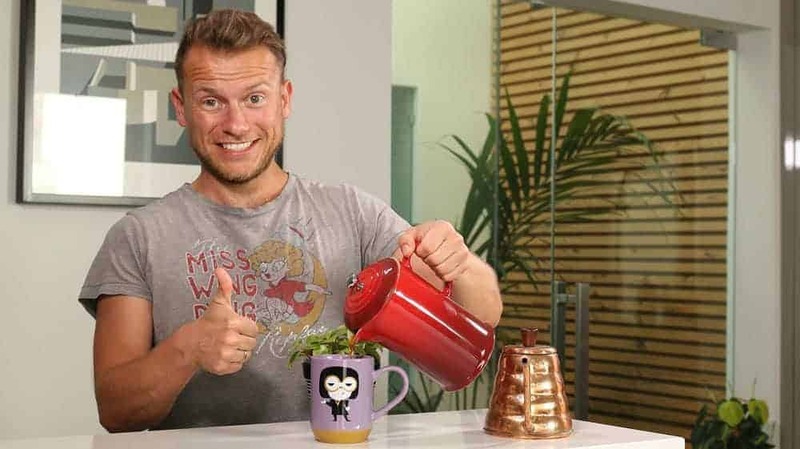 Any halfway experienced coffee drinker should know that you need around 9 bars of pressure to make the perfect espresso – but you don’t need a single bit more! This means that it is completely unnecessary to have the 15 or 19 bars of pressure that some machines exert. That is why it’s completely irrelevant that the Siemens EQ.6, for example, can exert 15 bars of pressure, and that the more expensive 700 model can even get up to 19 bars. It has nothing to do with the quality of the coffee it can make. What have we learned here? The pump is indeed important, but the grinder and the brewing unit are even more important. Now let’s move from the inside of these machines to the outside. Regardless of how many features or possible drink options your machine might have, each setting still needs to be intuitive and easy to use. The more you pay for your coffee machine, the fancier the controls will be, and you will also get more digitalization. You can get a good sense of the current state of affairs by reading my review of the Saeco Xelsis. However, not everyone feels like wading through a bunch of menus to get their coffee, especially if they haven’t had their daily coffee fix yet! That’s why I personally think that simple buttons, without any displays or other frills, are just as good. The main thing is that you should be able to do a few basic functions immediately and without second-guessing. That can happen with or without an app, and with or without a little screen. I always do a “user’s manual test” with each machine: Can I get an optimally-made espresso and a latte macchiato out of the machine, even without ever glancing at the manual? If so, then I’m fine. That is also why I would never recommend a model with a display over the same machine with simple buttons, because a display simply isn’t necessary if everything else works right. That also goes for the Siemens EQ.9 Connect, even though my inner child had a great time playing around with its apps and settings. I’m also completely fine with any kind of lights or blinking buttons, as long as the lights make sense. Many inexpensive machines are surprisingly precise when it comes to this. For example, have a look at my review of the Philips HD8829, which has its own kind of Morse code. I have often heard that a good water tank is a large water tank – but then we are back to the megapixel fallacy. Fresh tap water is the basis of good coffee because it gives the water the oxygen needed right from the faucet (or filter). Extra-large water tanks allow the water to get stale and stagnant if you leave it in there too long. Either way, you should regularly rinse out your machine’s water tank and then let it completely dry out before filling it up again. Otherwise, it will eventually get stinky, and the only option will be to buy a new one. 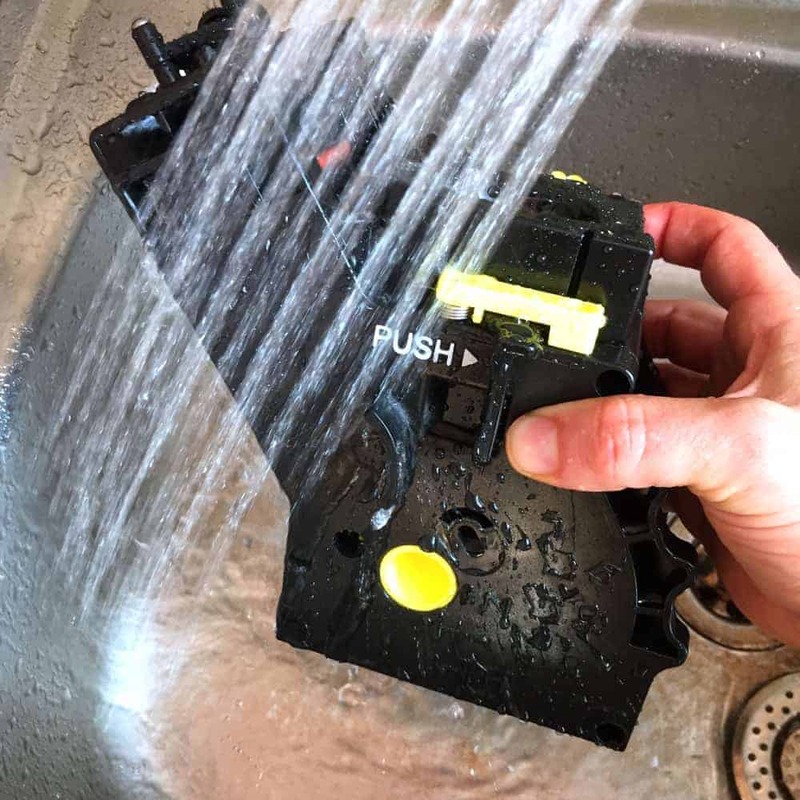 More and more models come with a tank that can go in the dishwasher. That’s great, but I would still manually rinse it out after it comes out of the dishwasher to get rid of any residue left over from the dishwashing detergent. Miele, which is very serious about their products being dishwasher compatible, once again leads the way. 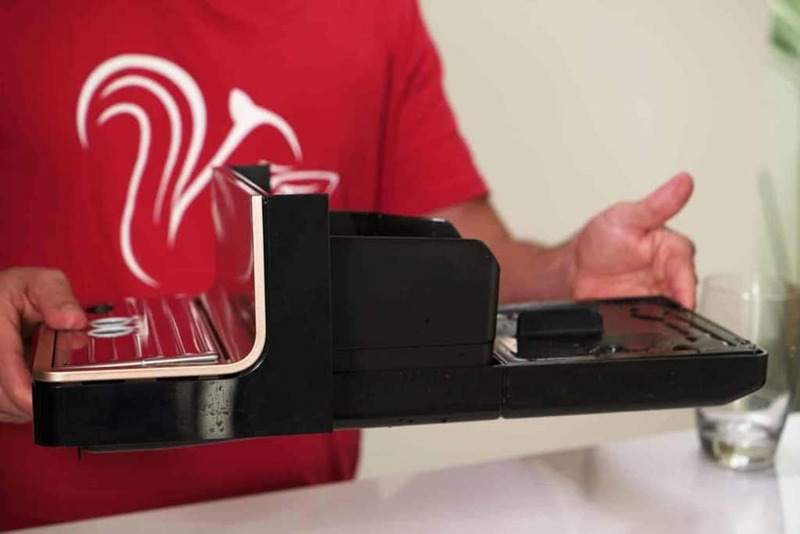 Large drip tray – The machine goes on strike when it gets full. Plus, constantly emptying it is annoying. Large catch tray – Same as the drip tray. Perfectly adjustable spout with good height – Important for latte glasses! The “Final Boss” in my tests is always an IKEA latte glass that needs the spout to be about 5.5 inches (14 centimeters) tall. Optimal bean compartment – Not too large, not too small. Same with the water tank. Ideally with an opaque lid (light can make the beans lose flavor). Grind coarseness is adjustable without a tool – I will get into this more later. Cup warming tray – Warm cups make for warm coffee. The first factor is important if you live in a house where people argue about what kind of coffee beans to use. For example, divided bean compartment with two chambers is great if you want to switch between regular and decaf beans. Quick side note: There have been lots of recent developments in the realm of decaffeinated coffee. Even small roasters now offer great roasts without that “wake-up kick.” I will be testing more of them soon because I think it is a really noteworthy development. Back to the machines: I have closely tested machines with divided bean compartments or even two different chambers, such as the Melitta Caffeo Barista. Melitta is all-around great in this area, as you can see in my review of the Melitta Caffeo CI. I will also come back to this topic below. The “two drinks at the same time” feature is more important for large households. After all, we don’t want dad to get antsy while he is waiting for mom to make her latte macchiato. This feature is usually found on higher-priced machines. You can see a good example of how they work in the Saeco Xelsis review. Personally, I don’t think this is an indispensable feature. I just want the machine to reliably work its magic with every drink it makes. Water Filter: Yes or No? Water filters will keep coming up in this article. I just want to say one thing here: they are not as important as you might think. 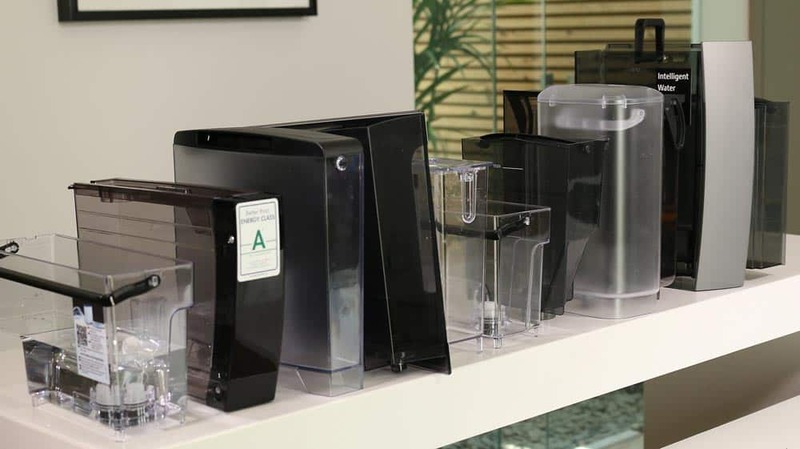 Water filters are mainly useful because they mean you won’t have to decalcify the machine as often. An automatic espresso machine can only work correctly if you calibrate it correctly – price doesn’t matter one bit in that sense. There are some things to keep in mind, and the “setup” actually begins before you even start messing around with the machine. That’s because the beans, the water and the milk that you use all play a big role in the results you will get. It is important to me that you get the best possible results from your machine. That’s why the next section is all about the most important things you need to do to get set up. 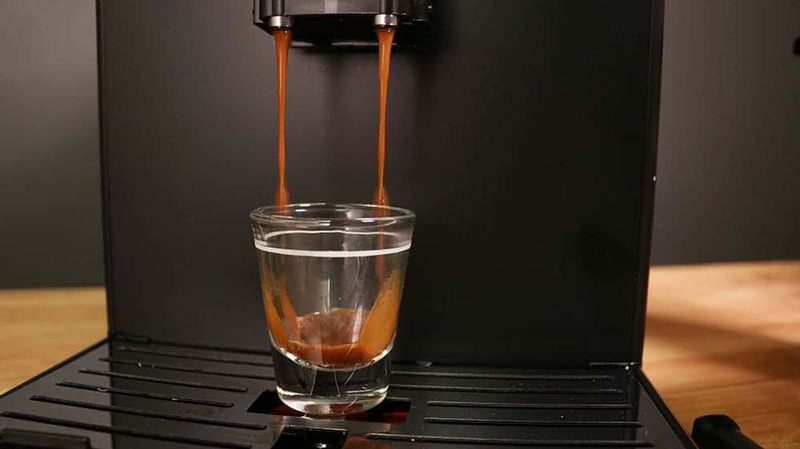 If you can adjust your automatic espresso machine to work with different degrees of water hardness – a feature that even some inexpensive models have – it doesn’t change the quality of the water. Instead, it affects how frequently you will need to decalcify the machine. There are usually three or four settings for water hardness on espresso machines. The harder your water is, the more calcium is released with every brewing cycle. I would generally advise you to pay good attention to the machine when it reminds you to decalcify it, even if you might think it is not very urgent. Decalcifying more often won’t hurt, but doing it less often can be the death of your machine – especially if you live in a large city with harder water – and that will also mean the death of your tasty coffee. By adjusting the grind coarseness, you can control for practically all of the important extraction factors that affect your coffee’s taste. A general rule: The finer you grind, the more it is like espresso. However, there are huge differences between machines in terms of how much and how easily you can adjust the grinder – and the worst is when you can’t adjust it at all. Ideally, you will have many different possible coarseness levels, and even better yet, the levels will be infinitely variable. However, that will once again depend on the price. For example, I thought the adjustable grind levels on the Melitta Caffeo CI were really excellent. Contrast that with the Saeco Moltio. It is really stupid that you need a special hexagonal wrench if you want to adjust the grinder on that machine. These machines should just have clear, simple knobs that are easy to turn! One more note for new newbies: Smaller numbers give you finer grinds and larger numbers give you coarser! Adjusting the grind is also when you can see if the grinder, pump and brewing unit all play well together. The final test of a coffee machine is how well it performs when the grinder is on the finest setting. This is when many machines go on strike. Either the water can’t get through the coffee puck, or the ground coffee gets stuck somewhere even before the brewing starts. If you want to see what this whole thing should NOT look like, check out the DeLonghi Magnifica ESAM 3200 review. In summary, remember: The finer the coffee grind, the more pressure is needed, and the more intense the espresso flavor will be. 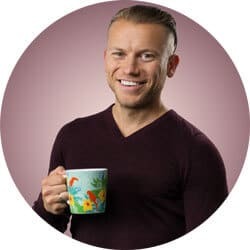 Of course, the coarseness of the grind isn’t the only thing that affects the final espresso or coffee – the amount of coffee you use is also important. The more coffee you use, the more pressure the machine will need to use to push the water through the coffee, which will give you more intense flavor. If the coffee is watery, it might be because the water flowed too quickly through the puck; that could be from a too-coarse grind, yielding too little ground coffee. If the coffee is muddy, it might be from a too-fine grind, which packs too much coffee into the puck. You will have to play around until you find the optimum balance – and it also helps if you have an understandable display with foolproof menus. Check out the Saeco Xelsis review to see what I mean. Water is third in the trio of factors you need to balance to get good coffee. Using more or less water will make your coffee weaker or stronger. I’m often annoyed by the amount of water many machines use to make an espresso. A proper espresso is about 1 ounce (30 milliliters), but most machines give you about 1.3 ounces (40 milliliters). In a worst case scenario, you can’t adjust the water amount. Pricier models are better at water adjustment, but they sort of hide it by calling it “cup size.” Actually, this is normally the first thing I check when making an espresso, and I almost always adjust it downward. Side note: Once you have finally made an optimal espresso by achieving the perfect balance between water amount, grind coarseness and ground coffee amount, I would be very hesitant about changing anything unless it is really necessary. A great espresso is delicious by itself, but it is also the basis for all the other drinks that your machine can make! So you need to be sure that it is as good as can be. Always. If your model lets you change the temperature of the brewing cycle, you should optimize it to work with the other settings you adjusted. A traditional espresso machine with a portafilter operates at about 195 degrees Fahrenheit (90 degrees Celsius), but automatic machines have different requirements. 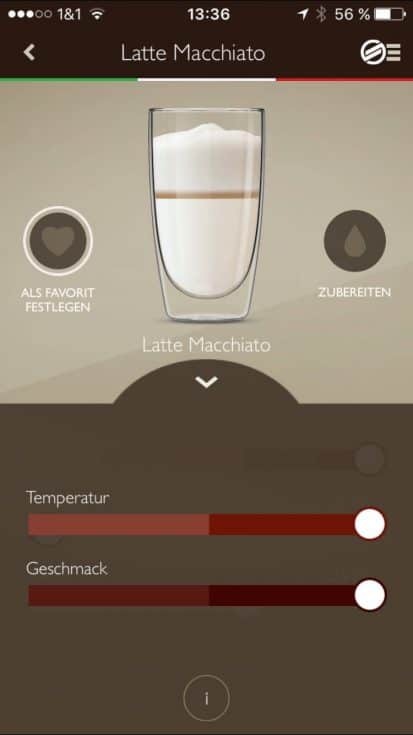 When making the first espressos with your machine, check what temperature the machine is operating at. Dial it down a hair if you are not sure! You are more likely to be able to adjust the milk temperature. We could get into an endless debate about ideal temperatures, but the fact is, anything above about 150 degrees Fahrenheit (65 degrees Celsius) will noticeably change the taste of the milk. Even if that is too cold for some of you, at least it is warm enough to make good milk foam. Rinse out and dry the catch tray, the drip tray and the water tank. Clean the milk system daily. Remove the brewing unit and rinse it out with running water. Leave it to dry overnight. Once you have internalized this routine, the whole thing takes only a few minutes – but it can add years to your machine’s life! “Adjusting” the Beans: Which Coffee Beans Are Best for a Cappuccino? Thou shalt use good coffee beans! Thou shalt use coffee beans from small roasters! Thou shalt not buy supermarket coffee, regardless of what these false idols promise! Thou shalt dare to experiment! Generally, I would say that slightly darker roasts are the best option for automatic espresso machines. If you want more flowery nuances, a pour-over is a better choice. However, if you use a particular espresso with a traditional espresso machine and get excellent results, it won’t necessarily work as well with an automatic machine. Automatic machines can tend to under-extract espresso, which quickly makes them acidic. My guide to coffee beans for automatic espresso machines can give you a quick overview of this topic. 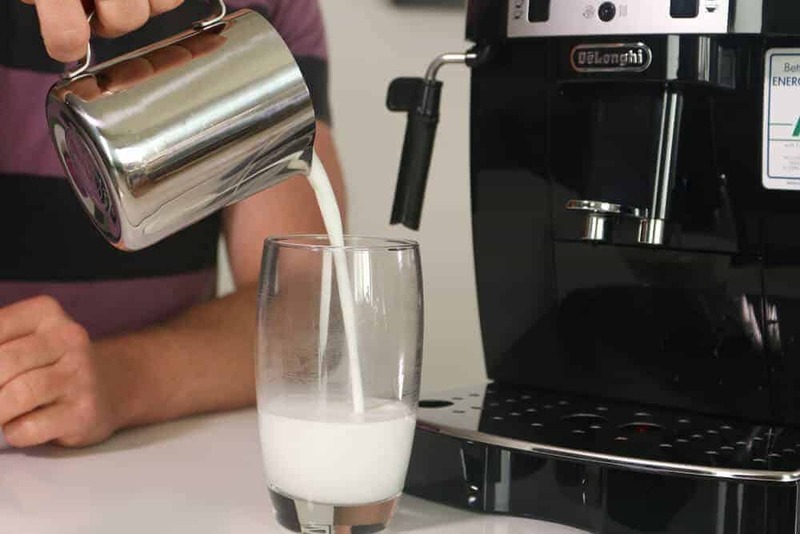 “Adjusting” the Milk: What Kind of Milk is Best for Automatic Espresso Machines? If you are using cow’s milk to make milk foam, it really doesn’t matter what percentage of fat it has. Sure, higher fat content will give you thicker and creamier foam, but low-fat milk also works. So you can disregard any claims that a certain kind of milk has the perfect amount of fat for making latte art, or any other crazy claims like that. It is just advertising! Things get tricky when we get to non-dairy alternatives, though, because the ratio of fat-to-protein molecules is sometimes very suboptimal. This is the case with rice milk, for example, which basically can’t be foamed. Soy milk is the Foam King of the non-dairy world, but it is also rather coarse and still somewhat controversial (think hormones). Coconut milk or almond milk don’t do well by themselves, but they do work better when mixed with something else. Homemade nut milk actually foams quite well, by the way. You just have to be careful that the milk is really fresh and that it doesn’t separate into liquids and solids when in the container. Really, you will simply have to experiment. Just note that some machines with a cappuccinatore might need to be readjusted if you switch the kind of milk you use. The market for coffee machines is large and complex. We at Coffeeness know that all too well. Some manufacturers are well known and others are less known. There are many companies making these machines, which means there are also lots of model variations that differ in price, performance and build quality. It is a lot to wade through. One thing that continually amazes us: Price and quality actually have nothing to do with one another. There are incredibly expensive machines that are built like junk, while there are very cheap machines that are impressively professional. In the interest of completeness, the next section will look at the most important manufacturers and what makes each one special. When possible, I will also talk about some of the cryptic model line names and give you some tips of what to look out for. DeLonghi is a brand you should know about if you are looking for an inexpensive option. These Italian machines are practically unbeatable when it comes to market presence and penetration in this price class. In particular, they have done extremely well selling machines for less than $350. According to their own reports, sales in 2017 increased by more than 5.5 percent (although that also includes the brands Braun and Kenwood). In total, their automatic espresso machines have a market share of around 38 percent in Germany, but these numbers are a bit outdated. Here you can find all of the DeLonghi models on Amazon.com. However, while at the 2017 IFA consumer goods trade show, I had the impression that the company wasn’t exactly pleased about the success they have had with newbies. I asked their press representative about that reputation and she pointed, almost robot-like, at the PrimaDonna series, which is in the mid- to high-price range. My impression of these machines can be summed up with a shrug because the PrimaDonna class doesn’t do anything better than their luxury-class competitors. Inexpensive machines really are the company’s strong point. With DeLonghi, you can often get top results at bargain basement prices. However, there is often a big difference between older and newer models of the “same” machine – sometimes it’s great, sometimes it’s a dud. Even if a given machine is great, the next year’s updated model might give you completely different results. DeLonghi Magnifica S ECAM 22.110.B Review – Winner of best balance between price and performance in the low-priced category. DeLonghi ESAM 3300 Review – Pretty weak – in every sense. I have also done a comparison of the DeLonghi ESAM and ECAM machines. The gist: If you lower your expectations, you will be incredibly pleased with DeLonghi – as long as you choose the right model. You can learn what exactly that means by checking out our comparison guide to DeLonghi machines! I have more or less given up on Krups, at least when I think about coffee machines. This German brand, which belongs to a French conglomerate called Groupe SEB, is apparently not too interested in high-quality workmanship. 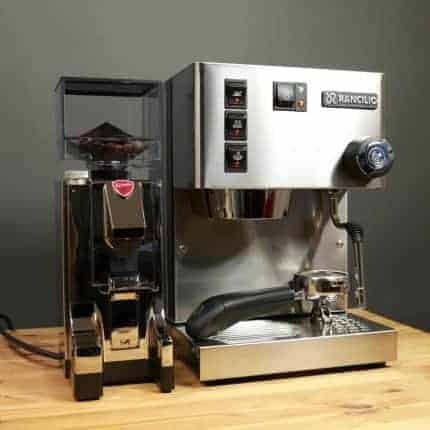 Krups’ machines are squarely in the entry-level category, making them direct competitors with DeLonghi. However, Krups always seems a bit junky, as you can see in my review of the Krups EA8108, for example. You don’t get much bang for your buck! Plus, you can’t remove the brewing unit on these cheapo boxes. That might be justifiable on an expensive Jura machine, but it spells death for a cheap, low-quality model. 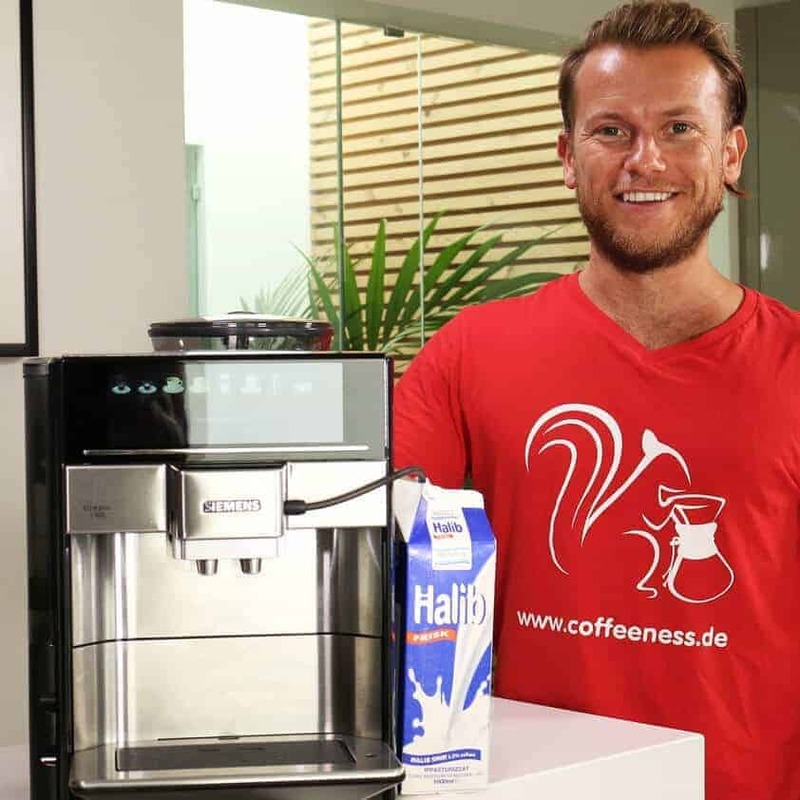 This company from northwest Germany is well known in the German market, as is Melitta. 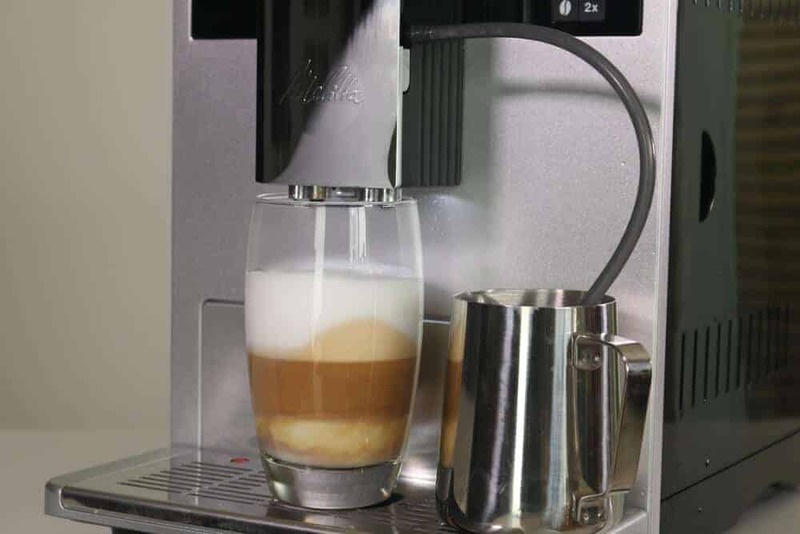 Melitta makes coffee machines, Miele makes everything else – or so the saying goes. My parents always justified paying high prices for things – like a dryer or a washing machine – by saying that at least they would last until Armageddon. Miele also has similarly high prices in comparison to others on the market. Some Miele machines – like the ones that can be embedded in kitchenettes – can go for thousands of dollars. Here you can find all the Miele machines on Amazon.com. Miele’s machines are clearly focused on design: definitely lots of stainless steel and little plastic. The (current) king of the pack is the Miele CM 5500, which looks ultra-slick and very Millennial-friendly. However, even older machines like the Miele CM 6350 or the CM 7500 prove that good looks don’t mean compromised performance. On the contrary: Miele machines are extremely solid and very dependable, and give great results, regardless of how old they are, compared to the competition. That’s why I would suggest you think hard if you ever find a Miele CM machine on sale. You could certainly do much worse, although it will admittedly make your wallet a lot lighter. WMF is known in the world of catering and hospitality. The machines are often very large and expensive, which can make many cups of coffee in a short amount of time. However, WMF also makes at-home machines for the consumer market. They are expensive and start at around $1,200. The ratings for these machines are just average, though, which is why I have not mentioned them in more detail so far. In my mind, WMF has much more presence in other product areas, like electric water kettles, milk frothers or simple coffeemakers. WMF was founded in 1853 by Daniel Straub in a sleepy, little German town called Gieslingen an der Steige. Today the company is a conglomerate with billions of dollars in sales. 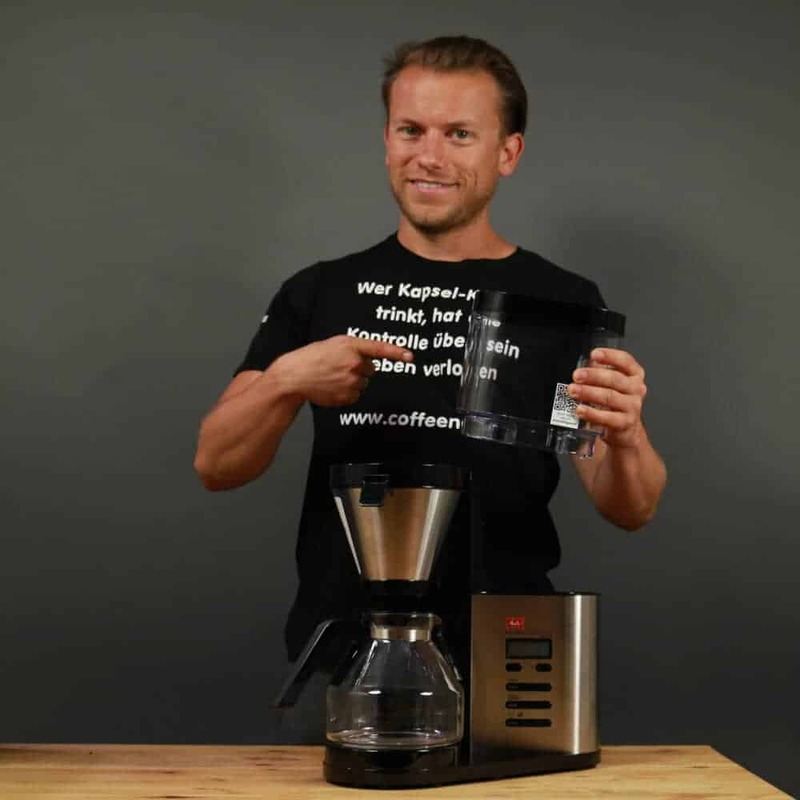 This company from Minden, Germany, has been making coffee a treat since 1908, when its founder, Melitta Benz, had the ingenious idea to make a paper filter for coffee. After 110 years, the company has grown to have more than 4,000 employees and billions in sales. Yet it’s never quite shaken off its reputation as the “doting mommy” of the coffee world – then again, that might actually be pretty clever marketing for a coffee company. The price-performance balance is always very good or outstanding, the design is pleasing to the eye, and operating the machines is a charm. It seems to me that Melitta has adeptly managed to use its market dominance in the area of drip coffee machines to influence the average buyer of an automatic espresso machine. Bosch is a German company that was founded way back in 1886. These days, this global company makes most of its sales as a supplier for the automobile industry. There was also often controversy surrounding the company’s role during the Third Reich. If you are interested, you can check out this article in Zeit. It is interesting to note Bosch’s self-praise when it comes to the topic of coffeemakers. Their website used to say: “To make coffee masterpieces, you need years of experience. Or Bosch’s Barista Technology.” I had a good laugh about that a few years ago and wondered what in the world “Barista Technology” was. Apparently that nonsense got old because now they just talk about how their coffee is as good as coffee made by a barista. My review of the Bosch Veroaroma 700 shows that their machines that cost more than $600 or so can actually come pretty close to fulfilling that promise. However, they will certainly never replace human baristas. 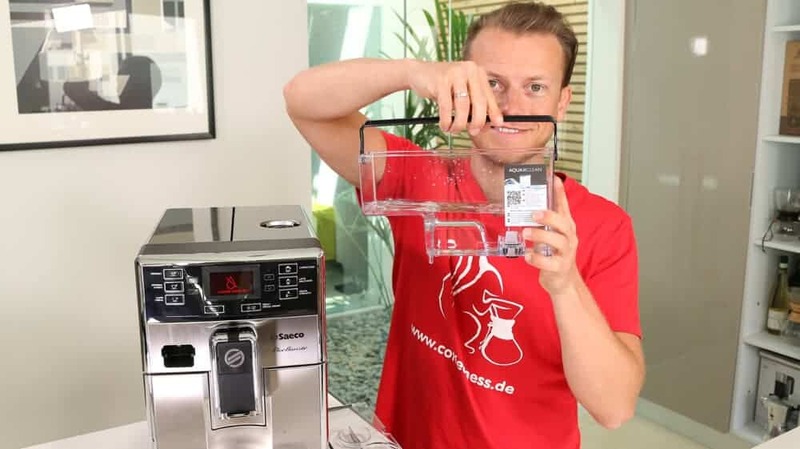 The only reason that we have not tested many Bosch machines here at Coffeeness is because they are actually identically built to Siemens machines – and Siemens is a hotter brand for consumers. For a company founded in Berlin way back in 1847, they can still make some extremely capable machines. Especially in terms of functionality and ease of use, Siemens isn’t messing around, and they are ahead of other companies. Excellent, quiet machine for super espresso. Siemens machine prices start in the mid-range and can cost more than $2,000. It remains to be seen whether that is really necessary. What is clear, though, is that you probably won’t feel swindled, even at that price, since these machines can also do great things. You can find all the Siemens machines here on Amazon.com. In the past, the Swiss company Jura also did other things unrelated to coffee. 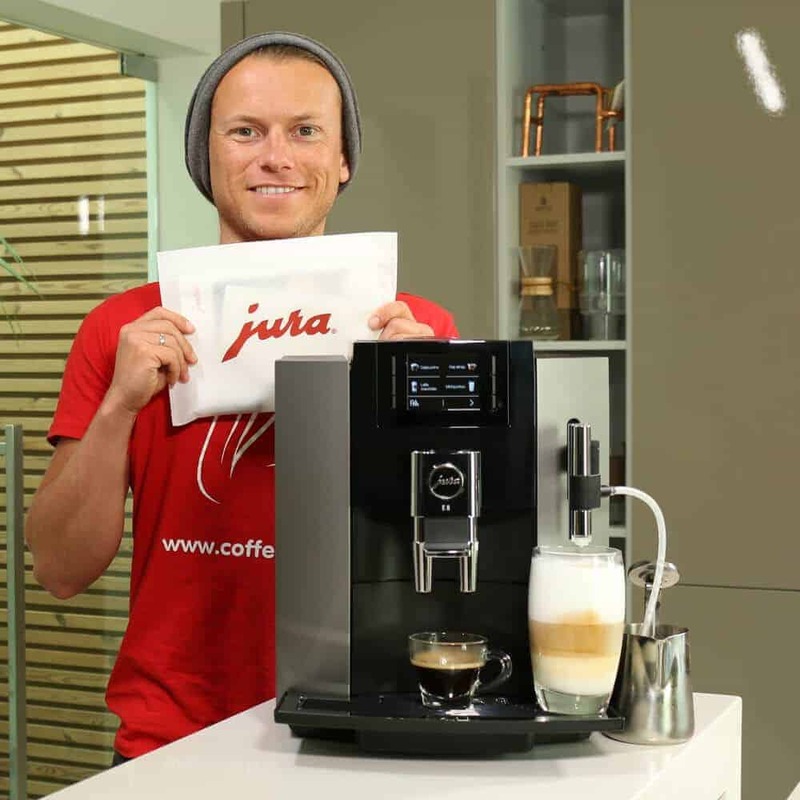 These days, though, the name Jura is the embodiment of expensive automatic espresso machines. It certainly isn’t a coincidence that they don’t offer machines in the sub-$400 category – that would tarnish the company’s fancy, high-class image. Jura also likes to point out that its machines are quieter than the competitors’. Also, that the machines are supposedly so clean, you don’t even need a removable brewing unit. The company likes to talk about how refined their automatic espresso machines are. Very good drinks and comfortable operation. I heartily recommend the Jura E8! Jura and Coffeeness are bound by a kind of love-hate relationship. The Jura Impressa C60 I reviewed was a true catastrophe. Because of my qualms with their marketing department, I didn’t test any Jura machines for a while, mainly out of stubbornness. 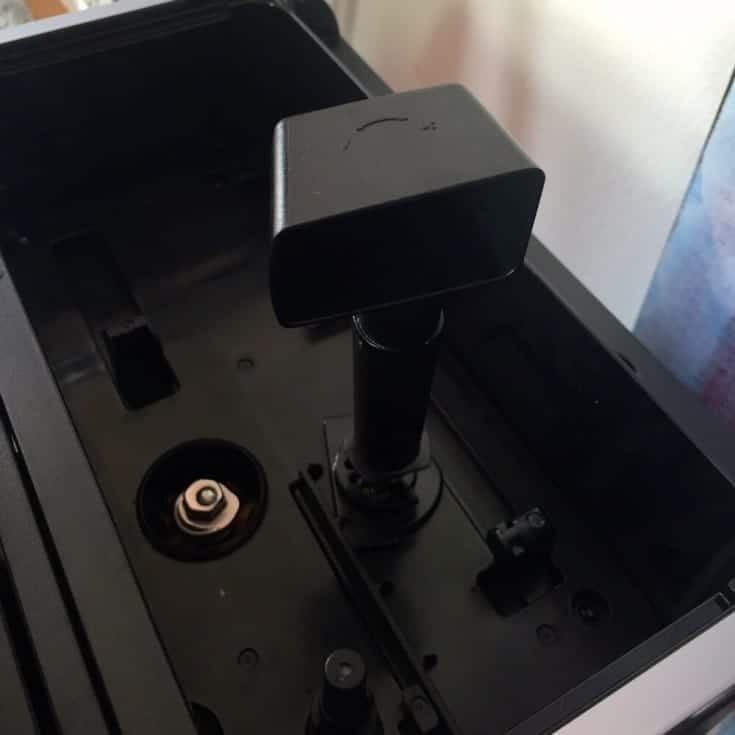 However, then you guys all got on my case until I finally took a closer look at the Jura E8 – and I must say that the high price is absolutely justified and that the machine really is excellent. However, I probably won’t personally become a Jura convert, mainly because of the non-removable brewing unit and the somewhat exaggeratedly high prices. You can find an overview of this brand in my guide to Jura super-automatic espresso machines. Gaggia Anima Prestige Review – An excellent, mid-range benchmark machine in terms of price and performance. 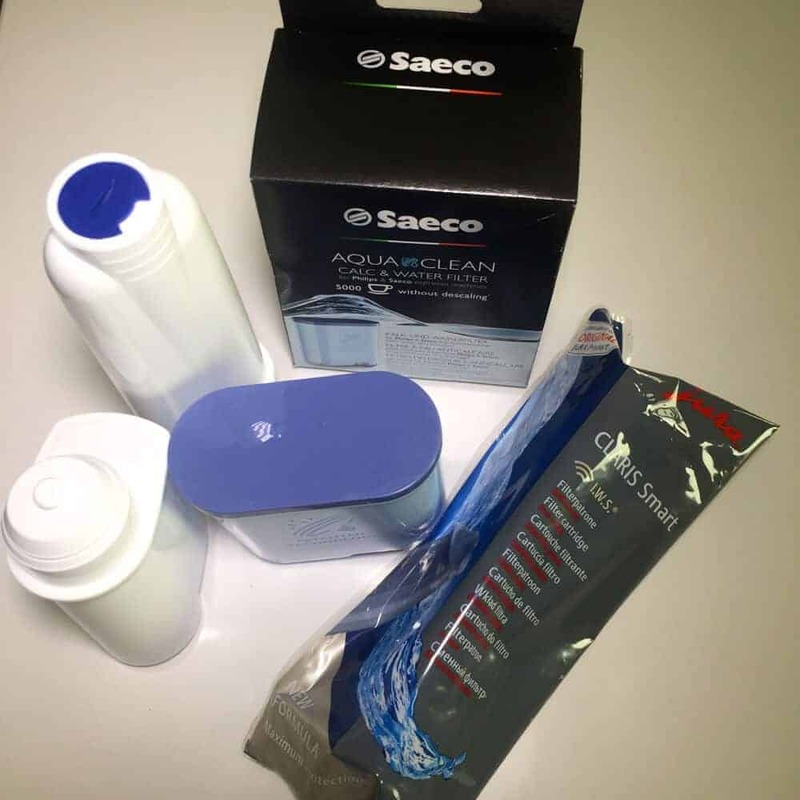 Saeco PicoBaristo Review – Very high quality for the price. Saeco plays a really big role on Coffeeness not only because the brand has been offering benchmark products, but also because they continually add updates and new features that make the market and consumers very happy. Check out the “Coffee Equalizer” in the Xelsius series, for example. The Nivona brand has been around since 2005 and has mainly made its name on the catering-supplies scene. Nivona is a combination of three companies in Nuremburg, Germany, but the actual manufacturer is the Swiss company Eugster Frismag. They make the machines in three locations in Switzerland, as well as in China and Portugal. 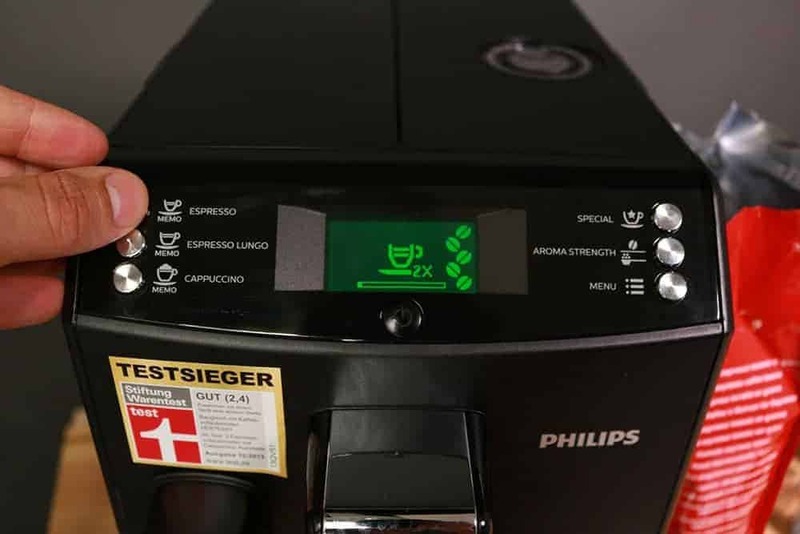 Eugster Frismag plays a larger role in the espresso-machine and coffeemaker markets, even though its name is relatively unknown. 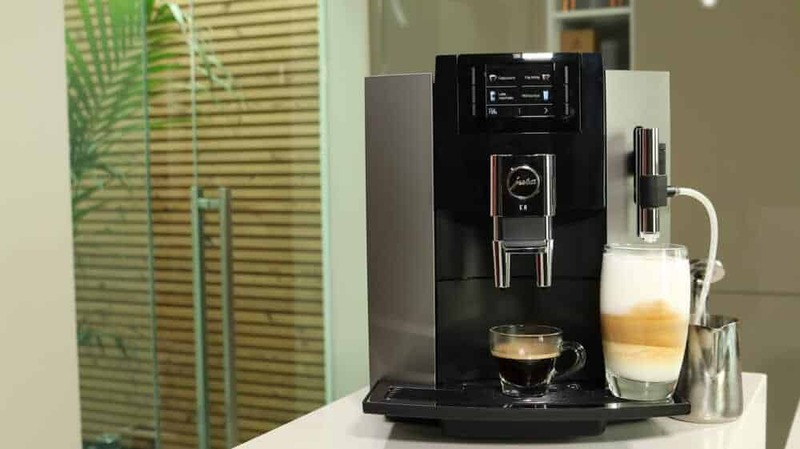 Its factories actually also make automatic espresso machines for Jura, Melitta and Miele, essentially making them suppliers for several different competing companies. Nivona is criminally under-represented here on Coffeeness, and you are right to blame me for that. I promise to do better! However, when I have tested some of these Miele machines, they were basically the same machines as Nivona, yet they were much better known – and much cheaper! Until I can fulfill my promise, you can go to my guide about Nivona automatic espresso machines for further information. Here I would like to take a closer look at some of the “special” features that I mentioned earlier. 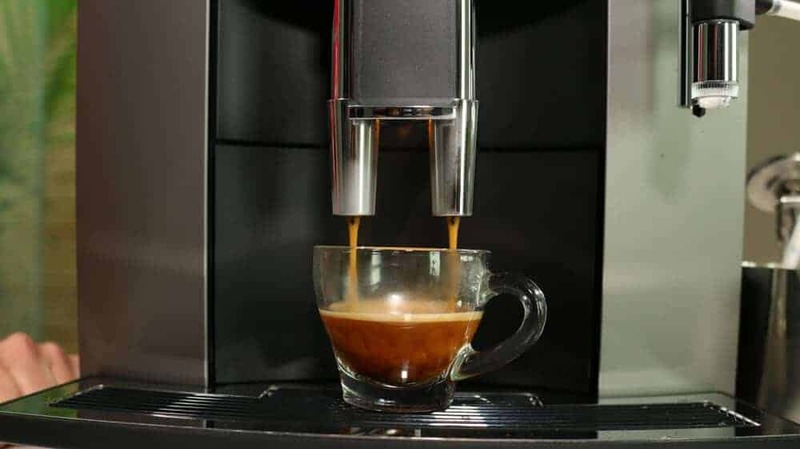 The reason is simple: Many of you have lots questions about them, and some of you might be looking for a special super-automatic espresso machine that does not do things by the book. 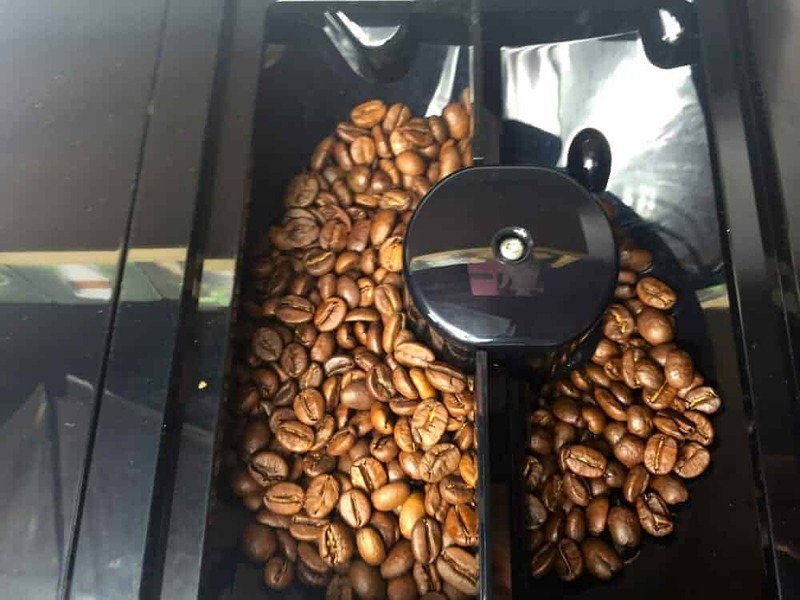 In contrast to the essentially pointless pre-ground coffee compartment that many machines have, providing dual chambers for different kinds of coffee beans is actually a great invention. Think: one for regular, one for decaf. To avoid misunderstandings, I want to quickly clarify the difference between bean containers, bean holders and bean chambers. Bean containers and bean holders are the same thing. The one that is different is the bean chamber. 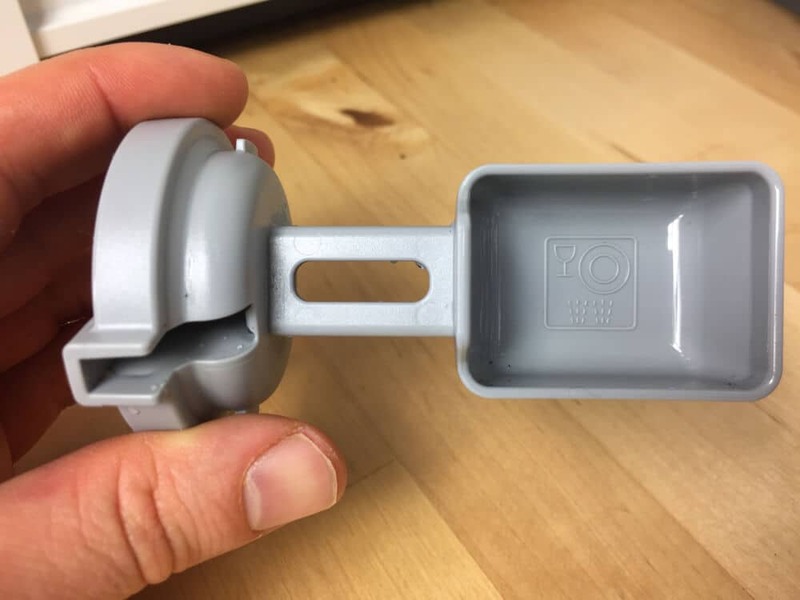 Most dual bean containers or holders actually have two chambers. 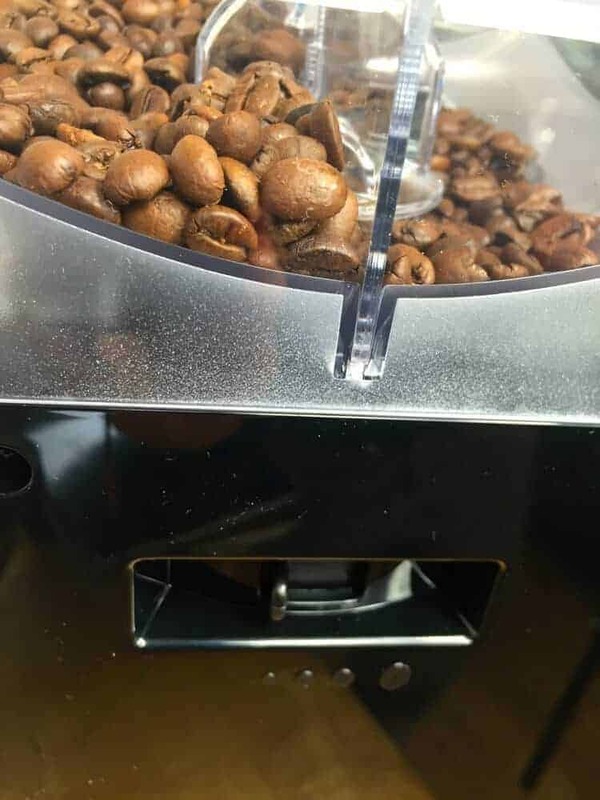 A panel divides the two kinds of beans, but they still drop into the same grinder. Depending on what bean you select, the machine opens one chamber or the other. It’s a completely different case when a machine has not only two chambers, but also two completely separated containers. Some of those machines even have two grinders, but they are the exception and are quite expensive. We at Coffeeness have looked closely at several machines with two chambers and a single grinder, and they were really great. The mid-range Melitta Caffeo CI has a bean holder with an airtight lid. (Bravo!) The holder has a panel that divides the beans into two chambers, and the grinder is centered under the bean holder. You use a switch on the front of the bean holder to choose which coffee you want to use. This switch also closes the chamber for the beans you don’t want to use. The only problem is that a bit of the most recently used coffee always remains in the grinder. It is almost unavoidable. This can quickly become a bigger problem if you have an intolerance for caffeine. This is why you should always make at least one espresso after you switch beans. That way, it will clear out the system, and you can be sure that the next espresso you make after that will only use the beans that you want. The Melitta Caffeo Barista has already come up with a better solution to this problem – it grinds just the right amount of beans you need for a serving. Since it only uses exactly that amount, you don’t need to make an extra espresso to clear out the grinder. This Melitta machine also has “automatic bean select” – you can designate each chamber for a different kind of bean, like a light roast and a dark roast, for example. The chamber lids are labeled with the kind of bean in each. Of course, you can also trick the machine so that each chamber uses espresso roasts – that’s what I did! If you want one of the chambers to be decaf, simply manually choose which chamber the machine should use. You can still choose the beans manually even if you already set up the “automatic bean select.” Thanks, Melitta. 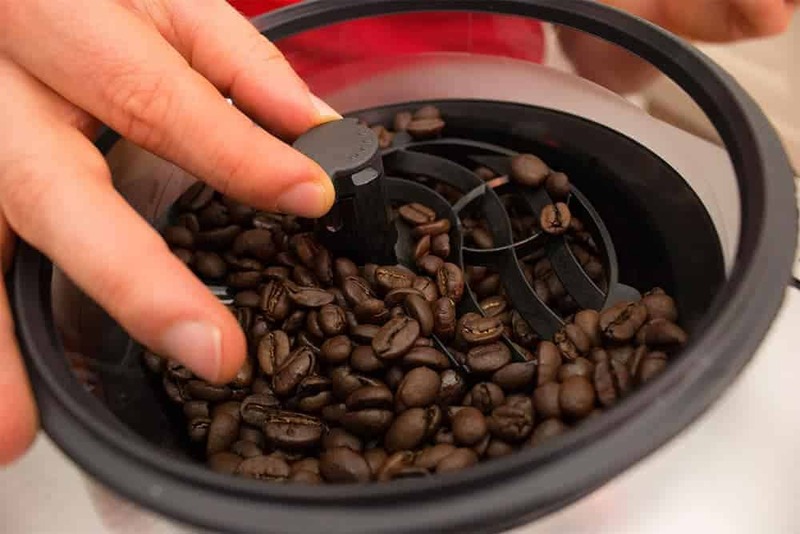 The “automatic bean select” option is perfect for coffee fans who have an intolerance to caffeine, as it doesn’t mix the ground coffee at all, and you can also set a different grind coarseness level for each chamber. 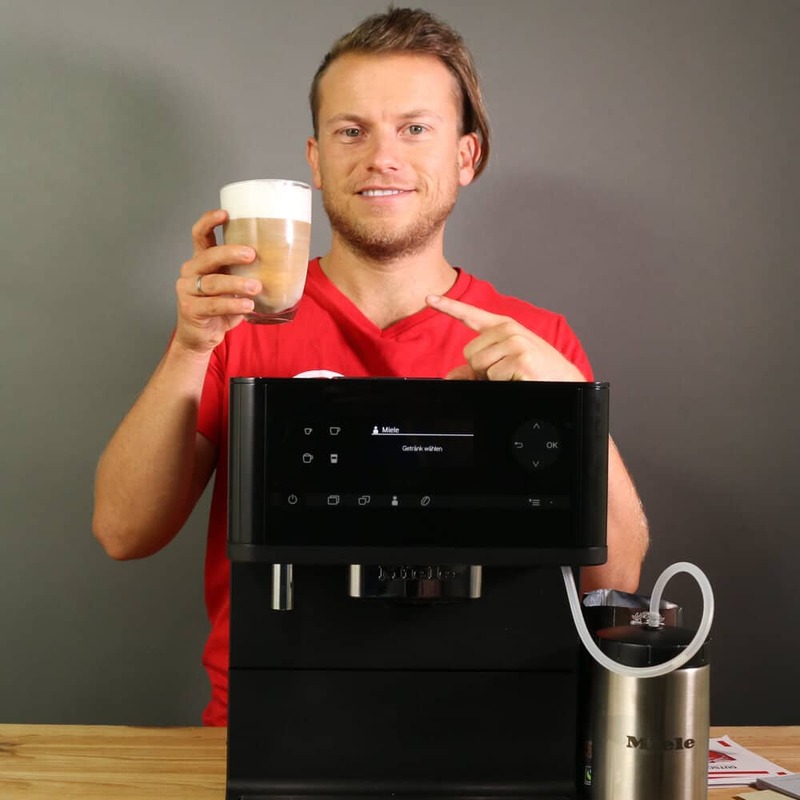 It is especially cool how you can program it to make your favorite drink and use your preferred bean chamber, and then save it all to your user profile. The display guides you seamlessly through the settings. Additionally, if you have a visitor and none of your saved coffee drinks sound quite right, you can still manually choose the grind coarseness and the bean chamber. 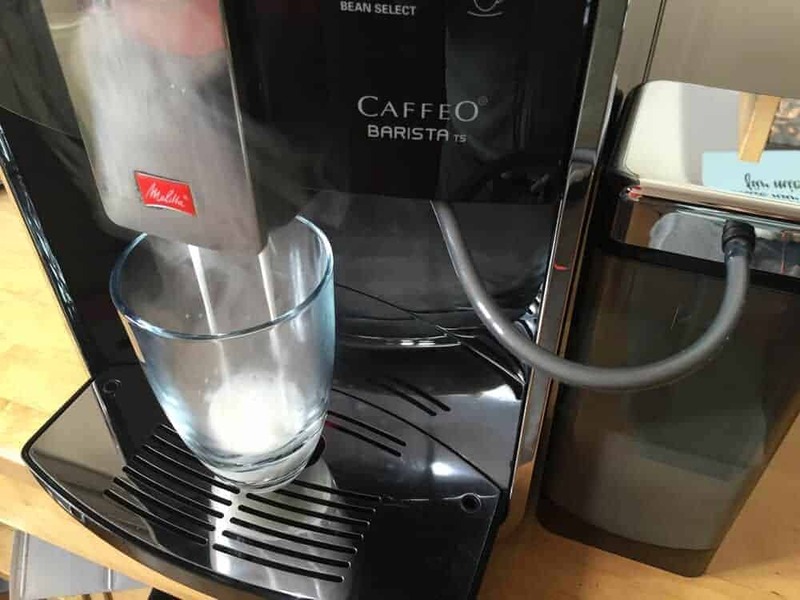 I should also mention the Saeco Molio – even though it is generally only available second-hand – because it represents a third approach: You can completely remove and switch out the whole bean container on this machine. 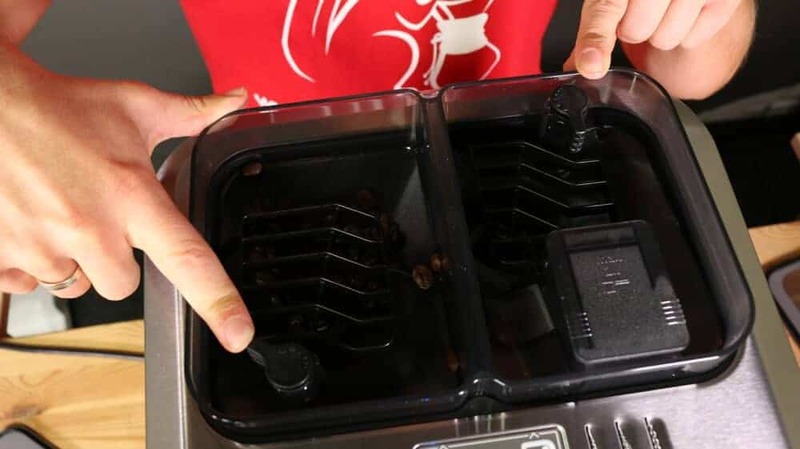 This is handy not only when it comes to cleaning, but also because it makes it easier to store the beans. Imagine, for example, that you are going on vacation and want to properly store the beans for that time. All you need to do is to remove the bean container and pour it out. It also makes it possible to switch in a different kind of bean, although it could actually be even easier to just buy a second bean holder from Saeco. 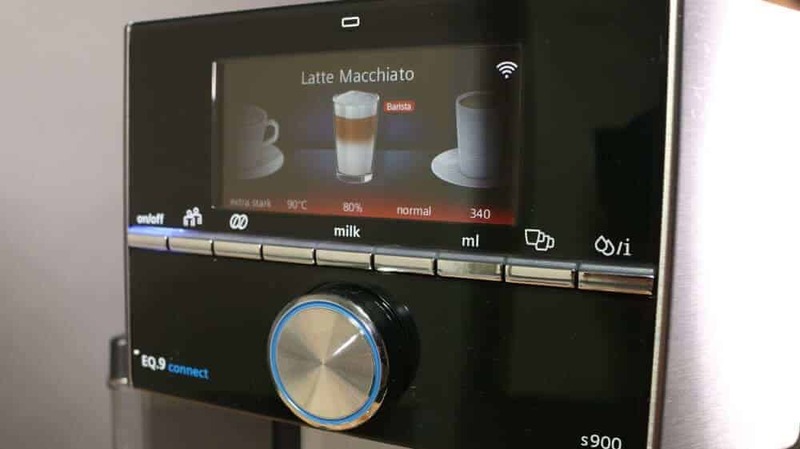 Coffeemakers are continually moving toward digitalization in an attempt to become an important part of your smart kitchen. 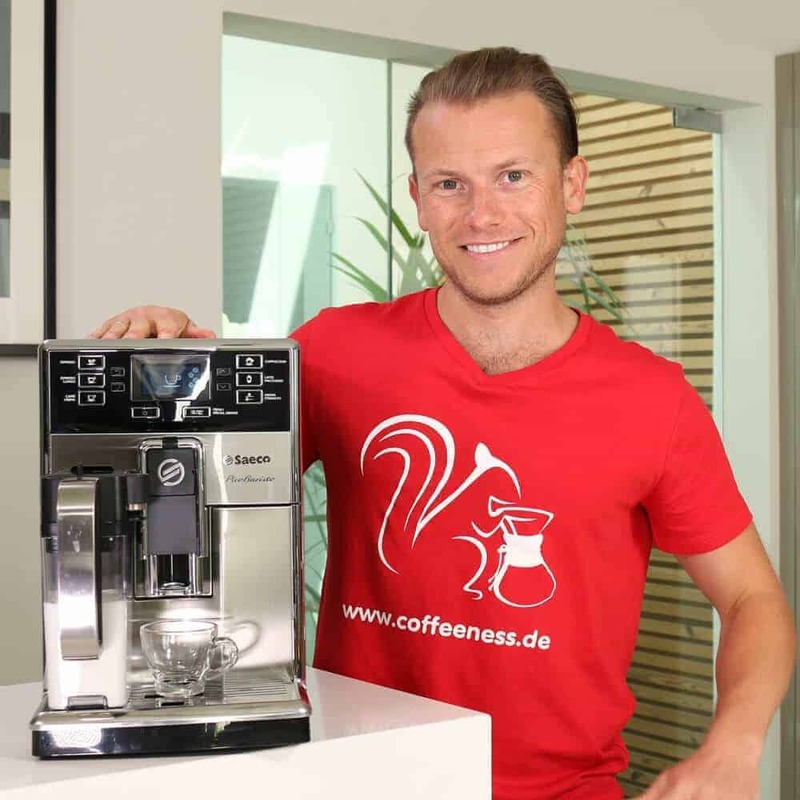 The PR guy from Saeco at the 2017 IFA emphasized that app-based controls are probably just the beginning of espresso machine digitalization. That is presumably why the Saeco Xelsis has gone without an app and instead given the machine a large touchscreen. Not dumb at all. After all, even if you have an app for your machine, you will still need to actually walk over to it and put a cup under the spout. As long as you are there, you might as well take care of the rest of the controls. At least that is how Saeco sees it. Other manufacturers, on the other hand, are turning to apps that can control all the same settings you would get from the display, but just moving them to a tablet or cellphone. That way, you can order up a latte from the comfort of your couch. Even the manufacturers realize that these apps are basically a neat gimmick that can help draw in tech nuts. There is a reason that most models with apps also are available without the app. If you do want a connection to your smartphone, you will usually have to pay at least $200 more. Manufacturers can potentially use apps to collect data. Coffee drinkers are a very lucrative target audience for marketers. You can’t use apps to adjust some super-important options, like grind coarseness. These apps make it seem like you need to buy all your kitchen appliances from a single manufacturer. You can, of course, but who cares if your espresso machine can’t chat with your stove? Apps only offer their own brand’s cleaner and other products. One click and you ordered it. However, third-party vendors are cheaper! 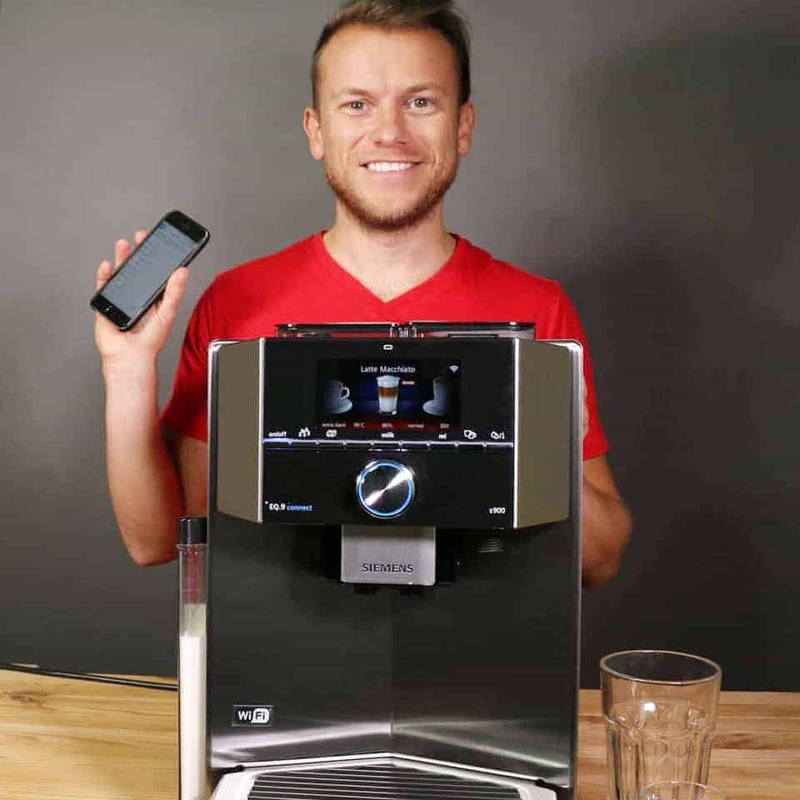 The Saeco GranBaristo Avanti was the first widely-available automatic espresso machine that you can control with an app. It is basically the luxury version of the more “prudent” Gaggia Anima Prestige. Even though it has been a long time since the GranBaristo Avanti launched, it still costs a good $1,500 or so. That’s not just because of the app, of course – you will also get an all-around high-quality model that is also exceptionally compact. 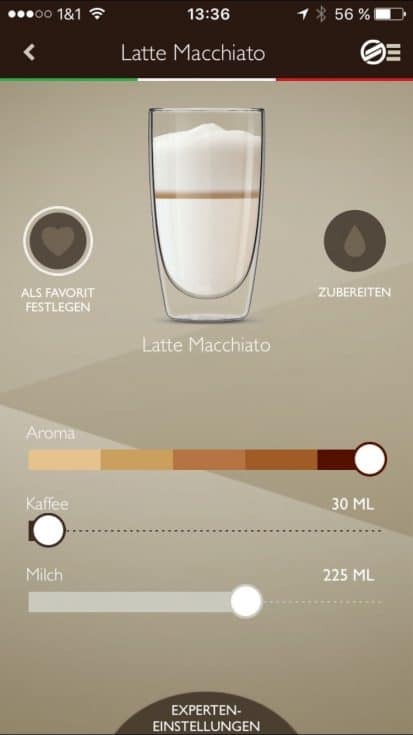 The app, called “Saeco Avanti Espresso Machine,” is very well made and will help you do things like adjusting the espresso and milk amounts very precisely. You can also quickly access the owner’s manual and the help menu. 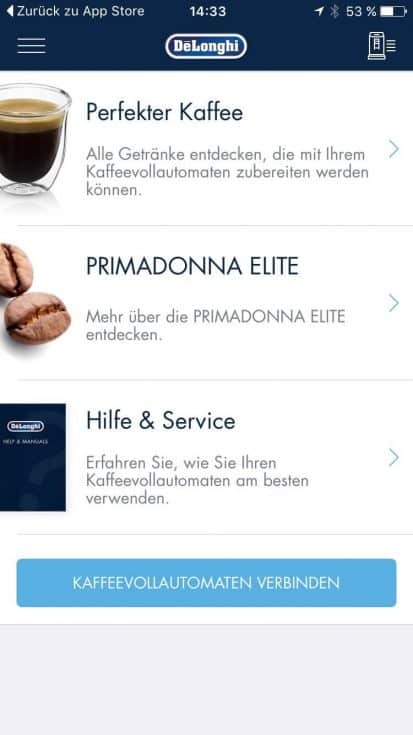 Siemens was pretty clever by making it so that you can only use the app to order certain drinks from the “coffee world.” Obviously, this is meant to tempt you into using the app controls. 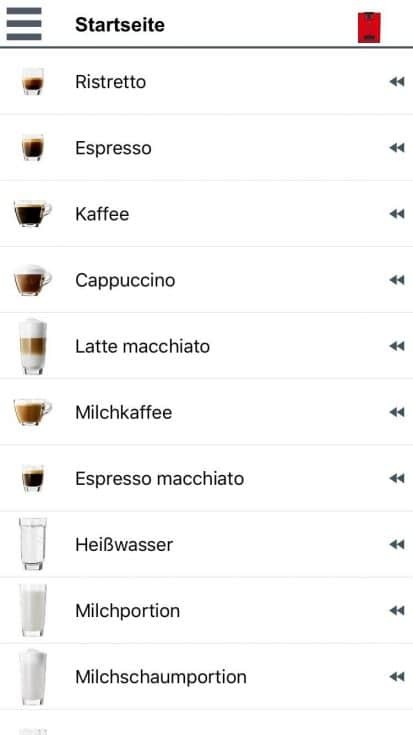 You can also use the “EQ.9 Connect Coffee Playlist” to program in a series of drinks. That can quickly go wrong if you happen to forget to change the cup, though. 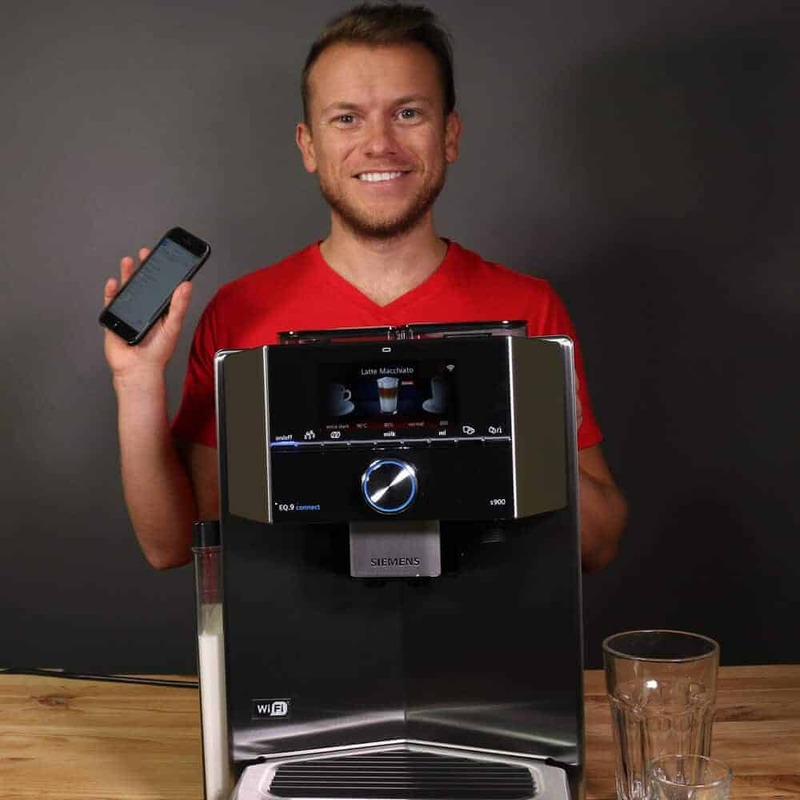 The Jura Z6 lets you attach a “Smart Connect” Bluetooth sender so that the automatic espresso machine can communicate with your cellphone or tablet. The control options are essentially the same as other apps. I can’t say much else about this machine that costs nearly $3,000 (!) because Jura isn’t a big fan of independent testing. I wasn’t really itching to test this machine again, anyhow. DeLonghi also makes automatic espresso machines with app-based controls, such as the DeLonghi PrimaDonna Elite ECAM 656.75.MS, a rather expensive machine. The app makes a good impression and works without any issues. We tried out the whole thing at the 2016 IFA consumer goods fair. You will have basically limitless options to personalize everything if you use the app. Here at Coffeeness, I intentionally don’t talk about this special category because it probably doesn’t interest many of you. Built-in espresso machines – which are permanently installed your kitchen – are in a class of their own. They are only for people who value design consistency and uniformity above all else. Look good (high quality, with lots of stainless steel). Match the rest of your kitchen. Have a permanent water connection. Cost even more if something breaks. Replacement parts for them are usually hard to find. Are stuck in one place. The big brands like WMF, Miele, Siemens, Bosch, Neff and AEG all offer built-in models. There are also very customized versions for catering use, but you definitely will not get one for less than $1,200 or so. 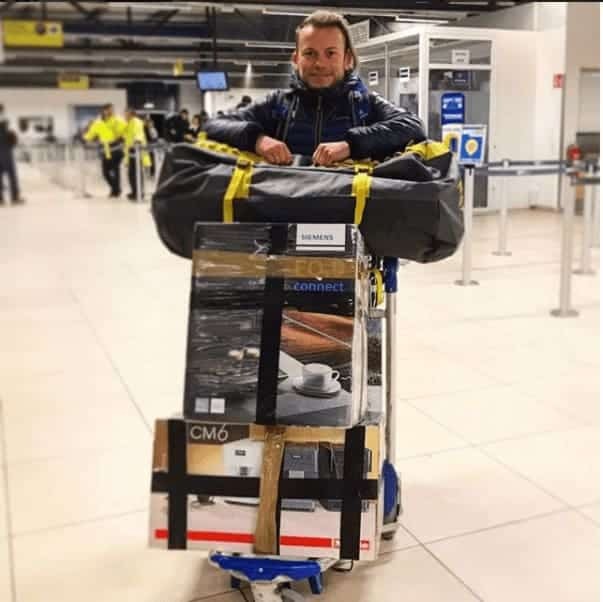 I have also heard many reports from people who bought these machines and weren’t satisfied – and it’s difficult to get rid of one if you don’t like it. Because they are built-in. I therefore recommend to anyone who is on the fence to go with a significantly cheaper “mobile” machine – they can also be quite chic and space-saving. 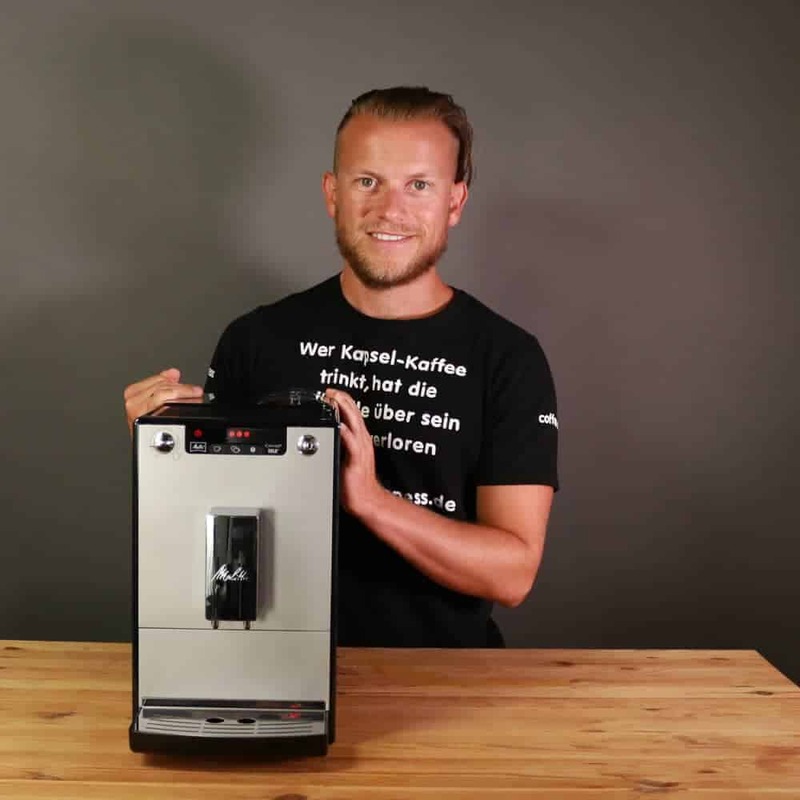 How Does Coffeeness Test and Review Automatic Espresso Machines? If you are wondering what makes Coffeeness’ reviews so different from other testing organizations, you will find all the answers to your questions here. The essential point for us is that reviews need to be transparent and user-friendly. That is why we pay attention to many things that other “official” reviews usually miss. I exclusively use good, fresh espresso beans from small roasters for my tests. I generally mention which roaster I use because I don’t have any strong preference for any specific roaster. I also always make a fresh espresso with a La Pavoni manual lever espresso machine and use it for comparison. This manual machine is basically the polar opposite of a super-automatic espresso machine because it makes you do everything by hand. If a very complicated manual machine can make a great espresso, then an automatic espresso machine should be able to do it a thousand times easier. I am actually known for being a purist – I usually drink my coffee and espresso without milk. However, I also love a good cappuccino, caffe latte or flat white. You all have always been quick to complain when I forget to mention milk drinks in my reviews and when I obsess about pure espressos – and you are right! In any case, I only use whole milk for my tests, as it has a good amount of fat. What drinks can this automatic espresso machine make? Well, the list of drinks just keeps getting longer. Flat whites and ristrettos are now “in,” while cappuccinos are “out.” I do what I can to thoroughly test whether each drink is worthy of its name. The claims can vary widely, but the results are rarely perfect. How good is the espresso? Of course, it is also important to take the different settings into account. How and how much can you adjust the grind coarseness? Can I adjust the temperature? 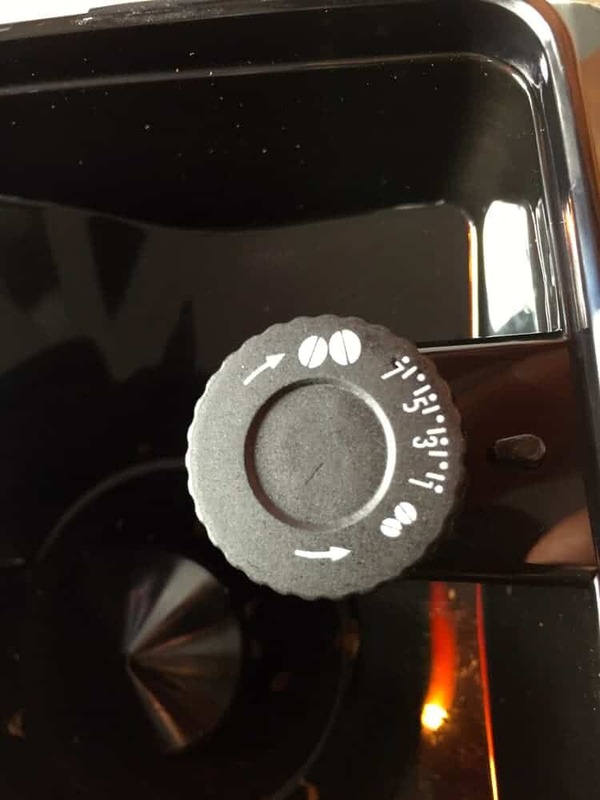 Can I directly or indirectly affect the flow time of the water through the espresso puck? How good is the milk foam? After espresso quality, the next deciding factor is the milk foam quality. It should be fine and uniform. The milk can’t get too hot, otherwise it will become denatured and taste bad. For most cappuccino makers, the quality of the milk foam is either its greatest weakness or its most noticeable strength. That is why I’m always excited to see how the milk and the milk foam turn out. What do I think of the design and the size of the automatic espresso machine? Careful, this part gets a bit superficial. Obviously, when I look at the build quality and materials of a machine and rate its appearance, it is based on my own tastes. I generally think plastic looks less classy than stainless steel. I also think that an espresso machine should not be too huge. The whole thing just has to look right. What about cleaning and filtration? Later in this article I will give more detailed tips for cleaning automatic espresso machines. However, does your machine’s manufacturer make it easy for you? One important point for me is whether the brewing unit is removable for easy cleaning. Also, how does the cleaning program work, and how easy is it to clean and disinfect the machine? Even though other factors might seem more interesting, remember: Hygiene is one the most important test criteria for cappuccino makers! Usability is an important factor for automatic espresso machines. Anyone should be able to prepare a drink without having to look at the manual. Several factors influence whether that is possible: How intuitive is the user interface (buttons or display)? How easy is it to choose a drink? How easy is it to refill water or coffee beans, and how do you empty the catch tray for the used coffee grounds? What kind of technology has it got under the hood? What kind of grinder does it have? How does it work? How can you adjust it? How does it filter water? What kind of brewing unit does it have, and is it removable? What kind of pump does it have, and how much pressure does it use? How large is the display, and is it a touchscreen? How large is the water tank? Shipping also isn’t that important in my rating because logistics have gotten so good these days that everything generally arrives quickly and on time. However, many people are concerned about buying an espresso machine or an automatic machine in winter because of the freezing temperatures. Sometimes deliveries can arrive completely frozen, so it is actually reasonable to wonder if your machine might get damaged in shipping. I don’t think there is much danger if you are getting a new, unused machine. As long as there is no water inside the machine, it can’t freeze and expand, which would damage the machine’s inner workings. So nothing should keep you from ordering a new automatic espresso machine for Christmas. However, things are a bit different with used machines. You will want to avoid ordering a used machine when there are freezing temperatures. It is also a good idea to plan your order so that there are no holidays or Sundays between ordering and delivery. Those are the days when it is more likely for packages to be stored in unheated areas. However, none of these shipping issues are deciding factors in my tests. I know, I know. Lots of you just don’t want to do it. However, I love to repeat my mantra: Good, thorough cleaning is an absolute requirement for a properly-functioning coffeemaker to make good coffee! You should pay attention to care and cleaning from the get-go. Unfortunately, many users only start cleaning when something does not work right anymore or when something starts to taste bad. By then it is too late! I’m not trying to give you a sermon – your manual will tell you how to properly clean your machine anyhow. Instead, I want to summarize the most important tips and clarify common questions about cleaning and maintenance. Cleaning Automatic Espresso Machines – Why So Fussy? Manufacturers recommend very different cleaning schedules. If you use your machine daily, you should clean it thoroughly at least once a week. By “thoroughly,” I mean to wash it all out with cleaner in addition to all the other daily cleanings. Yes, I’m fussy about cleaning. I clean my automatic espresso machine every day that I use it. Sure, the video is sensational and tries to put the manufacturers of automatic espresso machines through the ringer. However, I think it is a great cautionary tale to help you understand what happens if you don’t properly clean your machine. I also think that if you clean your machine regularly and properly, it won’t have a chance to grow mold. 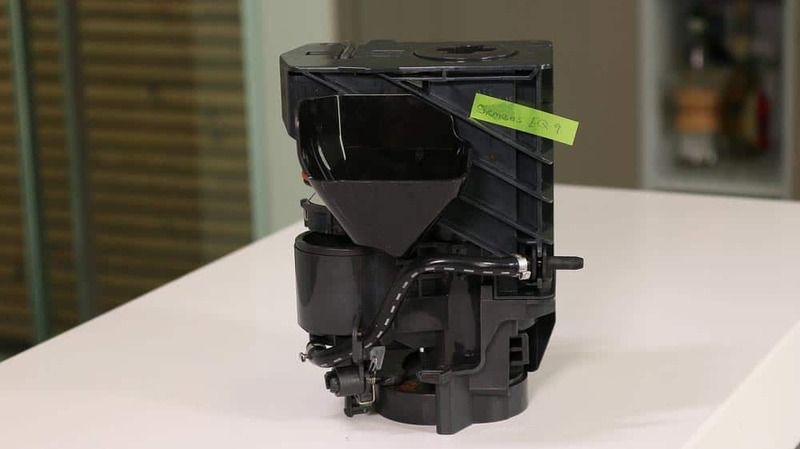 Espresso machines are vulnerable to mold, but you can avoid it through maintenance and cleaning. Even though you should regularly use your machine’s cleaning program, it is not enough! 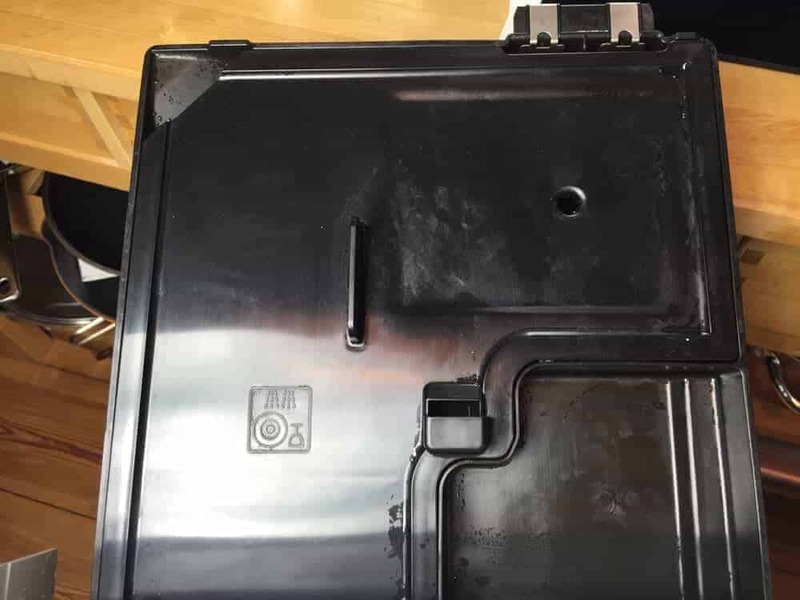 I remove my machine’s brewing unit every day and rinse it out well under hot running water; That way I don’t have to use cleaner on it, and I also avoid scratches. Very important: Non-removable brewing units are only (partially) acceptable if everything else on the machine is otherwise very high quality. So if you want a machine with a built-in brewing unit (for whatever reason), you will have to pay more and pay close attention to quality. The Krups EA8108 is an excellent bad example. Same with the Krups EA8808. It does not mean that everything is always sunshine and rainbows if you have a removable brewing unit. 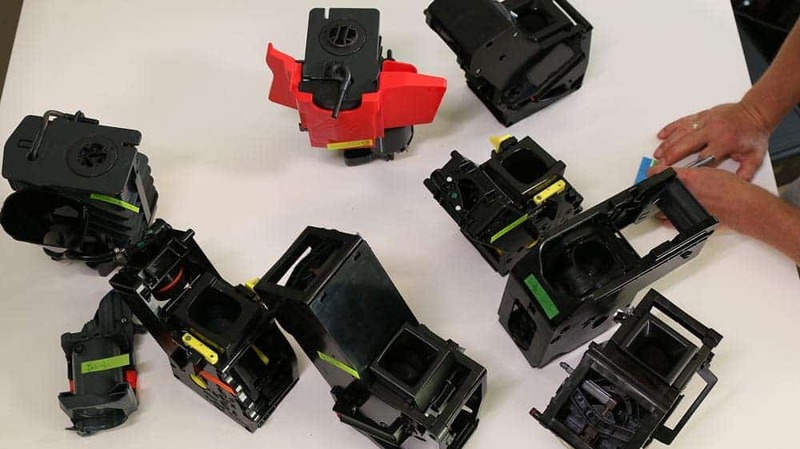 Many units in cheaper machines – like in the DeLonghi ECAM series, for example – can seem almost disposable: lots of plastic, not much quality. That means you need to be especially careful when cleaning, removing and putting back the brewing unit so it does not get busted. The bean containers often get left out of the cleaning routine. Remember: Coffee and espresso beans can be quite oily, depending on their roast and origin. That oil can accumulate in the container and become rancid after a while. It makes it easier to clean the container regularly. The beans won’t be heated as often. It makes it easier to switch between different roasts. Once the container is empty, cleaning it is simple. I just wipe it out with a dry cloth. Coffee absorbs all scents and tastes, so I would recommend not using any kind of chemical cleaning products. I have often seen people (even people who work in food services) spray tons of glass cleaner (or worse) into the containers – that is a catastrophe for me and for every other coffee gourmand! This is less of a problem. Most of these coffeemakers let you know when these trays are full. Depending on the model, that can happen sooner or later. I would clean both of these parts daily, even if the machine doesn’t tell me to. You can use cleaning products if you want – it doesn’t matter here. You won’t have any problems with coffee residue here, but instead you will have to deal with algae and other nasty junk. Every time before you refill the tank, I recommend that you rinse it out with hot water and let it dry. Then fill it up with fresh, cold tap water and let it rip! It is usually easier than you might imagine to take apart the grinder. Many grinders have click-and-turn mechanisms that let you separate them into large parts, which makes them easier to clean. 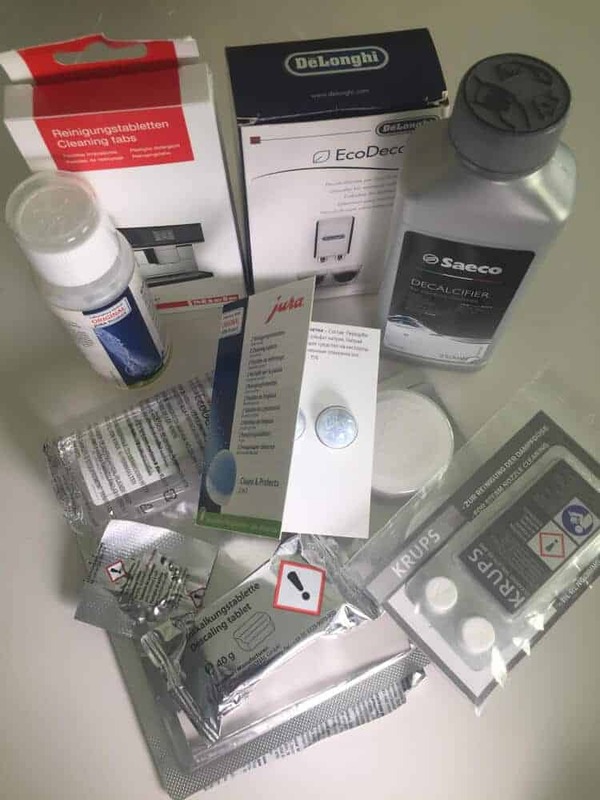 Cleaning tablets are a mechanical solution, but they don’t replace manual cleaning. However, this isn’t something that you need to do every day. Once or twice a month is enough for intensive use (in an average household). If you feel like tinkering around any deeper, you run the risk of voiding your warranty. Still, it can often be very rewarding – as long as you know what you are doing! What Cleaner Should I Use for an Automatic Espresso Machine? 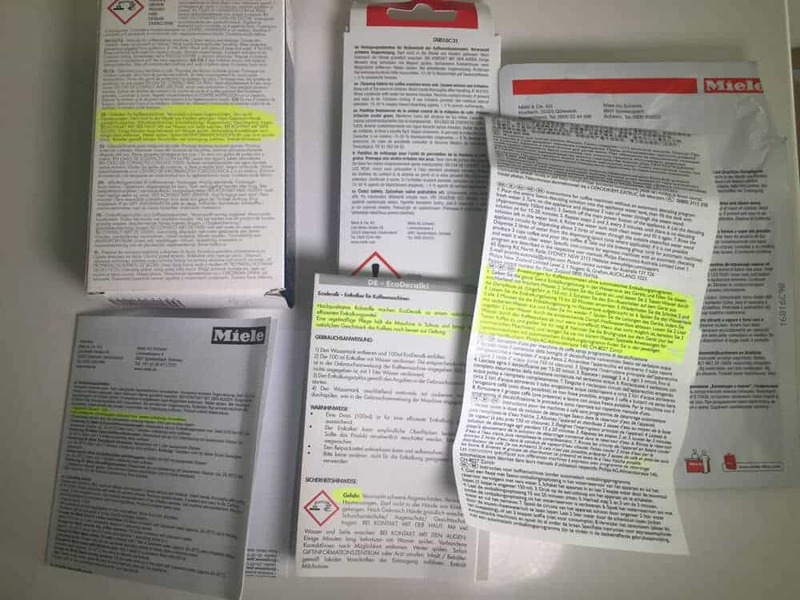 Don’t make your life difficult: Use the products that the manufacturer recommends, or the cheap alternatives that have the exact same composition as the name brand products. The manufacturers know what’s up, and you should too. I would generally recommend against using household cleaning products if you don’t know exactly what is in them. Something like lemon juice can work wonders for an electric water kettle, but it is much too aggressive for some models. I have already explained that you should set your water hardness in the machine’s settings. This is because every time the machine heats up, the water releases calcium. The harder the water, the higher the calcium content – and the quicker the calcium accumulates, which can block the machine’s inner mechanics. There are actually (cheap) cappuccino makers that don’t have a decalcifying program. In that case, you would have to decide for yourself how often to decalcify, based on your water hardness. I would recommend that you do it at least once a month. When it comes to choosing decalcifying products, I would give the same advice as when choosing a cleaner: Follow the manufacturer’s recommendation (especially regarding the type of product), but feel free to go with a cheaper brand if it is otherwise identical. Many automatic espresso machines include an installed filter, or at least the option to install one. These filters essentially work like a classic Brita filter, but it is not completely integrated into the machine. The filter reduces the water hardness to “level 1,” based on the scale mentioned previously. How does that affect filtration and decalcification? If you already have soft water, a filter is unnecessary. Filters reduce the calcium content of medium and hard water. A water filter won’t eliminate the need to decalcify, but will reduce the frequency it is needed. No matter what the manufacturer says, you should still decalcify at least four times per year. Using a water filter will also require you to make a few precise adjustments. You need to let the machine know that you are using a filter, and then set the water hardness as precisely as possible. In terms of costs, you need to change water filters regularly, which makes them far more expensive than decalcifying frequently. You still have to decalcify your cappuccino maker, even if you use a water filter! It is important to regularly grease the brewing unit so that the pressing and brewing mechanisms can move smoothly. Oil is important not only for the rails, but also for the hinges. If you clean your brewing unit daily, you should grease it once a month. The manual will usually tell you how to do that. The important thing is to use a silicon grease without any scent or taste. In other words, put away the oil can you use for your bike! Personally, I like the OKS 1110 multi-silicone oil. It is also nontoxic. Although I can’t answer every one of your comments right away, I still follow your lively discussions and questions, whether they are on the Coffeeness website, our Facebook page, our Facebook group or anywhere else. That’s why I wanted to include an FAQ section in this guide. I will try to update it regularly. I have waded through all the comments and posts and chosen a few interesting questions that come up very frequently, or which are so unique that I want to answer them so everyone can see. Are there any decent espresso machines for less than $200? Short answer: no. If you really want to be happy with your espresso, you need to spend more than $200. Delonghi’s machines are relatively cheap but still well built, and the espresso is great after some initial calibration. Is it true that Siemens machines often have temperature problems (especially with milk temperature)? That depends a bit on your perspective. 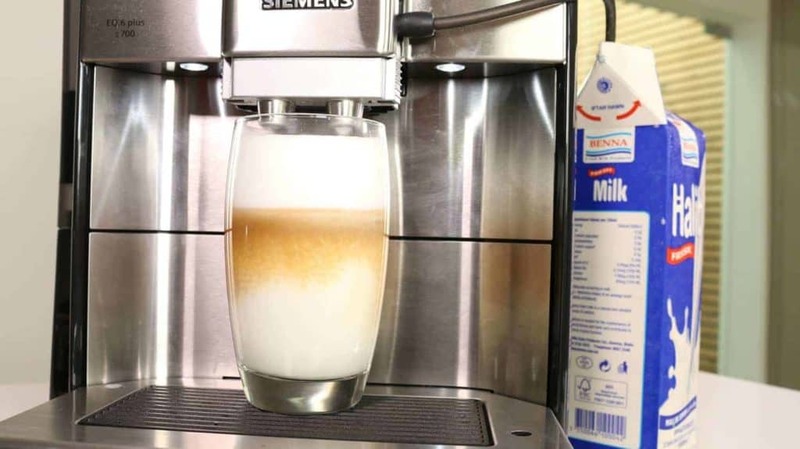 I prefer slightly cooler beverage temperatures when drinking something like a latte, so I actually think the drink temperature from a Siemens machine is pretty optimal. However, I also completely understand that people who like very hot milk often have problems with Siemens. It is worth it to lease an automatic espresso machine? Some Facebook users mentioned this idea, giving me an example of how you could get a Jura machine for 25 euros – about $30 – per month. At first glance, that seems really cheap. However, just as if you were going to buy a car, you really have to run the numbers: How long does the contract last? How many drinks will you make every day with the machine? How much is the machine worth? 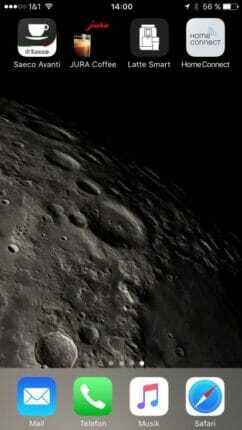 You can see already that there are too many ifs, ands, or buts to make it worthwhile for most private individuals. Can I buy a used cappuccino maker? In this article I have already talked extensively about how much cleaning and care automatic espresso machines require. Unfortunately, not everyone who owns one of these machine will read this article. Often, they clean and disinfect the machines poorly or not at all. Therefore: Please never buy a used machine. You never know what kind of mold, bacteria or other problems will come with it! Why does soy milk or other non-dairy alternatives become clumpy when I use it with my machine? Those are actually flakes, not clumps. They form when the temperature of the milk substitute and the temperature of the coffee don’t match. It is related to the special composition of plant-based milks. Interestingly, these “clumps” form most with drink mixes that contain sugar and other additives. Sugar-free alternatives rarely form clumps. Why does the milk system make a buzzing sound when I use non-dairy milk substitutes? There’s a relatively high chance that the some milk substitutes – especially homemade ones – can clog the complicated and delicate parts of your machine. That’s because these liquids often contain suspended solids. The whole machine can seize up, or just make really gross foam. That means that a machine with a steaming wand or a simple cappuccinatore system have a leg up because the milk has fewer curves and turns to move through. If you prefer to use a milk substitute when in the machine’s automatic mode, you have to be absolutely rigorous about cleaning. However, the Saeco Xelsis is an example of a machine that makes that cleaning pretty easy. If you are having trouble with your current machine, a good and cheap solution is to simply buy a stand-alone milk frother. Is there a maximum height for the spout? 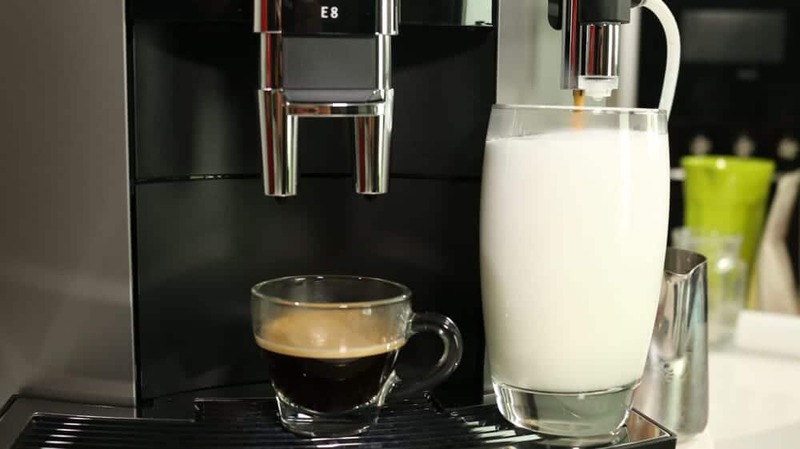 As part of my tests, I always use an IKEA glass because I know that many of you wonder if your latte glasses will fit under the spout of an automatic espresso machine. There is no universal maximum spout height. You can use 5.5-inch (14-centimeter) glasses with the Siemens EQ.6, for example. However, some cheaper machines have a significantly lower spout! What is the lifespan of an automatic espresso machine? Many of you have reported that your espresso machines have been working in your home kitchen for up to 17 years. I also believe that newer machines should be able to reach a proud, advanced age, even in today’s disposable consumer society. Of course, if you want yours to hold up, you will have to always care for it, and you will have to hope you don’t happen to get a lemon. In any case, it should last at least 10 years with proper care. Can I fix my automatic espresso machine? Can I do it myself? 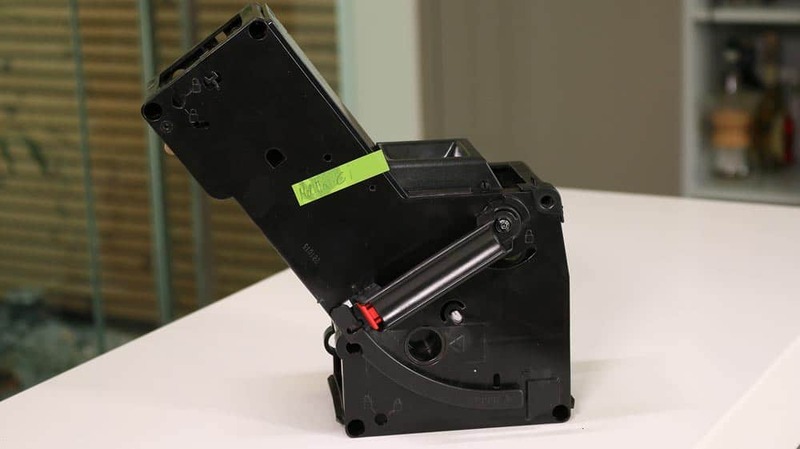 Depending on the manufacturer, there can be an amazing supply of replacement parts for your machine on sites like Amazon. That’s also how I gauge whether it is possible to repair the the issue or part: If you can get a replacement part, then do it, instead of buying a new machine! That even goes for things like the brewing unit. If the problem goes deeper, then I’m of two minds. If you have an especially expensive machine, it might be worth it to get it fixed by the pros. For cheap machines with lots of plastic and wear and tear, it might not be worth it. My tip: Don’t simply compare the price of a repair against the price of a new machine. Instead, take into consideration how long you have already used it, how intensively you have used it and how well you have cleaned it. Why doesn’t Coffeeness review any machines made by WMF? I have mentioned that I consider WMF to be a true food services institution. Many bakeries and convenience stores in Germany have machines made by WMF, and in my opinion, that’s where those machines belong. They are simply not competitive for at-home use in the current market. Their price-performance ratio is too poor, in my opinion. That is why I have never reviewed any of their machines. For an older example, the WMF 1000 pro S looks like a large microwave and doesn’t have any good reviews. For that same price, you will simply get a lot more from Miele or Siemens machine. 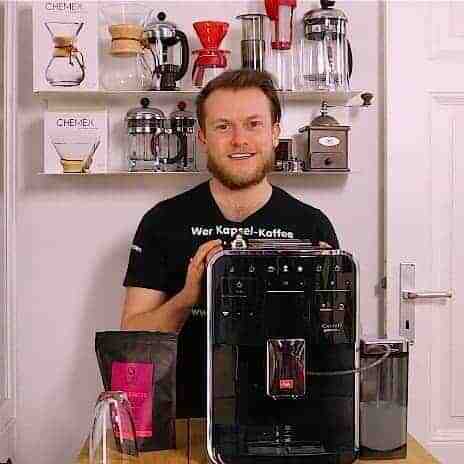 I also know that some of you – DIY types, for example – are big fans of WMF machines because they have two high-quality boilers and a grinder that are practically unbeatable. However, those kinds of commercial-focused machines aren’t really the kinds of things we focus on at Coffeeness. Why doesn’t Coffeeness review any machines made by Nivona? Nivona also has an image that is associated with food services, perhaps even more closely than WMF. However, I have tested Nivona machines for years because I think that, in this case, their translation from the professional-grade market to the consumer market has gone quite well. 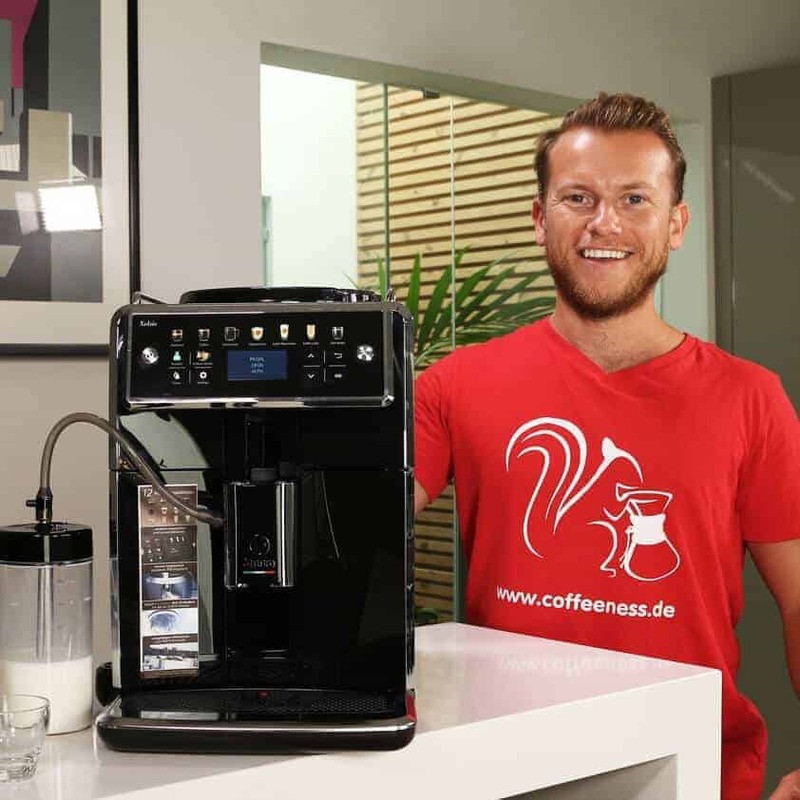 Still, many parts in Nivona machines are identical to ones in Miele machines, and Miele is significantly more well known – and of course they also show up on Coffeeness. Why does Coffeeness only review machines from a limited number of brands? 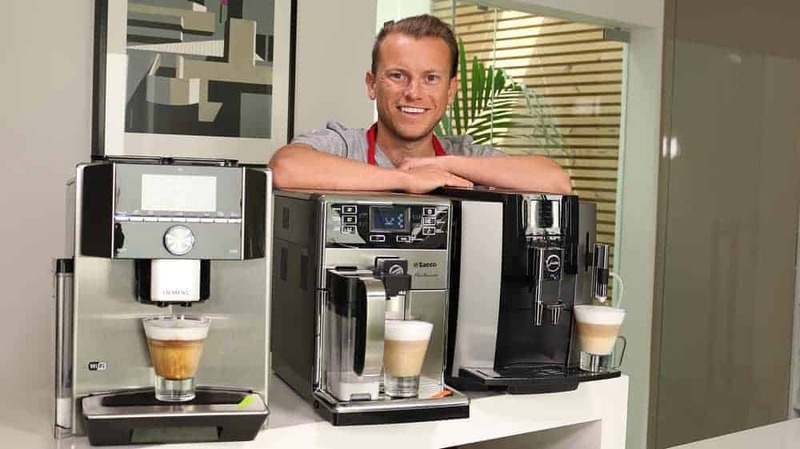 Miele, Melitta, Saeco, DeLonghi and Siemens play leading roles on Coffeeness. Jura is only starting to gain steam again, Krups has thus far completely failed to convince me, and Bosch has lost itself a bit in the market. These brands dominate the market for one reason: Their customers trust them most. That is also why I mainly review these brands. If I should ever happen to stumble on a special, yet “obscure” brand, or if lots of people request a review, then there is certainly nothing standing in the way of me including it in one of our reviews! 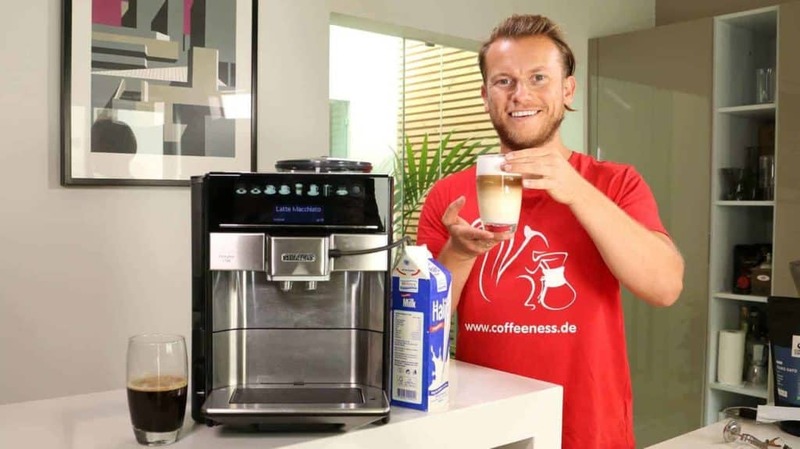 I don’t care about milk foam – which automatic espresso machine would Coffeeness recommend for me? To be completely honest, if you don’t need milk foam and otherwise have no clear opinions about coffee, then you only really have two options. You could either check out the Melitta Caffeo Solo review, or seriously ask yourself if you really need an automatic espresso machine. See the above list of questions you should ask yourself before buying one. If you are actually concerned about quality, then an espresso maker will probably be the more satisfying choice for you. 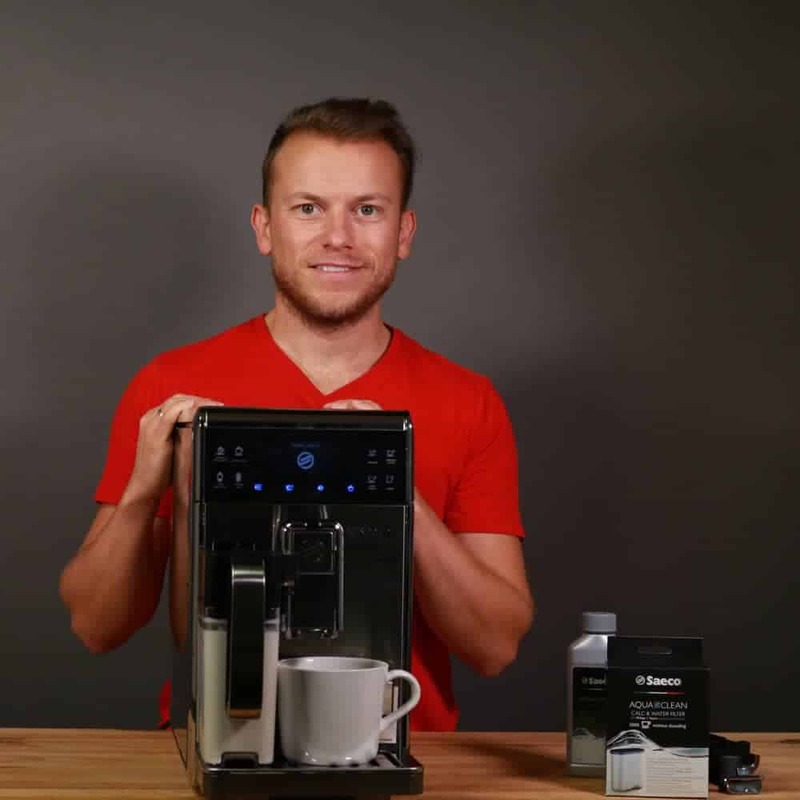 Can an automatic espresso machine make normal drip coffee? No. Drip coffee techniques and automatic espresso machines are completely different. If you want a middle-ground solution, then a coffeemaker with a grinder can be a good choice. Are there any machines that let you adjust the grinder digitally? No, that is not (yet) possible. A machine would have to use a separate, digitally-controllable motor that could move the discs or cone closer or farther apart. All the measuring devices, the sensors and other technology necessary to do that would mean that the machine would have to be gigantic. What’s more, it would shoot up the machine’s electricity usage, as well as its price. In the future, maybe there will be technological leaps in this area. Until then, the good old manual method is simply the more reasonable and more precise – and the only – option. I can’t seem to remove the brewing unit. What did I do wrong? As long as you don’t have a Krups or a Jura machine, you should normally be able to remove the brewing unit. If you can’t, the machine is probably not in the standby position. This usually happens if you unplug the machine or turn it off using the main switch, before the machine has a chance to shut down. In that case, the only option is to turn the machine on and off again using the normal button (the one for daily use), and then wait for a moment. If it is still stuck, then perhaps customer service can help you. Do I have to use the decalcifier from the same manufacturer as the machine? You don’t really have to do anything. Still, I often use the manufacturer’s products. I don’t have to worry about what they are made of, and if there is a problem, I can hold the manufacturer accountable. A Facebook user said it perfectly: “I’m not buying an expensive machine so that I can pointlessly save money by using cheap cleaner.” Amen! Which cappuccino machine makes a great flat white? None. At least not at the push of a button. You need milk “micro foam” for a flat white, and it is just luck if you happen to get that from an automatic milk frother. Even the cheaper models with steam wands are a little too weak to get it perfect. I think that, if you are a true flat white fanatic – but one who also would like other kinds of foamed milk – then you would do better using a traditional espresso machine with a portafilter. Who should get an automatic espresso machine with a steam wand? Anyone who actually wants a traditional espresso machine with a portafilter, but who doesn’t want to spend all that money. “True” automatic espresso machine buyers are looking for something practical and easy. In that sense, an automatic milk frothing system is practically unbeatable. My automatic espresso machine doesn’t come with a water filter. Do I need to buy one separately? I have talked a lot about water filters here on Coffeeness. 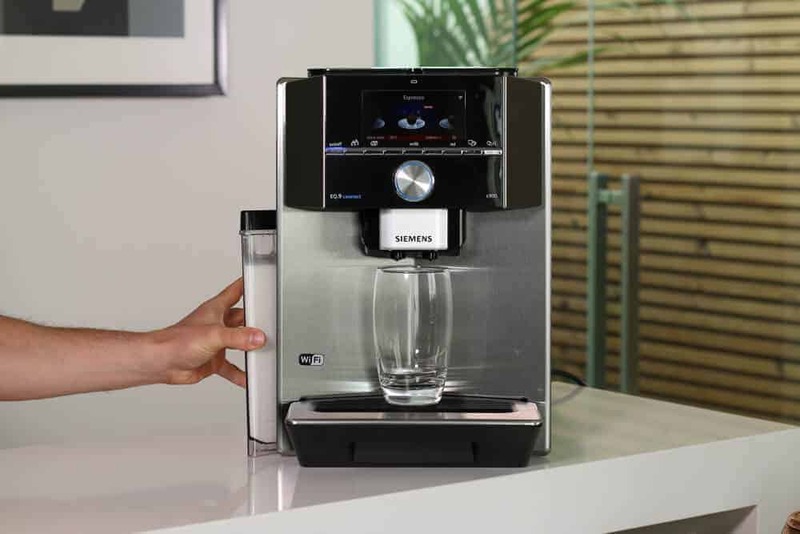 Generally, a water filter in an automatic espresso machine will let you decalcify the machine less frequently because the filter reduces the hardness of your water. If the calcium content of the water in your area is a problem, then it is not a deal-breaker if you don’t use a filter. Even in areas with high calcium levels, such as large cities, it is not absolutely necessary to use a water filter, as long as you are serious about regularly (and more frequently) decalcifying the machine. It also depends a bit on how carefully you will maintain your machine. I don’t see my question here. What can I do? This FAQ section is a growing work in progress. Plus, I can’t always answer your comments right away. 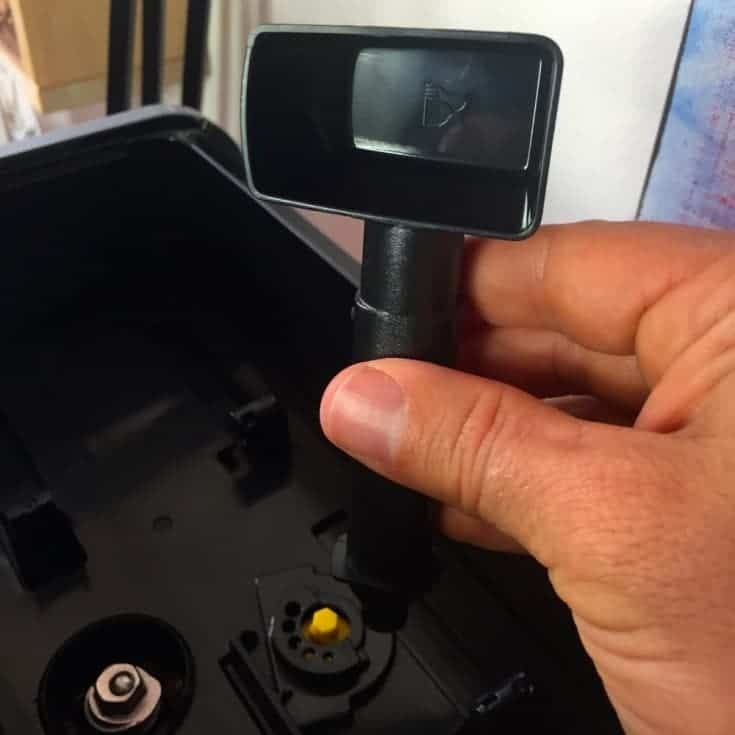 For anyone who has a question like (for example) – “Is model X better than model Y?” or “Which machine is right for me?”– then I can heartily recommend that you join our automatic espresso machine group on Facebook. The group is a very engaged community of users who discuss their experiences with specific models. Congratulations on your work. It has been really useful for me on my research to buy a superautomatic espresso machine. I have read your review for De’longhi ECAM 22.110 and ECAM 23.420. 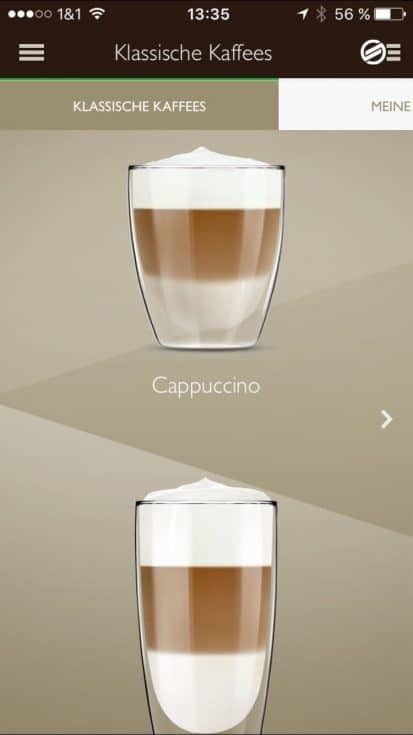 Apparently, they are the same apart from the capucchino maker and the display. But reading this article is obvious taht you consider the 22.110 a better choice. Do you recommend buying the 22.110 instead of the 23.420 considering that they are priced similarly in amazon Spain? I just purchased the Saeco Xelsis SM7685. When I make a milk drink there is a weird plastic/rubber taste. Have you heard of this issue before? I’m tempted to send it back. I had the Breville Oracle and just didn’t want to go to all the bother of steaming the milk separately but the coffee did taste better. Thank you for your comment. I would go for the price. The two machines are technically very similar. Do you want to have a display? If the ECAM 23.420 costs just a little more, I would buy it. Thank you for your comment. This is unfortunately normal for new machines. I would always pour the first drinks away and only drink after a few tries. I completely appreciate your thoroughness when it comes to all of the details of automatic espresso coffee machines. We are sending back our second Jura and are in the market for a new machine. I understand what happened with our machine after reading about the “self-cleaning” capacity. I would go with the Melitta Caffeo CI with the stainless steel frother cup, but it is not available in the US, at least not that I have found. We may end up purchasing from Germany although none of the companies want to ship the stainless steel milk container that can be bought separately. Now I am an informed consumer. I am grateful to you for all of your work and attention to detail . Better than “Consumer Reports” who were less than helpful on this topic. Hello, I presviously owned a Saeco Royal Coffee Bar Sup16 purched in 2005 til 2018 -loved it but can’t find a comparable machine. Bought a Gaggia Babila, frustrated at the number of times have to empty tray and add water. Looking at Saeco Royal HD 8930, just found out about it. But review of 3 stars on Amazon. What do you recommend? Don’t want to make another costly mistake. Please answer soon if possible. Hello Rolf, Thank you for this great comment!